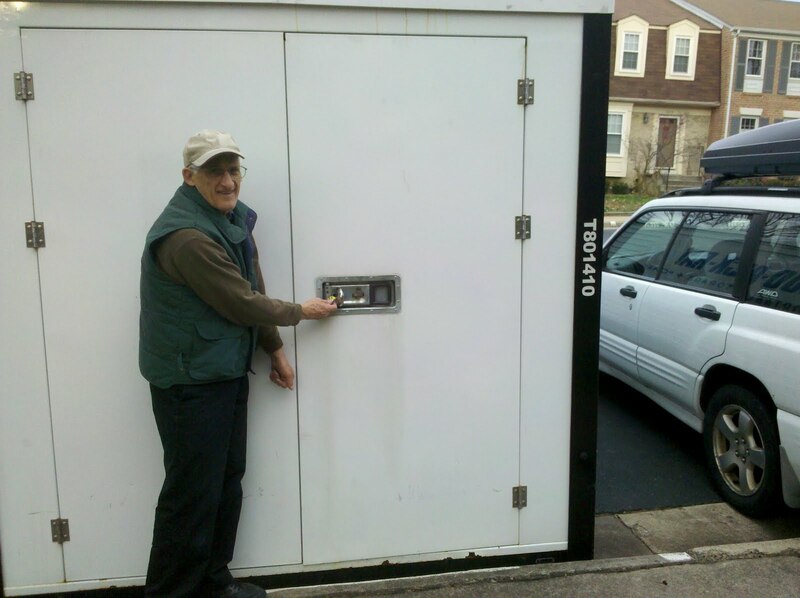 Today’s big event was the delivery of our portable storage container. 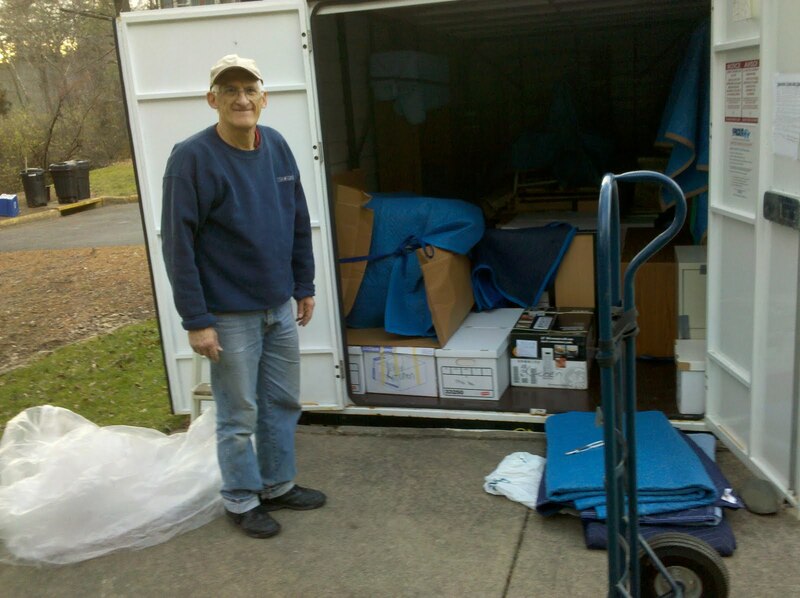 Lee has been hard at work for weeks sorting through books and papers, but now comes the real test when we figure out how to get everything out of the house and into the container. After you’ve lived in a house for 13 1/2 years you tend to accumulate way too much “stuff”. And one of us in the family is a bit of a pack rat. I think Lee is getting tired of hearing me tell people the story of how son Michael and I moved to Virginia from New Mexico in 1993, bringing with us only what we could fit into our 1989 Nissan Sentra. Everything else we owned was either sold, given away or trashed. To me, there is something very refreshing about stripping your possessions down to absolute essentials and then getting to start over again as you figure out what you really do need. Our goal is to be completely moved out before Christmas. 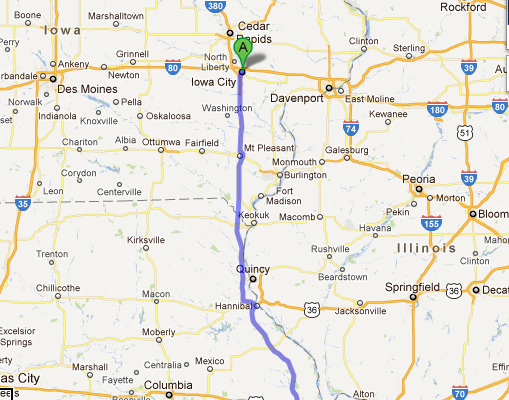 Then, depending on the weather, we hope to drive to Iowa for Christmas. 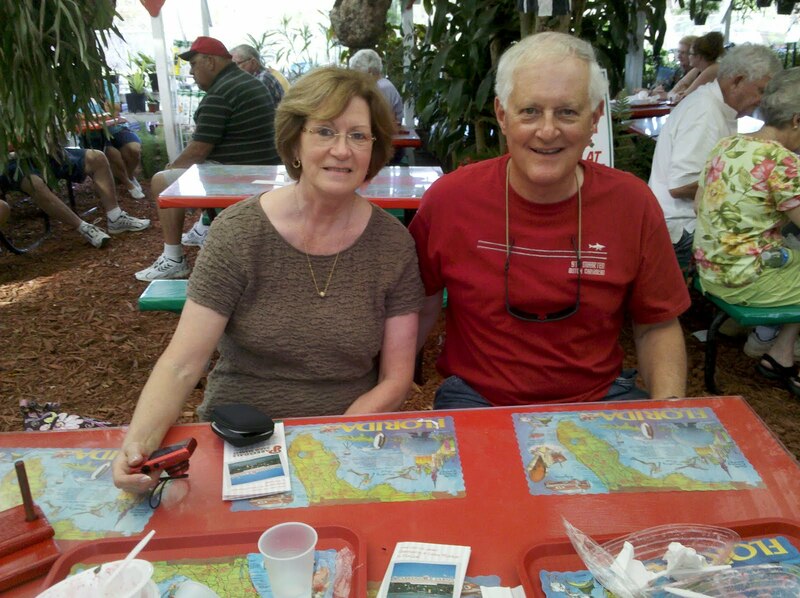 After spending some time with the grandkids we will then head to our Florida destination. If we don’t make the move-out date in time then we will head directly to Florida from here. My last day of work is Dec. 16 and then I will be able to devote more time to helping Lee. Probably the biggest help to Lee will be for me to stay out of his way! 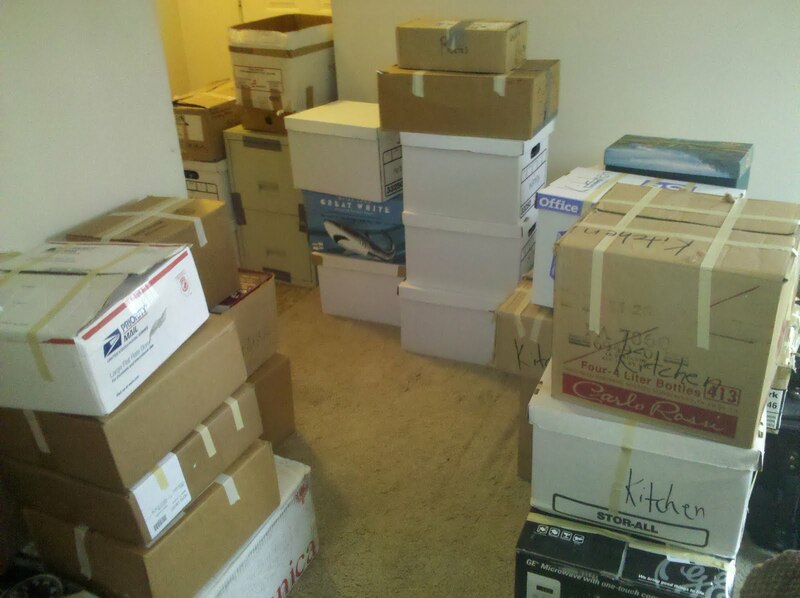 As you can see by the looks of just one corner of one room in the ground floor of our 3-level townhouse it will be a challenge to stuff all the “stuff” into the container. Most of the rooms don’t look like this, though, so there is hope. Let’s get packing and get this show on the road. 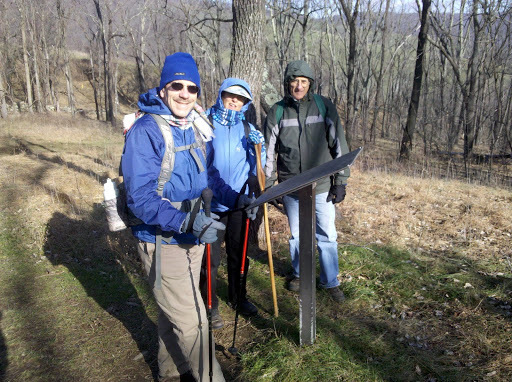 We took a break today from the moving and packing chores and enjoyed a hike at Sky Meadows State Park with our friends, Joe and Suzanne. Heidi, the dog, was able to come along, too. 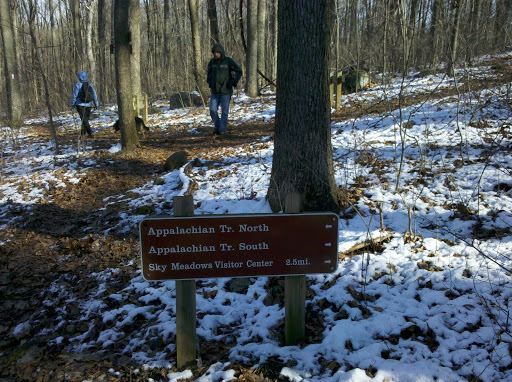 We were surprised to see snow on the ground as we climbed up the ridge into the woods. 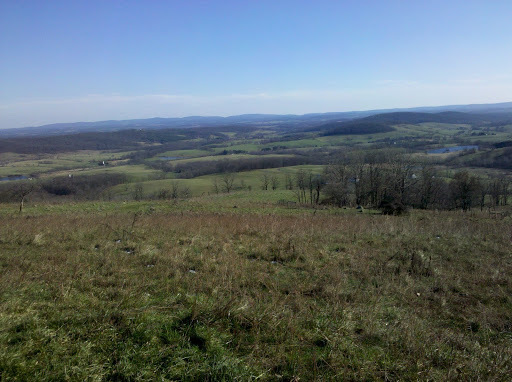 It was a bright, sunny day, perfect weather for hiking, as long as we kept moving. The lunch stop was a beautiful view but there was a cold wind coming over the ridge so we didn’t sit there for very long. 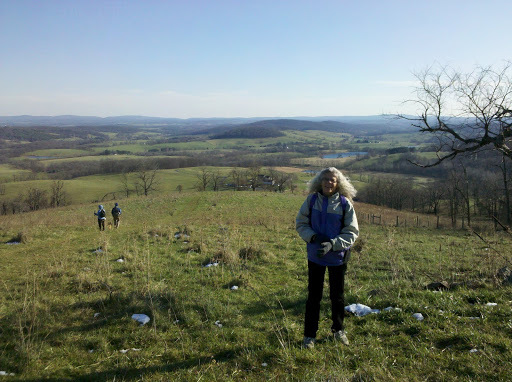 Over the years, Sky Meadows has been one of our favorite places to hike. The trails are an interesting variety of open meadows and forested ridges with good views and some climbing without being too strenous. It’s an easy drive, less than 50 miles from our house. We tried not to think about the fact that it may be a very long time before we see Sky Meadows again. We look forward to new and exciting places in the months ahead, but it’s always hard to say goodby to favorite places like Sky Meadows and good friends like Joe and Suzanne. We finally got the last bit of our “stuff” in the storage container this morning, ready for today’s pickup date that we had arranged 2 weeks ago when it was delivered. There were times that I had my doubts as I looked at everything that needed to go in there. Lee made trip after trip with piles of boxes from the house to the container and the amount that was left never seemed to diminish. Lee did most of the heavy lifting and rearranging and planning and measuring. Mostly I tried to stay out of the way and not be too critical. I had laid claim to the packing of the kitchen area, bathrooms, linen closet, and, of course, my clothes and personal belongings. 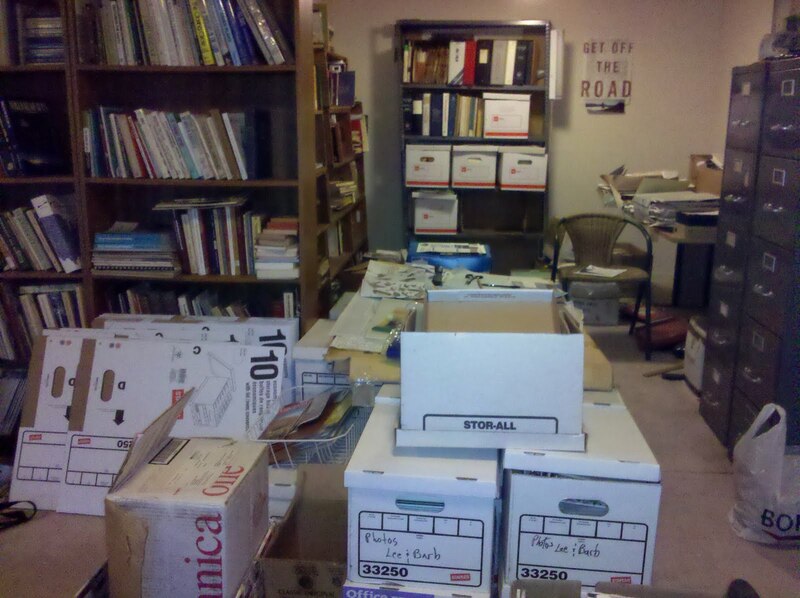 It amazed me how much accumulation a person has after 13 1/2 years in the same house. You think all of the things that you have put away in drawers and closets and cupboards are things that you really need. But then when you get everything out you realize how much of it can be discarded. You get so used to reaching for the same towels or sheet sets or spatulas that you don’t realize how worn out much of the stuff really is. When we do get settled down again I look forward to a fresh start. What a way to clean house. 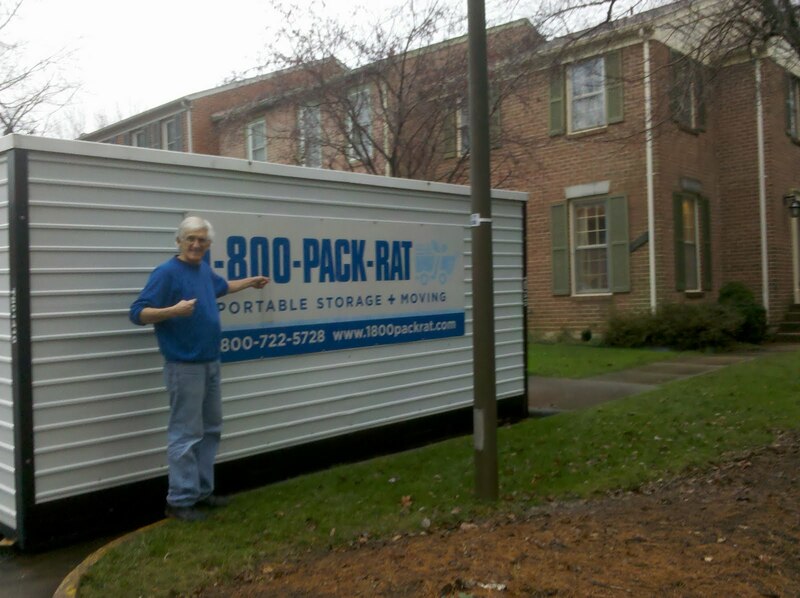 So, anyway, not knowing exactly when the Pack Rat truck would show up, we made sure that our first task this morning was to get the last of our things in there. Safely locked away and I wonder when we will see in there again. I spent a good part of the day anxiously waiting by the front window, jumping up whenever I heard a truck coming up the street. I didn’t want to miss out on this interesting operation, since I had been at work the day it was delivered. 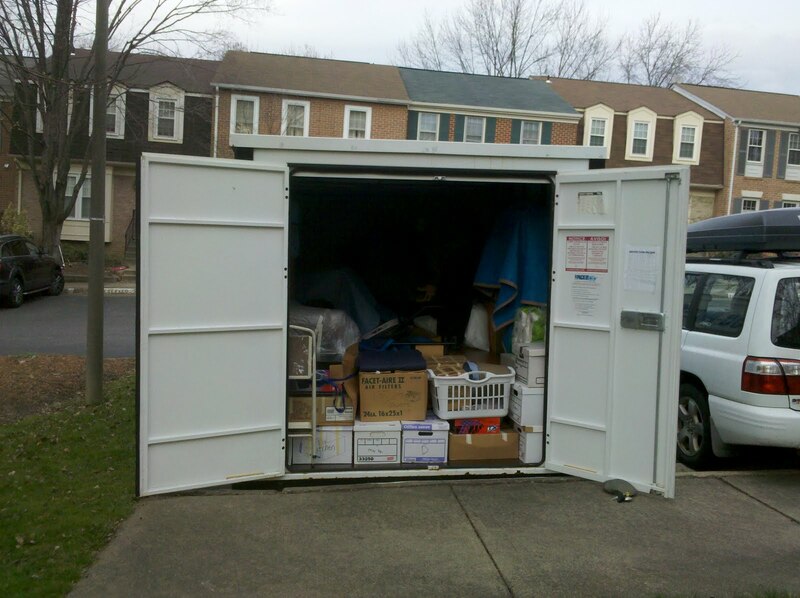 Finally, late in the afternoon, after Lee got home from a trip to Gaithersburg, Maryland, to donate a car full of books I resigned myself to the possibility of missing out on the pickup. I took the car to run a couple of errands and left Lee in charge of the camera to take pictures if I missed out. 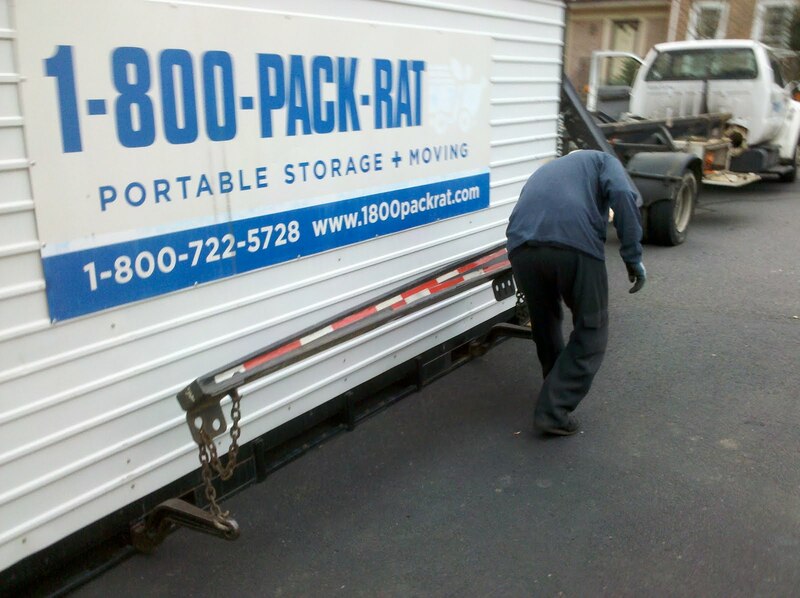 Perfect timing, though, as I arrived home Lee came out of the house to say that Pack Rat had called and would be there momentarily. 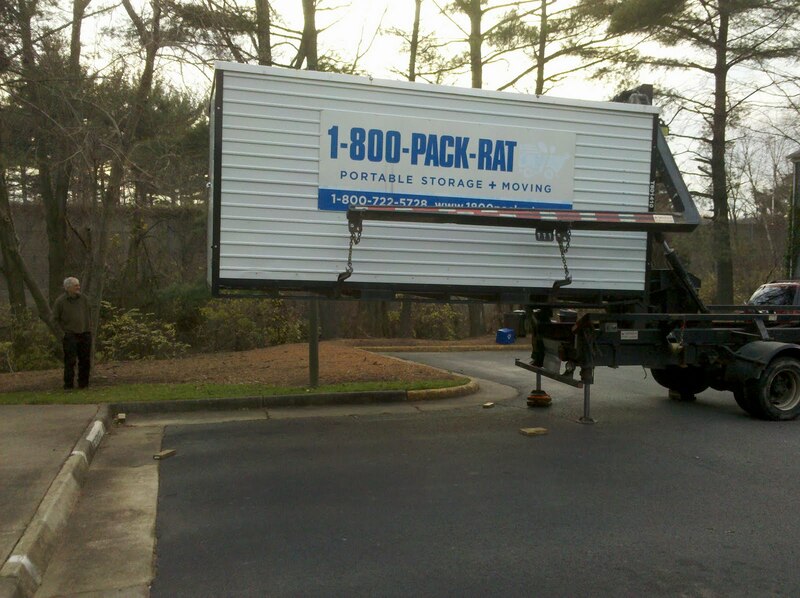 I had just enough time to get in position for pictures when there came the truck. It was quite interesting to watch the staging operation. As the driver got to the point of starting the engine that worked the lift on the back of the truck he encountered a temporary snag. The engine had a pull cord like a lawn mower but no matter how many times the driver yanked the cord, the engine wouldn’t start. He finally got assistance from Lee who drove our car to the side of the truck where the driver hooked up jumper cables and got the lift engine running. Two large metal arms extend out from the truck and are hooked up to levers underneath the storage container. 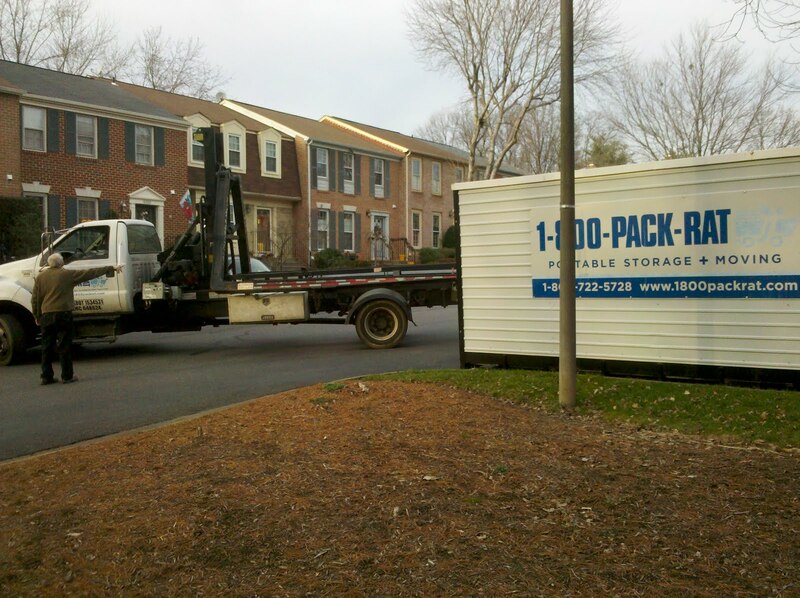 Then the arms lift the container up and over onto the truck bed. Good-by stuff. See you next year at whatever new place we finally settle! Look closely to see that this was my attempt to capture on film our Christmas Eve crossing of the Mississippi River from Illinois into Iowa. 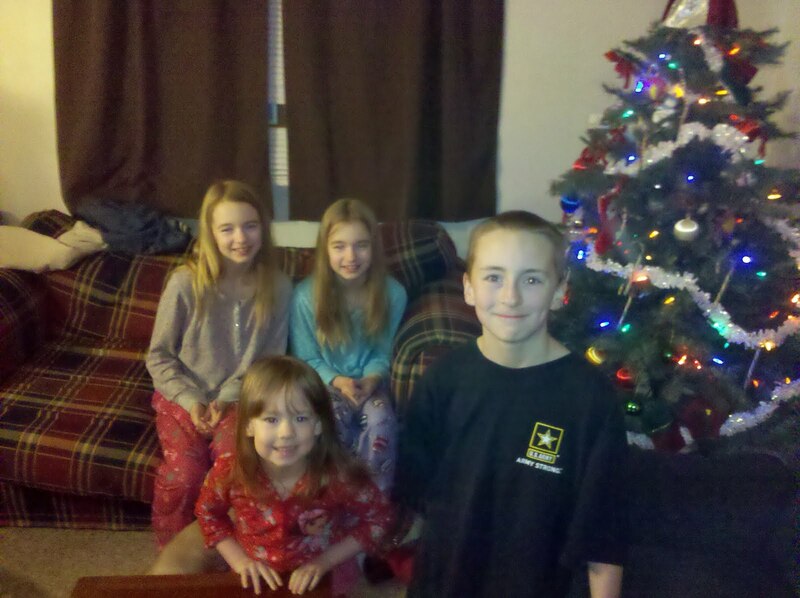 Weeks ago when I thought about all that needed to be done before we would be free to begin our adventure I had a hard time believing that we would be able to make it to Iowa for Christmas. To finally be getting there was a significant event. I also thought the picture had an interesting effect as it shows the shadow of our loaded car with bicycles on back reflected against the bridge’s guardrail. Mike and I had an app loaded on our phones that allowed him to periodically check our progress as we made the drive from Ohio to Iowa. He had 4 anxious kids constantly asking when Grandma and Grandpa were going to get there. 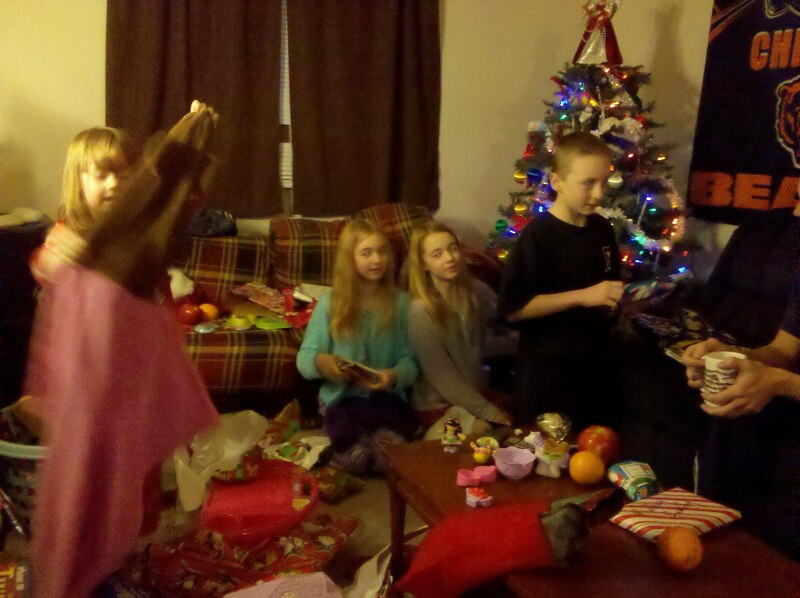 I would have expected a very early Christmas morning with kids excited to see what Santa had brought them. But they didn’t get up until 7:00am. 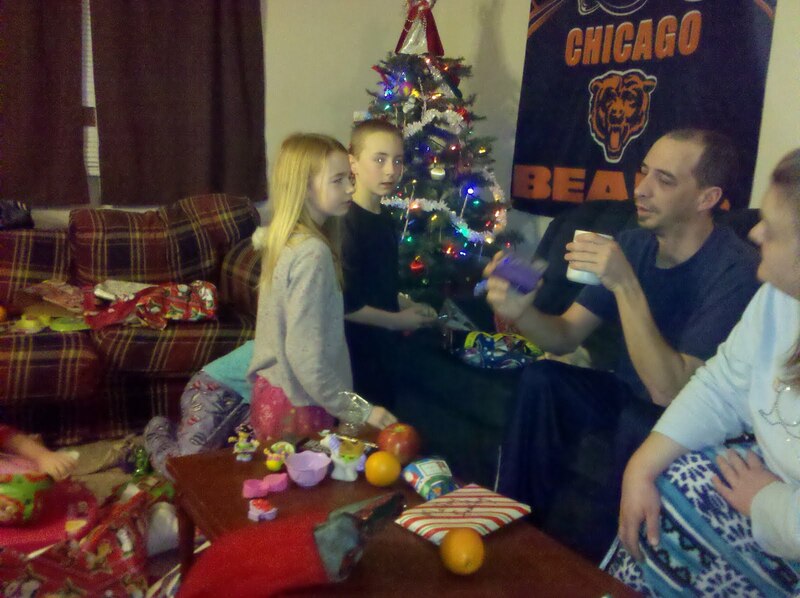 We enjoyed the exchange of gifts, which Mike tried to manage with some order. Of course, it didn’t take very long before wrapping paper was flying everywhere and joyful voices were shouting in excitement. 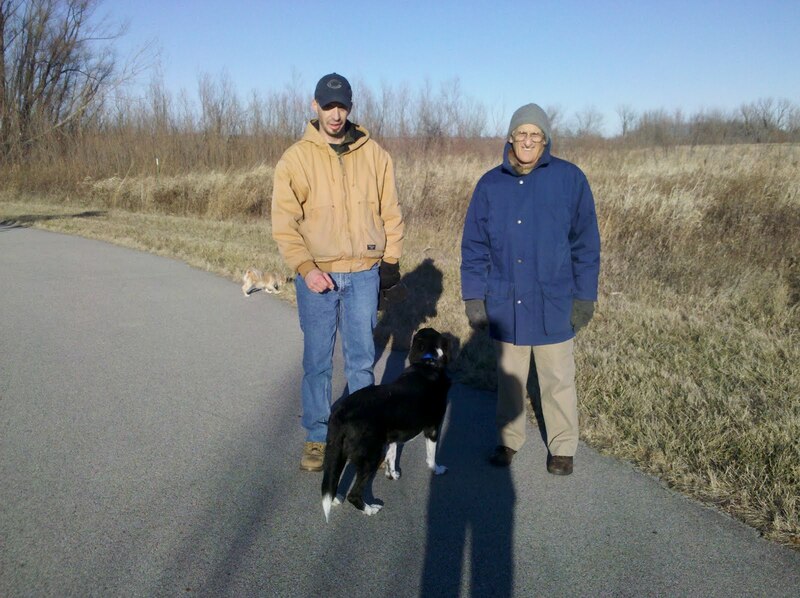 After celebrating the reason for the season with worship and the Word at First Assembly church, we enjoyed the unusually warm weather by taking the dogs for a walk on the Sycamore Greenway trail that is near Mike’s house. A job that I had a couple of years ago required some business travel to St. Louis, Missouri. On several occasions I combined business travel with a few days of personal leave, driving from St. Louis up to Iowa City to visit the Malloys before driving back to St.Louis to catch my flight home. That drive has very fond memories for me. It was hard to say goodbye to everyone this morning in Iowa City, but I was looking forward to once again being on the stretch of highway I remembered so well. And this time Lee would be along to share it with me. Well, I thought I knew the stretch of highway, but just when you think you know something, you find out you don’t know as much as you thought you did. We didn’t even make it out of Iowa City before we found ourselves going in circles downtown trying to figure out how to get back on the highway. Lee had wanted to go by the post office to mail a letter before we left town. All the time over the years that I have spent in Iowa City I guess I never had occasion to go by the post office. And after we mailed the letter and turned down a street I was suddenly in a part of town I didn’t recognize. 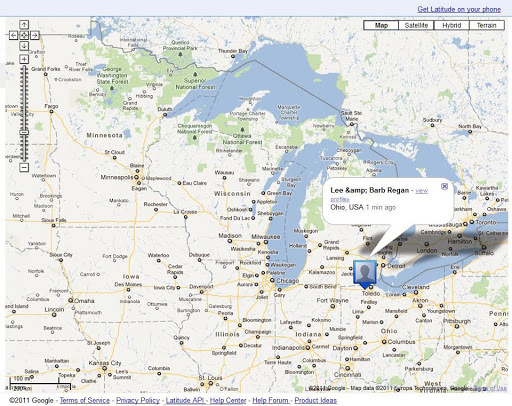 I managed to get a map up on my smart phone but I wasn’t smart enough to realize that we were pointed south, not north. That meant that when I was looking at an upcoming intersection on the map and deciding that the street we wanted was to the right I should have been telling Lee to turn left because the map orientation was pointing north, not south. Oh well, we finally made it back to the highway. 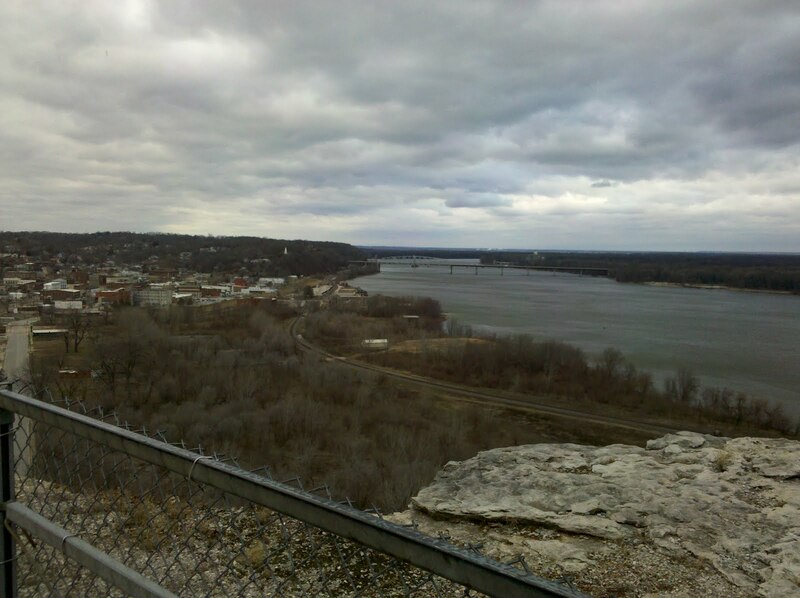 Rather than going on into St. Louis, our plan was to take a slight detour in Missouri and check out the town of Columbia, Missouri, as our overnight stop. We didn’t have a Missouri map, but on my drives from St. Louis to Iowa City my favorite place for a rest stop was the Hannibal, Missouri, Visitor Information Center. I knew they would have maps there, as well as the tourist brochures that Lee likes to collect. I told Lee to just keep straight on the highway all the way through the town of Hannibal and the visitor center was on the south edge of town. Couldn’t miss it. But miss it we did. Or rather we simply couldn’t find it because we got lost trying to get through town. I wasn’t paying close attention when Lee said he saw a sign that said the visitor center was the next left. “Maybe they decided to make a new route around the main part of the town” was what I thought as he made the left turn. 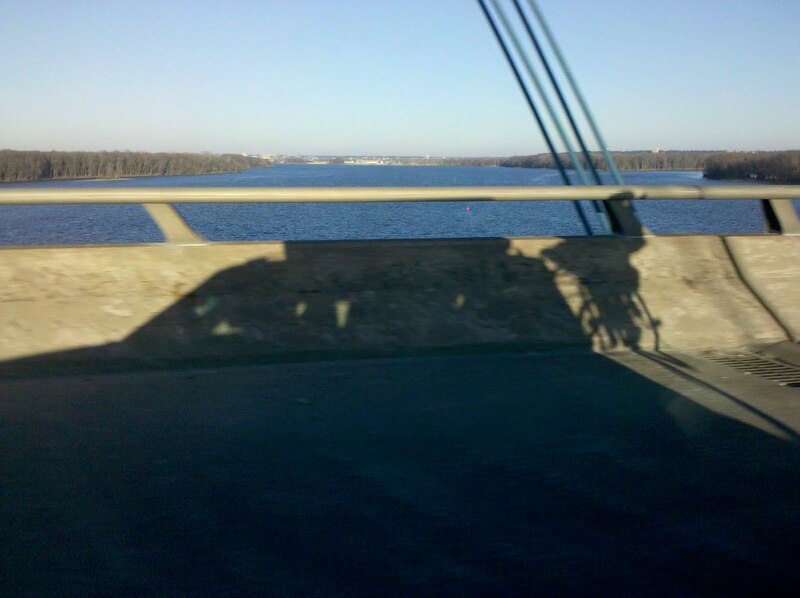 But before we knew it we were on an interstate crossing the Mississippi River into Illinois. We knew that couldn’t be right and found the next exit to turn around and go back into Hannibal, where our troubles were just beginning. Nothing looked familiar. This time the smart phone was not getting good coverage or there wasn’t good map data for Hannibal because I couldn’t get any street names to show up. We finally stopped at a gas station and I went inside to ask directions. But I gave up in frustration when I couldn’t get anyone to help me. Just about that time as we drove up the next block I saw a sign that got us back to the highway that we had come into town on. From there I knew I could get us to the visitor center. After we saw that the visitor center was called the Missouri Welcome Center we realized that the sign for “visitor center” that Lee had seen was the visitor center for all the downtown tourist attractions of Hannibal. There are a lot of those because Hannibal, Missouri, is famous for its part in Mark Twain’s life and stories. So I did get to see a side of Hannibal that I hadn’t seen on any of my previous trips through there. Not to mention, that as we backtracked while still lost along the river, Lee took a notion to follow a sign up a road that promised a viewpoint of the town from the famous “Lover’s Leap”. We joked that Lee was lucky I didn’t shove him over the Lover’s Leap after all the frustrations of getting lost today. One of the nice things about our casual method of travel is that we don’t have any planes to catch or schedules to meet so the length of time that it takes to get from one place to the next doesn’t really matter. We had some daylight left when we got to Columbia late this afternoon, but will have more time tomorrow to explore. Columbia, Missouri, is home to Missouri State University and has nice parks and bike trails to check out tomorrow, depending on the weather. After checking into our motel we walked through part of downtown before enjoying a delicious dinner at a Thai restaurant. 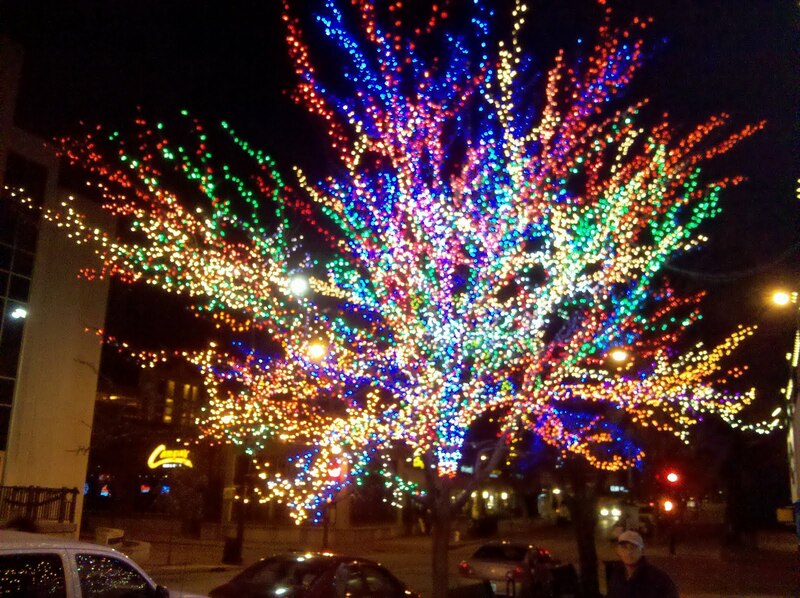 A nicely decorated tree on a Columbia, Missouri, street corner. The last couple of days have been spent exploring central and southeastern Missouri as we slowly meander our way to Florida. We are thankful that the winter storms common in the midwest at this time of the year have not made an appearance, giving us the option of leisurely travel. 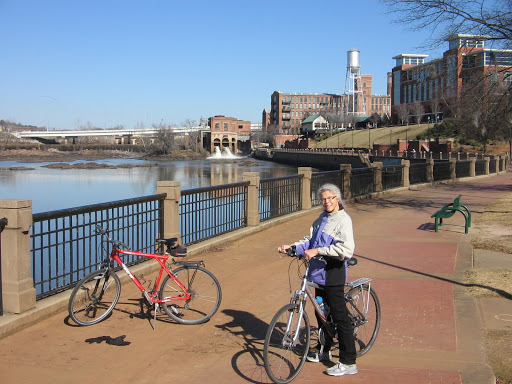 New Year’s Eve in Columbia, Missouri, promised to be a warm day and we had a couple of local options for bike riding. It was still quite chilly in the morning so we walked around a local park and public garden. The city library was an interesting building and we went inside to have a look. We found a marvelous reading room on the top floor where the sunlight streamed in the windows. That gave us a pleasant hour reading and catching up on the newspapers. 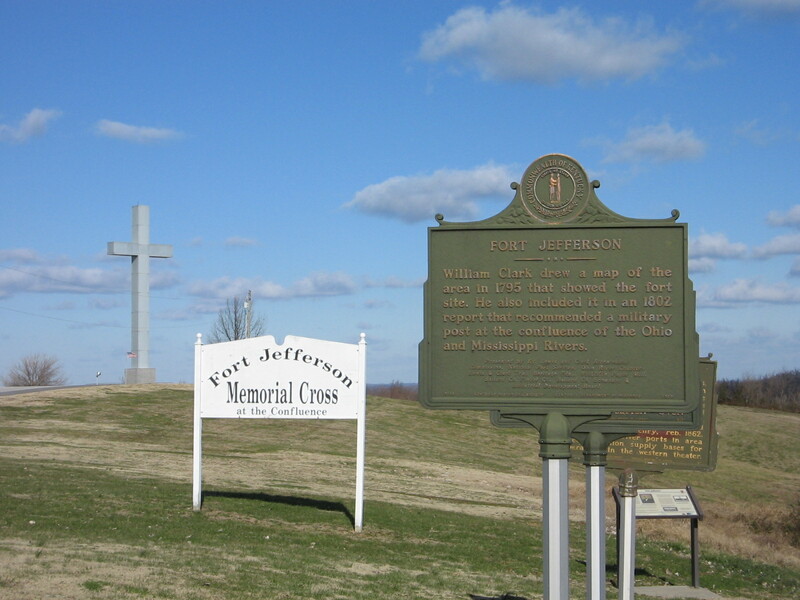 We then decided to drive down to Jefferson City, the capital of Missouri. 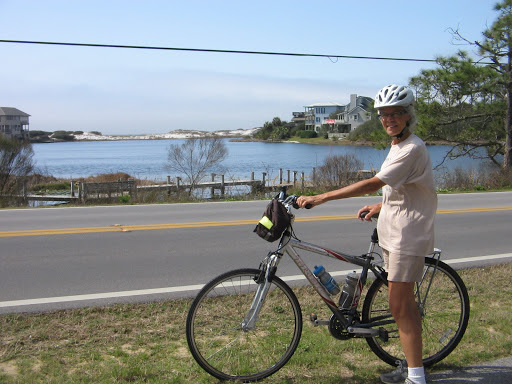 We wanted to explore the sights there and we figured by that time it would be warm enough to ride our bikes. 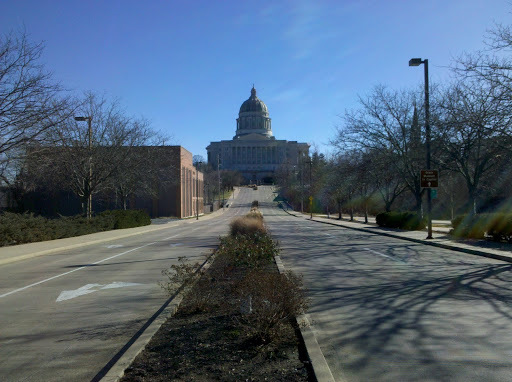 We were impressed with the capitol building and especially liked the fact that all the streets were deserted due to the holidays. 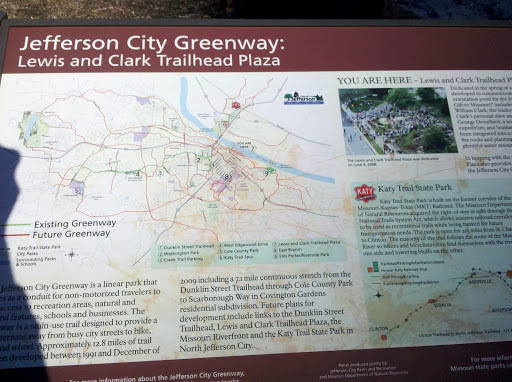 After looking around the capitol area we got on the Jefferson City Greenway and had a nice 12-mile bike ride, skirting the edge of the city. We finished the day by driving to Rolla, Missouri. No staying up late to ring in the new year for these 2 tired travelers. Fortunately, Rolla was a small enough town that there weren’t local revelers to disturb our sleep. New Year’s Day started with an inspiring worship service and message from God’s Word at Rolla First Assembly of God church. We got back on the road after church but since it was close to lunch time we didn’t drive too far before we spotted an interesting park and decided to make it our stop to eat the lunch we had packed. 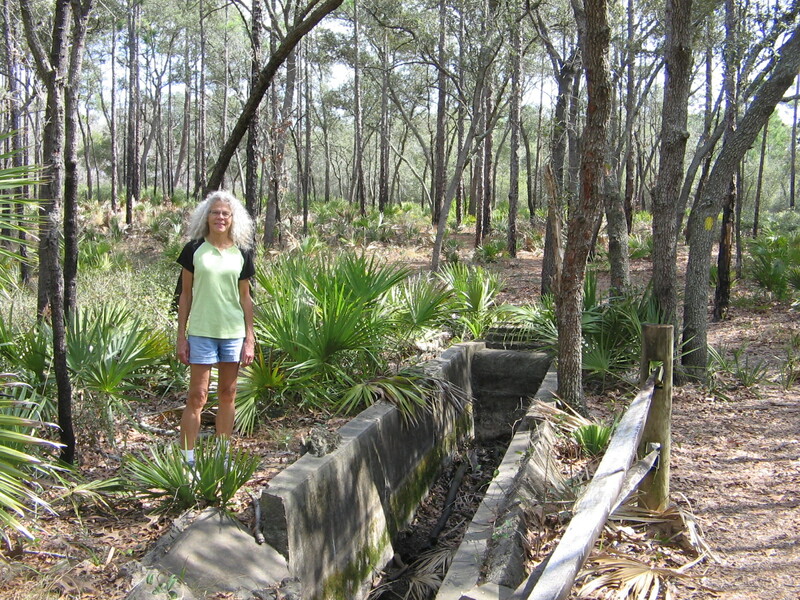 Maramec Springs Park has a waterfall at one end of the pond where the water comes from the spring. I’d never seen a spring this big before. The brochure says “average daily flow of around a hundred million gallons of water, enough to fill about 26 bathtubs every second.” There are also several trout rearing ponds managed by the Missouri Department of Conservation. 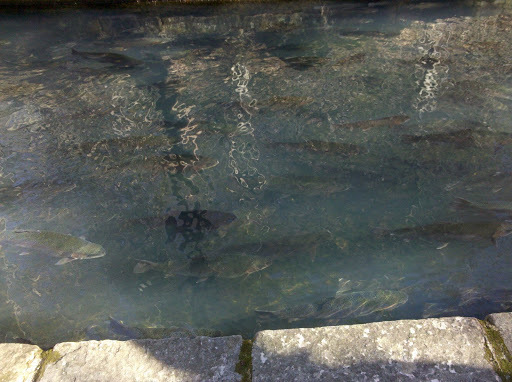 The ponds were filled with rainbow and brown trout, some of them really huge. 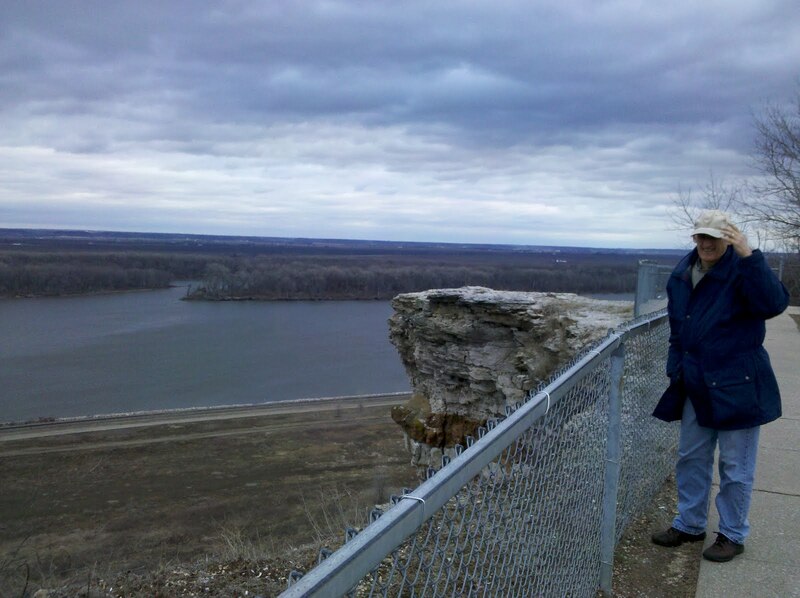 The remainder of our New Year’s Day was spent enjoying the scenery as we drove southeast through the Missouri Ozarks, ending in the flat Mississippi delta region at Charleston, Missouri. Whew, I’m sure glad the cold front that brought freezing temperatures as far south as Florida is on its way out of here. 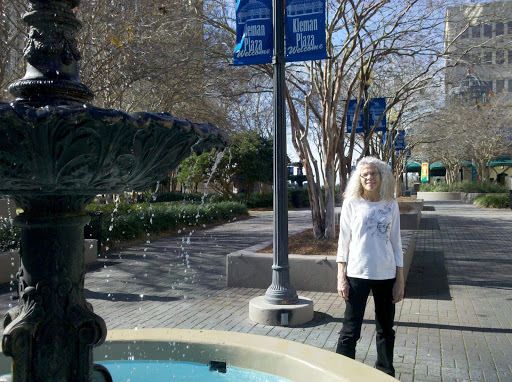 The above picture was taken this afternoon in front of a fountain in Rome, Georgia. 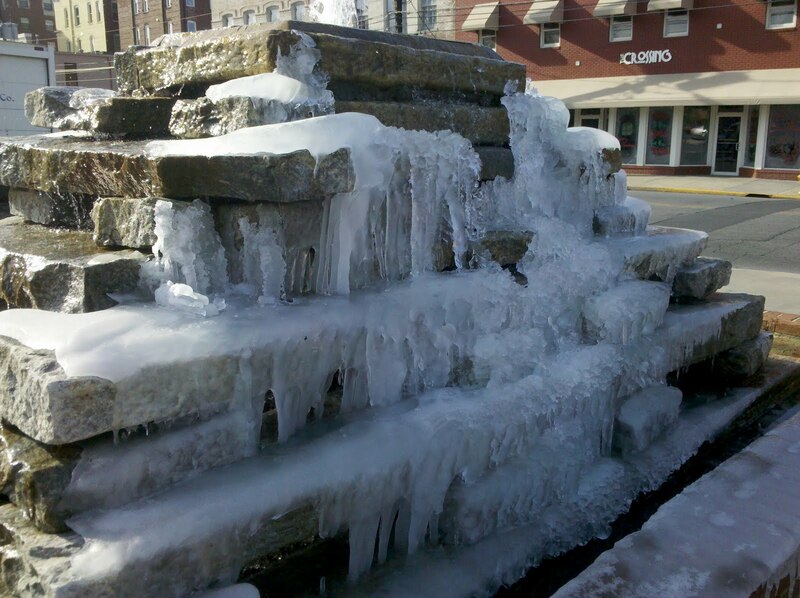 I bet there aren’t too many times when that fountain has ice in it. By the time we had stopped in Rome for sightseeing the day had finally warmed up to 50 degrees. That was 15 degrees warmer than yesterday’s high. Monday when we were in Tennessee and looked at the weather forecasts we knew it wouldn’t do any good to hurry up and go south because the cold air was everywhere south. Not weather for walking around and certainly not weather for bike riding. 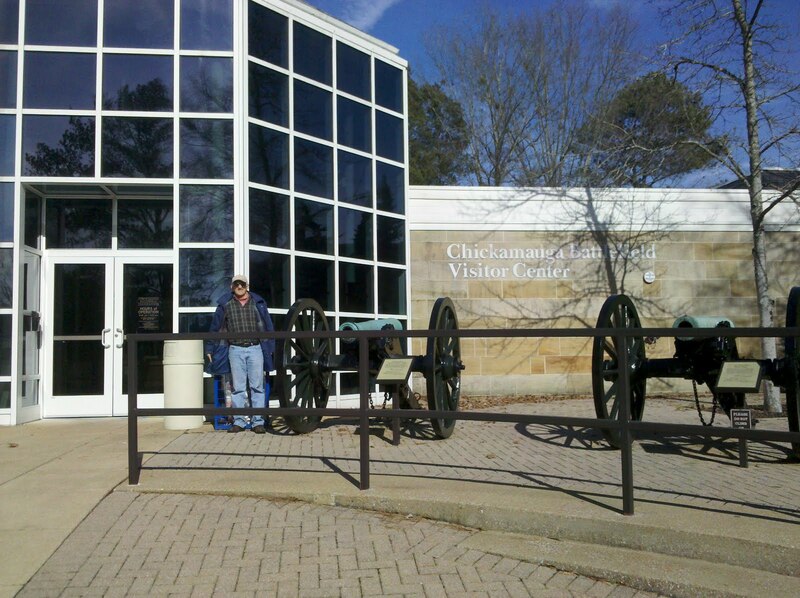 We did take a short walk today through the Chickamauga Battlefield after watching the educational video at the visitor’s center. Because of the cold weather the last couple of days have been mostly cruising through Tennessee and Georgia seeing the sights from the warmth of our car. Having bright sunshine helps, too. Tonight we are in Lagrange, Georgia, about 60 miles southwest of Atlanta. 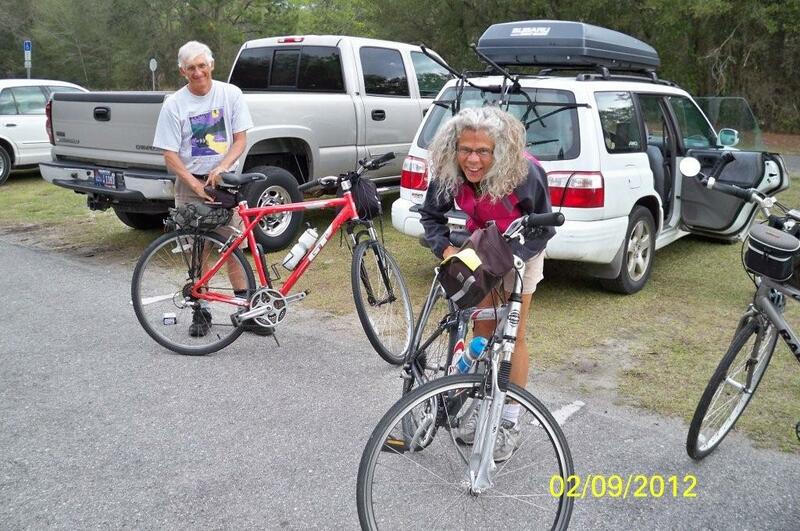 We are hoping that tomorrow will be warm enough to ride our bikes. 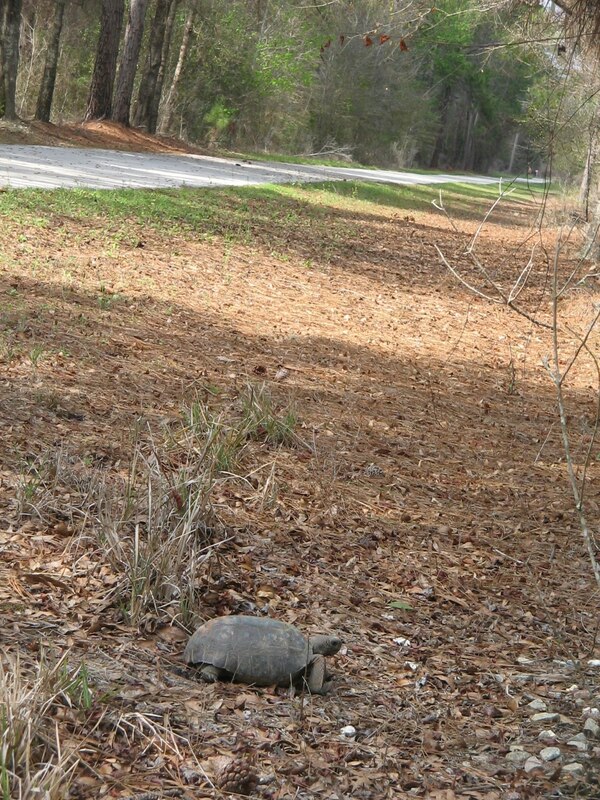 There is a bike path in Columbus, Georgia, about an hour south of here that sounds like a fun ride. After that we should still have enough of the day left to get to Florida. Warmer weather, here we come. Last evening just after sunset we crossed the border from Georgia into Florida. The day in Georgia had been quite enjoyable, as the weather had warmed up considerably. 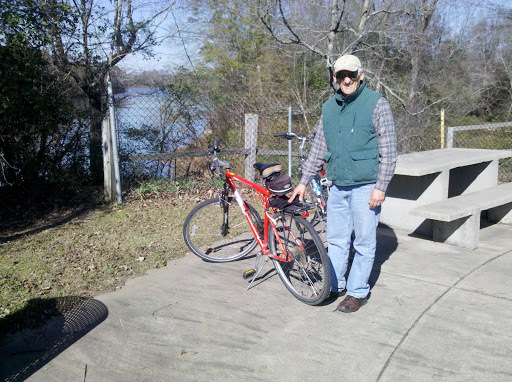 We spent several hours in Columbus, Georgia, where we rode our bikes on the River Walk Trail from downtown Columbus to Fort Benning. 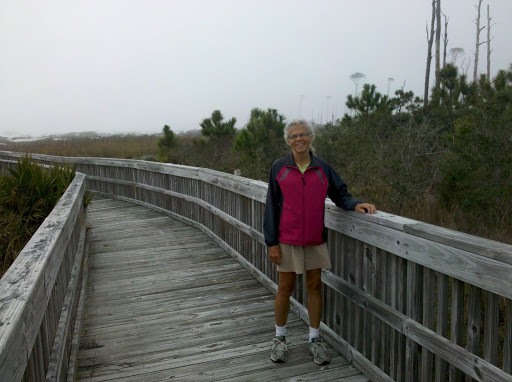 For most of the 10 miles the trail parallels the Chattahoochee River. One stop along the way at the Oxbow Meadows Environmental Learning Center provided an opportunity for viewing nature exhibits, as well as a seat for me to enjoy the warm sunshine. Last night we stayed in Tallahassee and found enough interesting activities that we decided to spend a second night here. 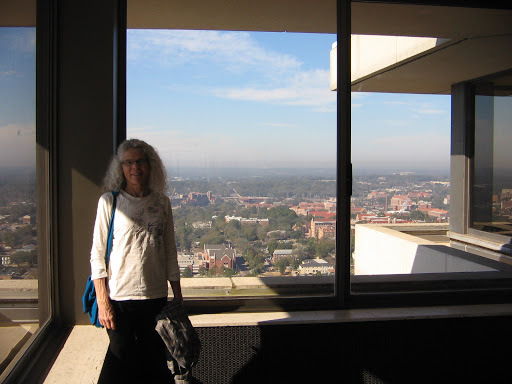 The Florida Capitol building has an observation deck on the 22nd floor that gave us a bird’s eye view of the city at the start of our day. 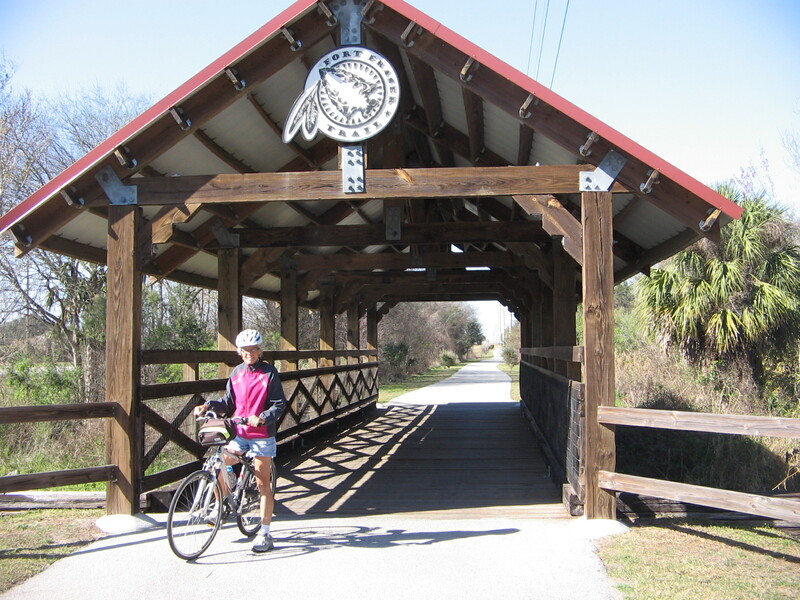 We spent some time walking around downtown and then drove 12 miles south of town for an afternoon bike ride on the trail that was Florida’s first rail-trail. 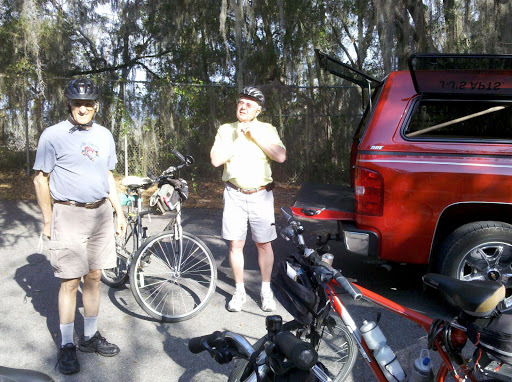 We didn’t have enough time to ride all the way to the trail’s end at the town of St. Marks, where the St. Marks and Wakulla rivers come together before flowing into Apalachee Bay. 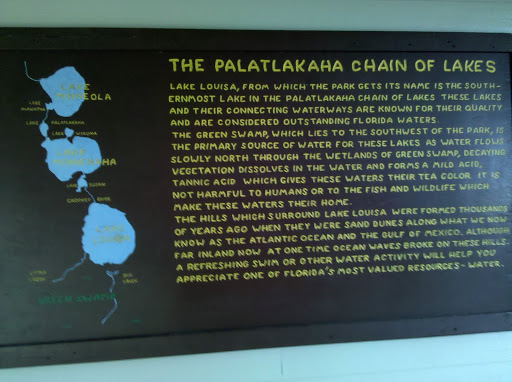 We also didn’t have time to explore nearby Wakulla Springs State Park or Apalachicola National Forest. Have to leave something for another day! 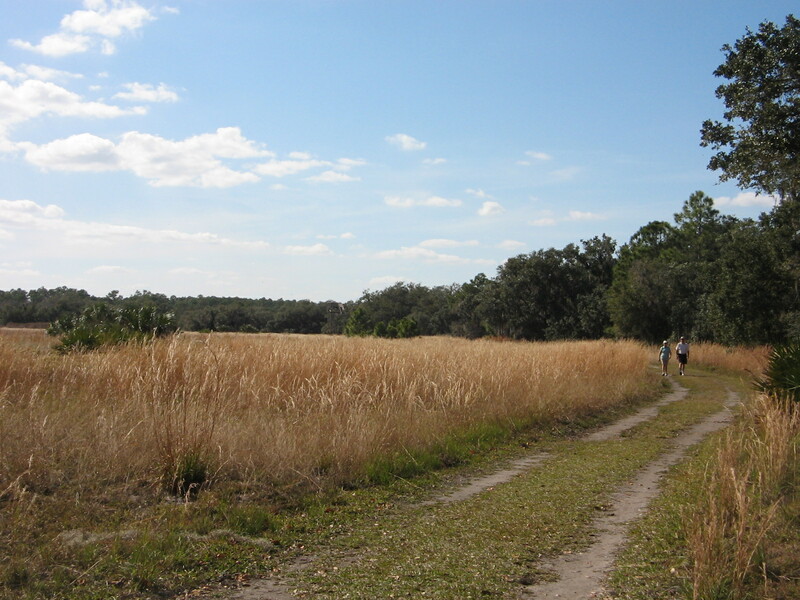 Once you leave Florida’s interstates and resort areas, it’s surprising how much rural land there is in the state. Ocala, where we were Sunday and Monday, is “horse country”, as evidenced by the stretches of land devoted to breeding and raising horses. 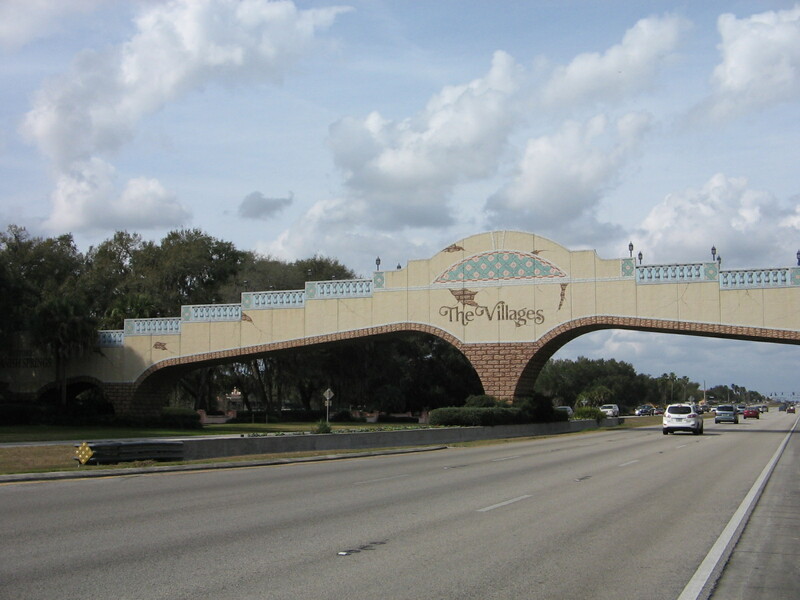 Yesterday we continued our southward journey on our old favorite, Highway 27, and we are now in central Florida, home to acres and acres of orange groves and cattle ranches. 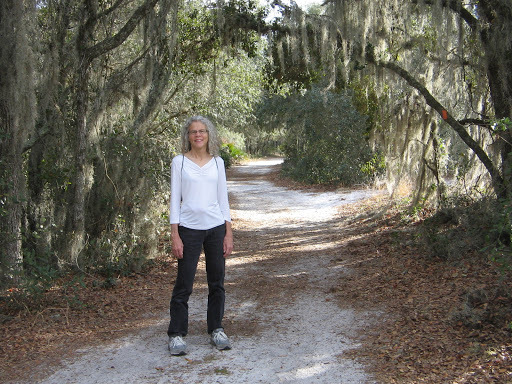 On our way down yesterday we stopped at Lake Louisa State Park and walked on a nature trail. This was before we started seeing all the orange groves. And I knew that it is strictly forbidden to pick anything from a tree in the groves, even when they are enticingly close to the road. 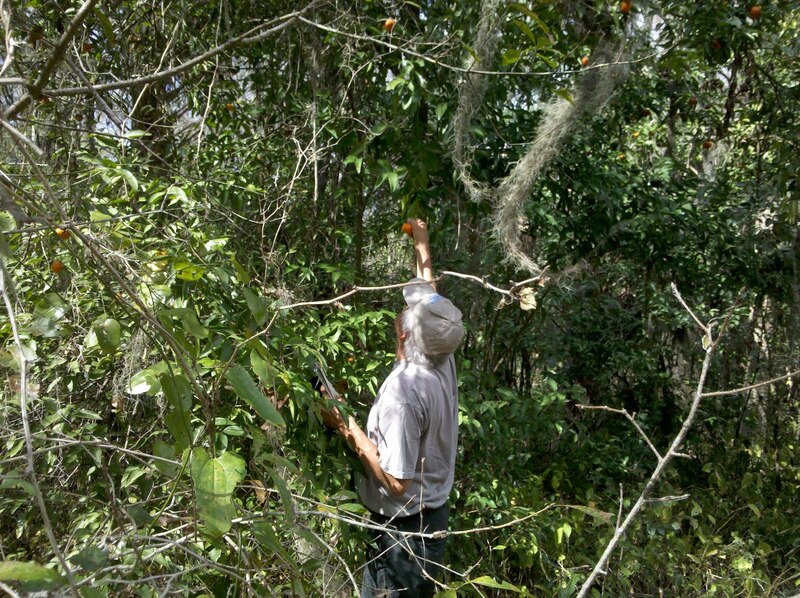 So I got all excited when the first thing we saw along the nature trail was a couple of stray orange trees. Unfortunately, the oranges weren’t quite ripe. 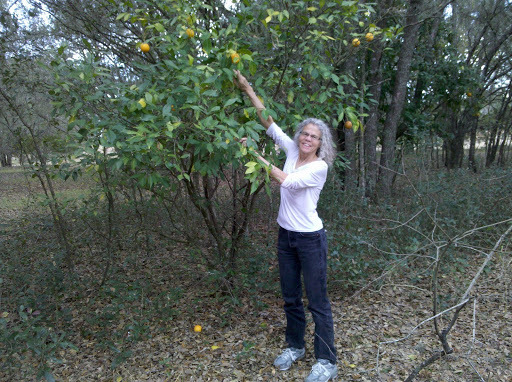 We had to wait until this morning at Aunt Joyce’s house in Avon Park to enjoy fresh Florida citrus. She has a grapefruit tree in her yard and we split a big, juicy grapefruit to start our breakfast. 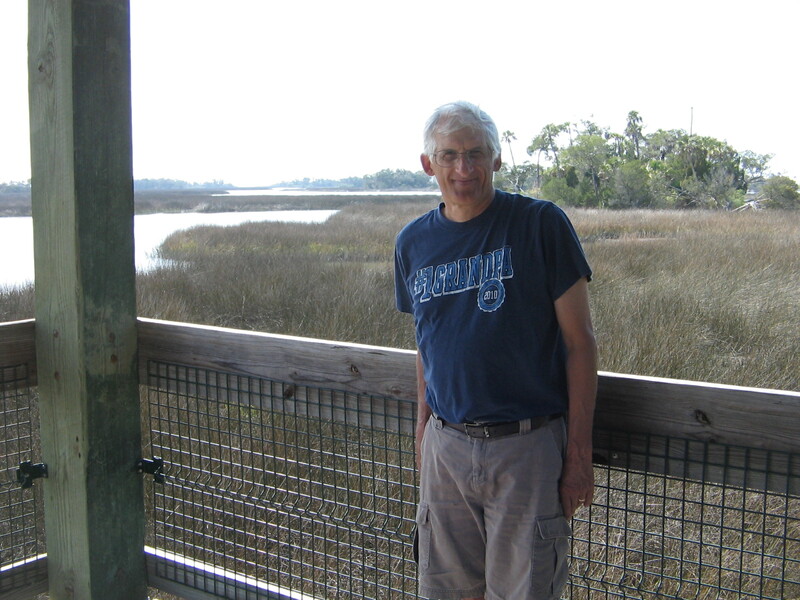 Today’s outing was a drive to Lake Placid and a visit to the Archbold Biological Station. We watched an interesting 20 minute video on the history of the park. 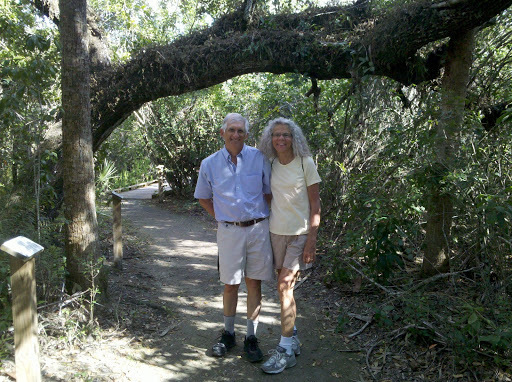 Our usual activity once again was to walk on the nature trail. 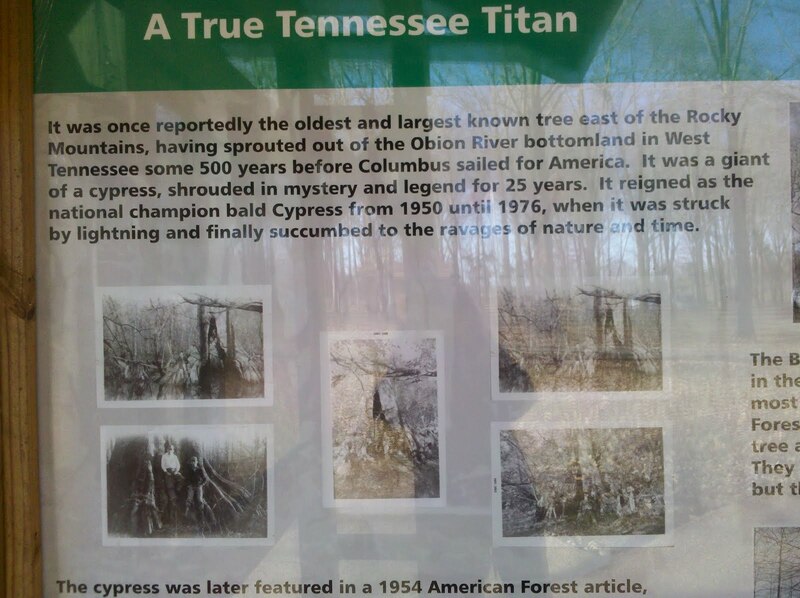 This time we learned a lot about the area’s biology by reading the brochure that accompanied the signs on the trail. 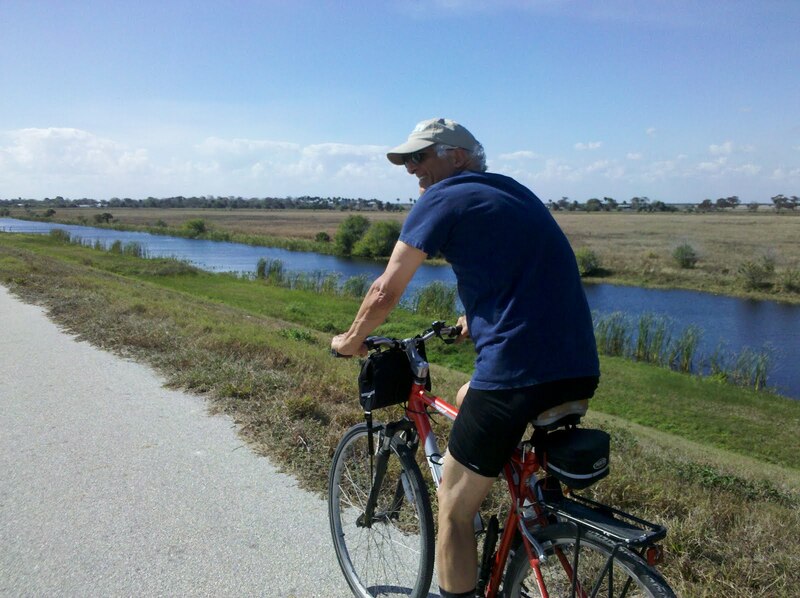 On the way home we took a detour to see Lake Okeechobee. 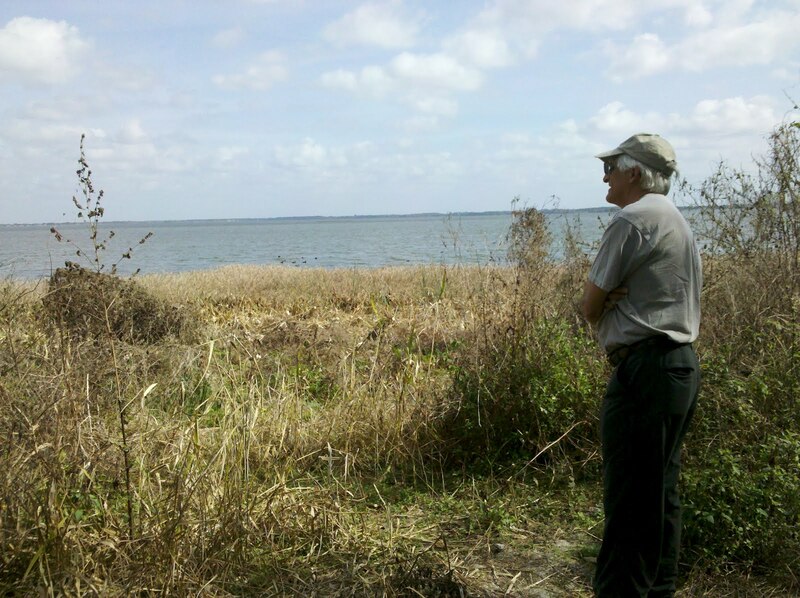 We didn’t drive far enough to see any beaches but just stopped at an area that viewed the ring of marshes around the north end. What our pictures haven’t been able to capture are the long expanses of flat horizons covered by sunny, blue skies; the innumerable small lakes; the extensive cattle ranches; the orange groves and the many trailer trucks on the highways transporting the now-ripe oranges. 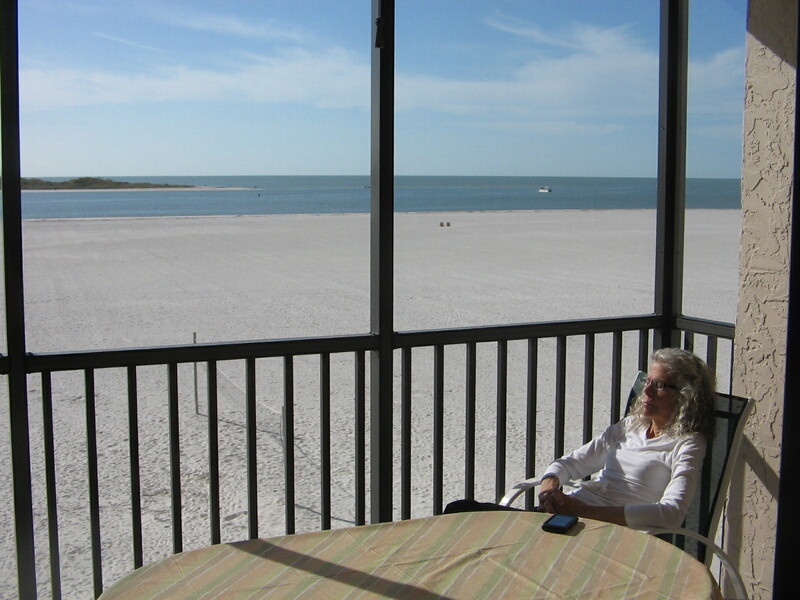 After a totally relaxing and enjoyable week being spoiled by our hosts at Fort Myers Beach, it was time yesterday to pack up and move on. Across the water is the view of Carlos Pointe condos (long building in the middle), where we stayed for the week. This view was taken from one of the beaches on nearby Lover’s Key State Park. 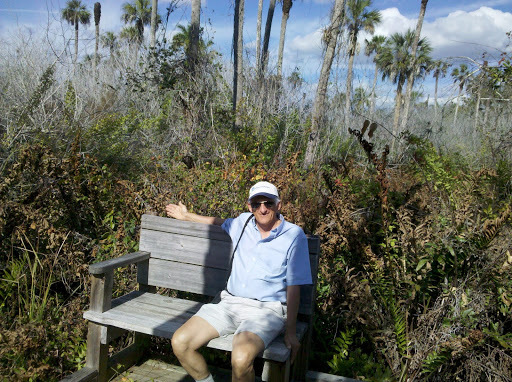 The first stop after leaving FMB was at the J. N. “Ding” Darling National Wildlife Refuge on nearby Sanibel Island. 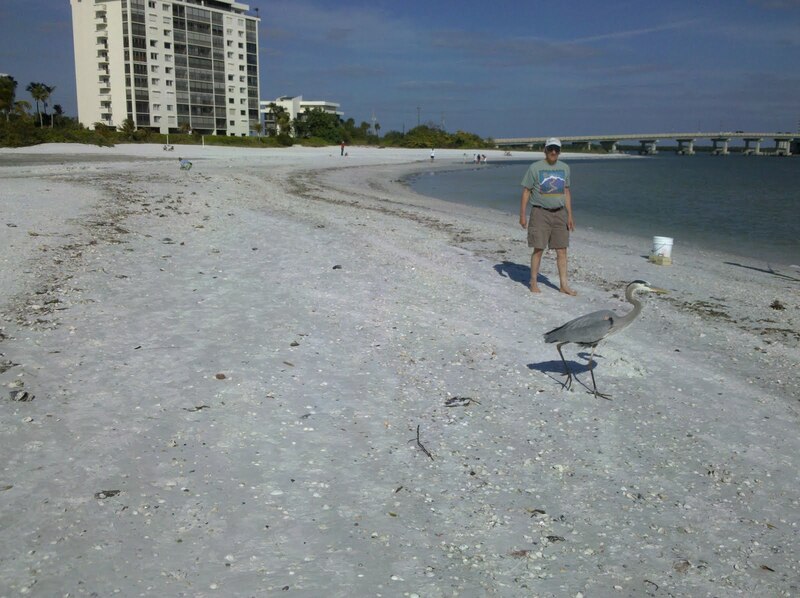 Lee and I had spent time there on a previous visit to Florida, but we had a special reason yesterday for going there. 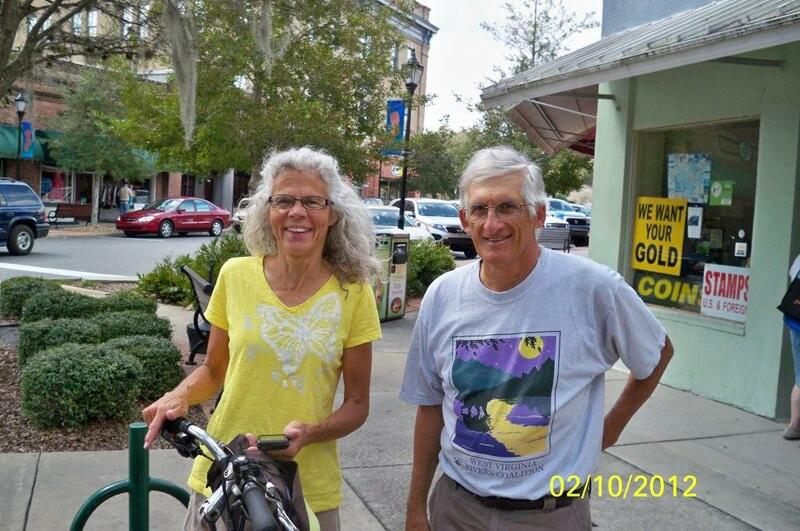 Our friends, the Marshall’s, from northern Virginia were vacationing there. 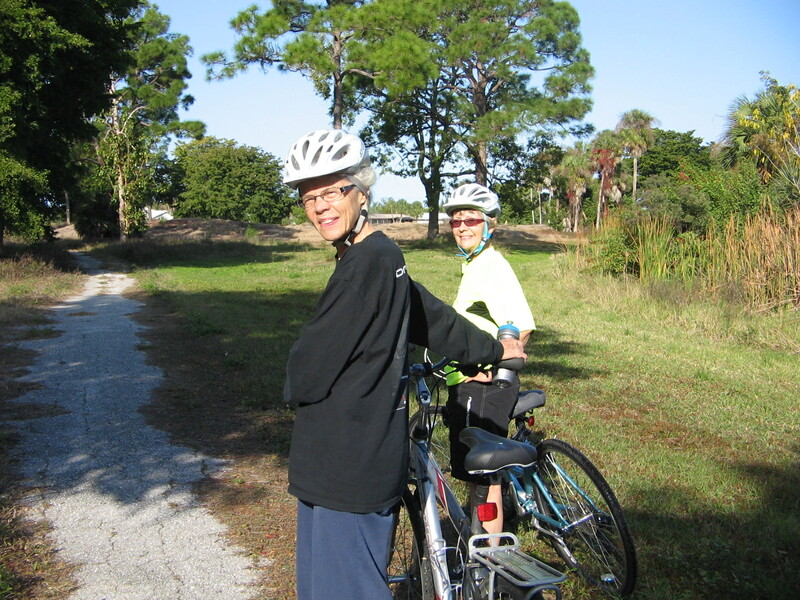 Over the years we have shared many hikes and bike rides with the Marshall’s. How nice to see some familiar faces. After spending the morning riding our bikes through the refuge to observe the many birds, we enjoyed a delicious lunch at a local restaurant. 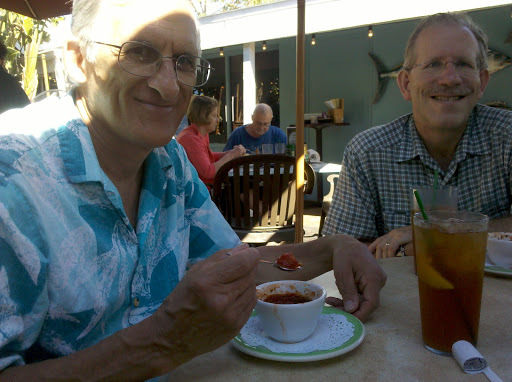 Lee was thrilled that he got an opportunity to taste a new dish–conch soup. Today we attended services at Fort Myers First Assembly of God church and then hit the highway. 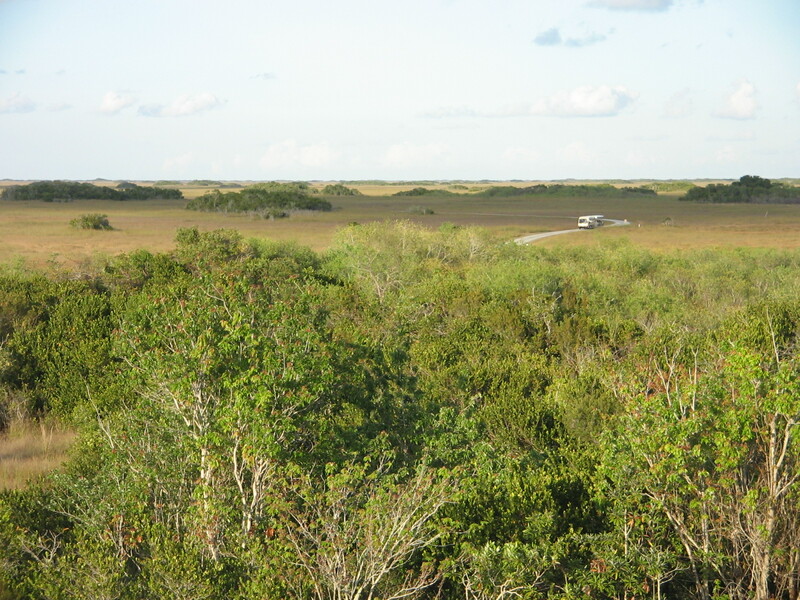 Our destination was Everglades National Park. 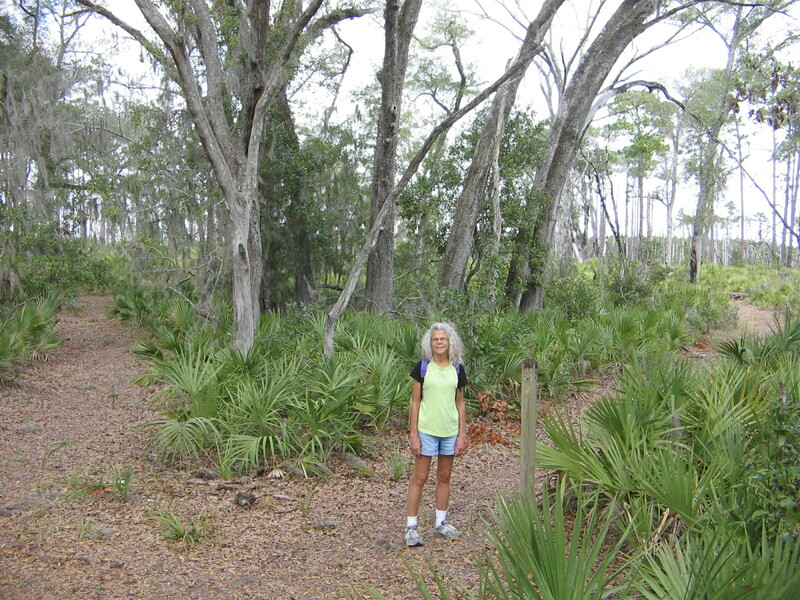 We made a stop along the way at Collier-Seminole State Park. 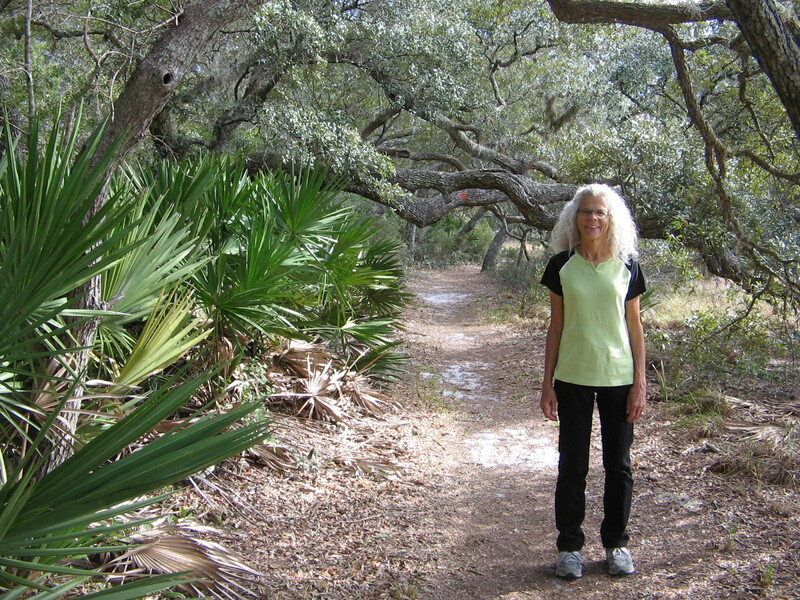 The Royal Palm Hammock Trail provided informative signs that described the plant species, many of which we have seen elsewhere, but some that were unique to this area. 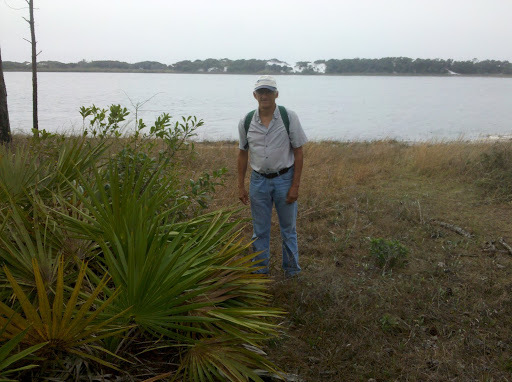 Behind Lee are some of the Royal Palms that are unique to this part of Florida. 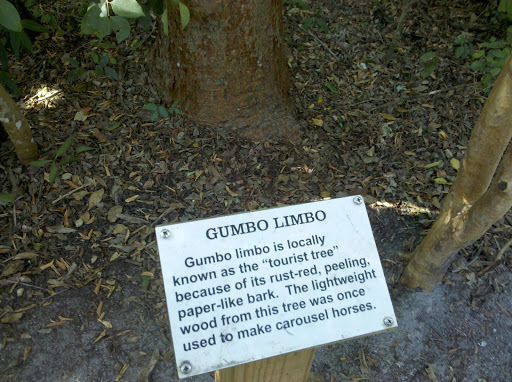 A tree we have seen many other times is the Gumbo Limbo. 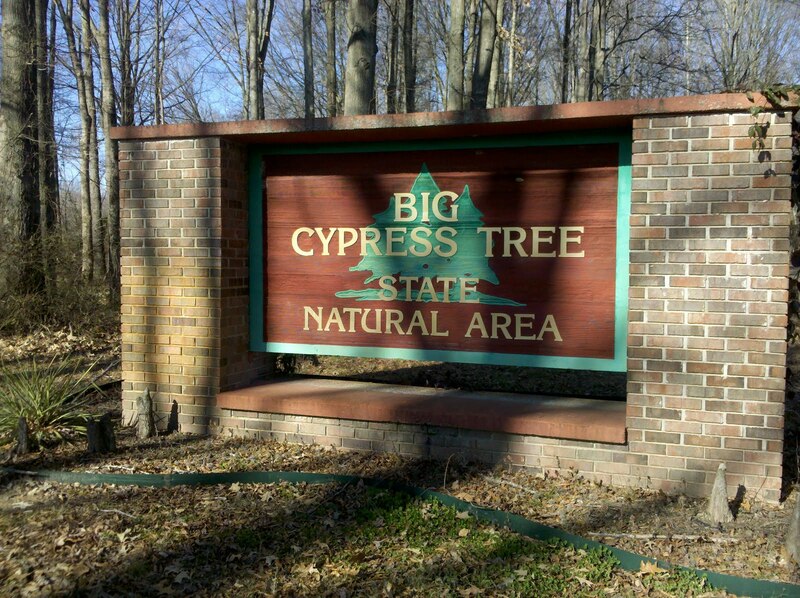 Besides the interesting name, it has an amusing nickname used by the locals. Fortunately, Lee and I are not part of the red, peeling skin crowd, but are, instead, getting nice Florida tans. This photo is not a close-up where you are able to see our tans. 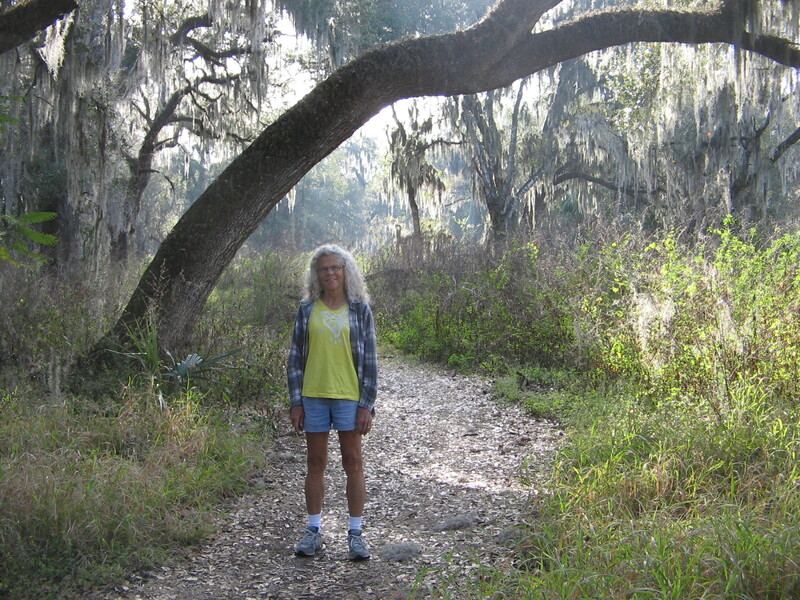 But we were pleased when a fellow walker on the trail offered to take a picture of both of us under a Live Oak that was branched across the trail. 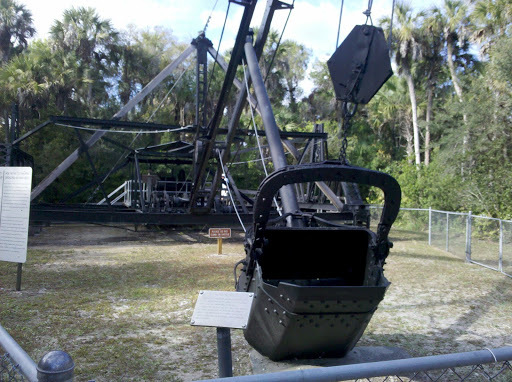 One of my favorite exhibits at Collier-Seminole was something that you don’t expect to see at a state park. The park is the site of a National Historic Mechanical Engineering Landmark. Who would ever have thought there was such a thing. This towering black machine is the last existing Bay City (that’s Bay City, Michigan) Walking Dredge. 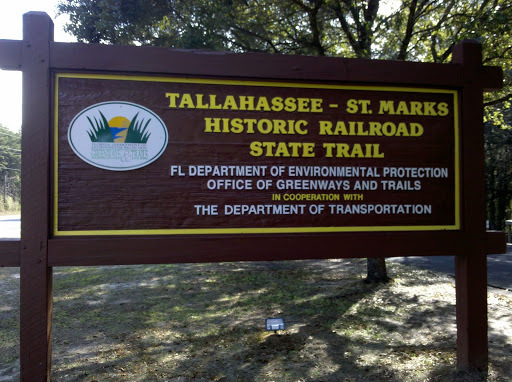 It was built in 1924 and used to build the Tamiami Trail Highway (US 41, that we were driving on to get to the Everglades). 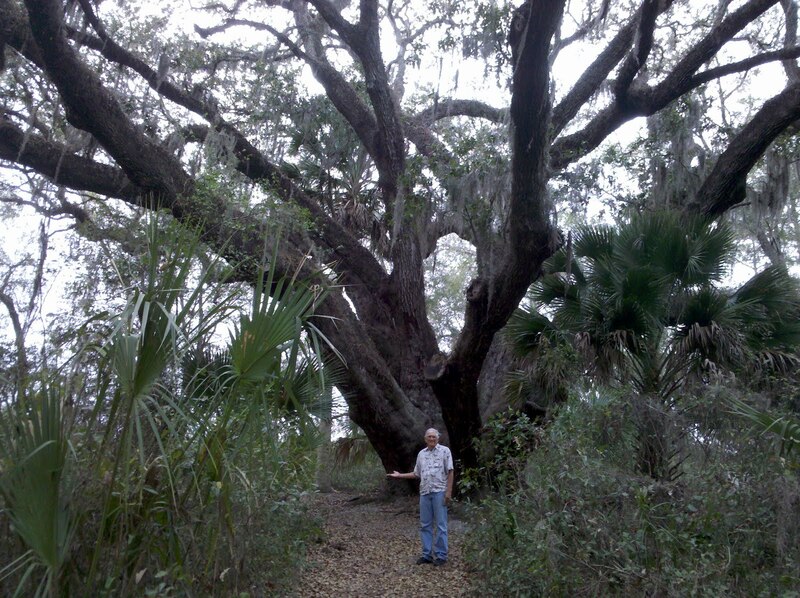 It was an engineering marvel of its day and helped accomplish the monumental task of building a road through the Everglades and Big Cypress Swamp, linking Tampa and Miami and opening southwest Florida to travelers like us. 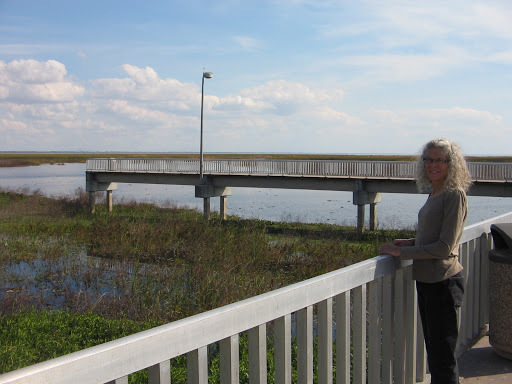 So thanks to the Walking Dredge and the labors of many men and women over the years, we were able to reach our destination of Everglades City in enough time to watch a short film at the Everglades National Park Gulf Coast Visitor Center. 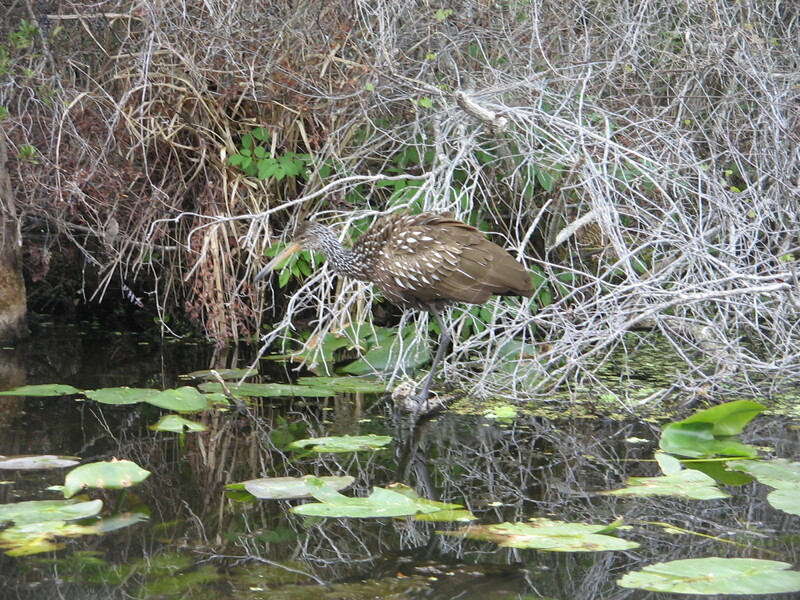 There is much more to explore and learn in the Everglades and it was closing time at the Visitor Center. 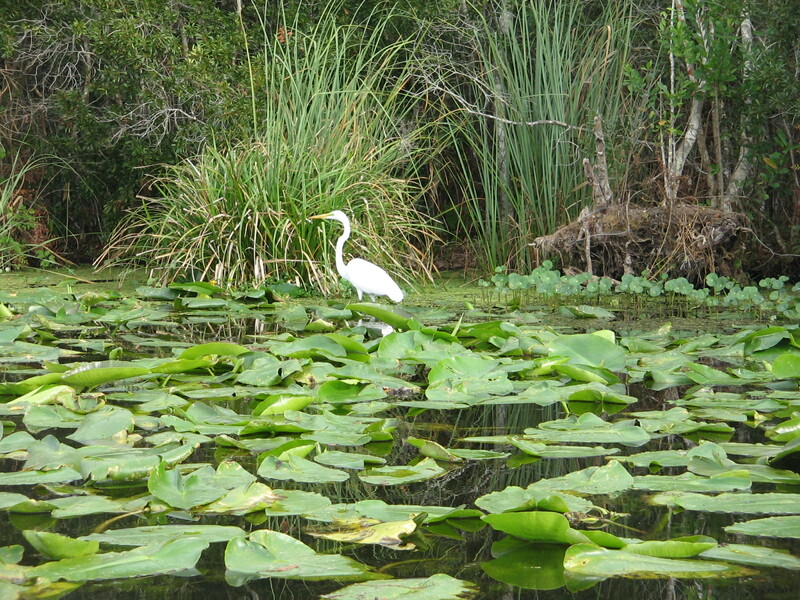 We are spending the night In Everglades City and will have time for more exploration tomorrow. Sunset this evening over Chokoloskee Bay. We didn’t intend to be in Fort Pierce tonight, but our adventures in Florida have often led us to places that we hadn’t necessarily thought of visiting. 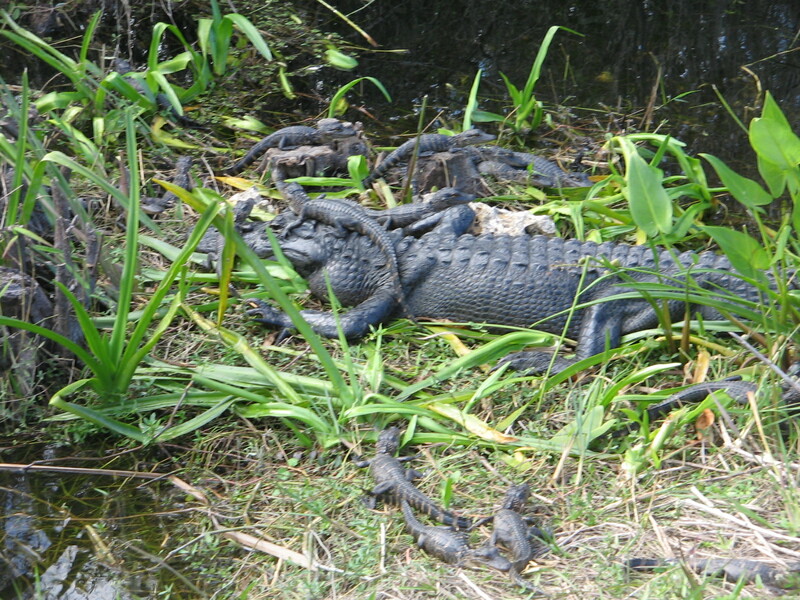 The 3 days that we spent in the Everglades were like that. 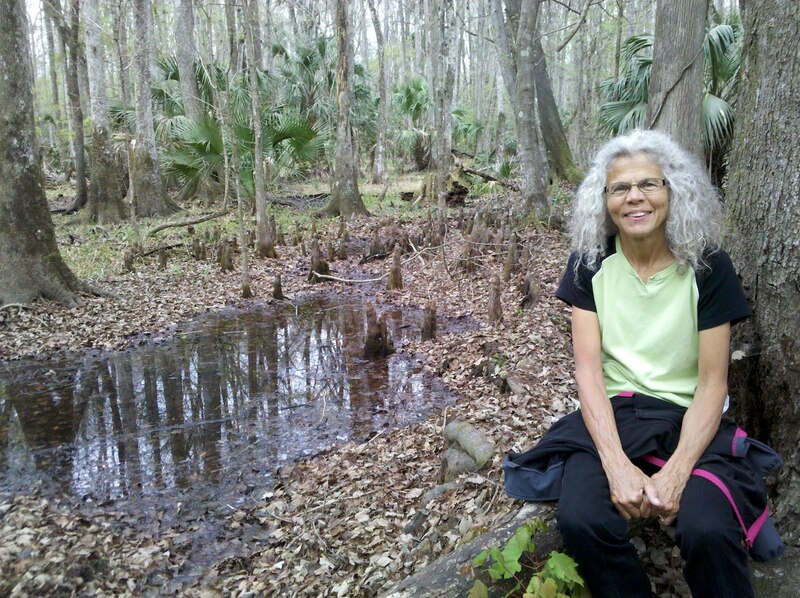 Until a conversation last Saturday with our friends, the Marshall’s, we weren’t thinking that the Everglades would be somewhere we would go during our time in Florida. I can’t believe that we almost missed going there. It was a fantastic 3 days, with so much more to share about than I will have time for here. 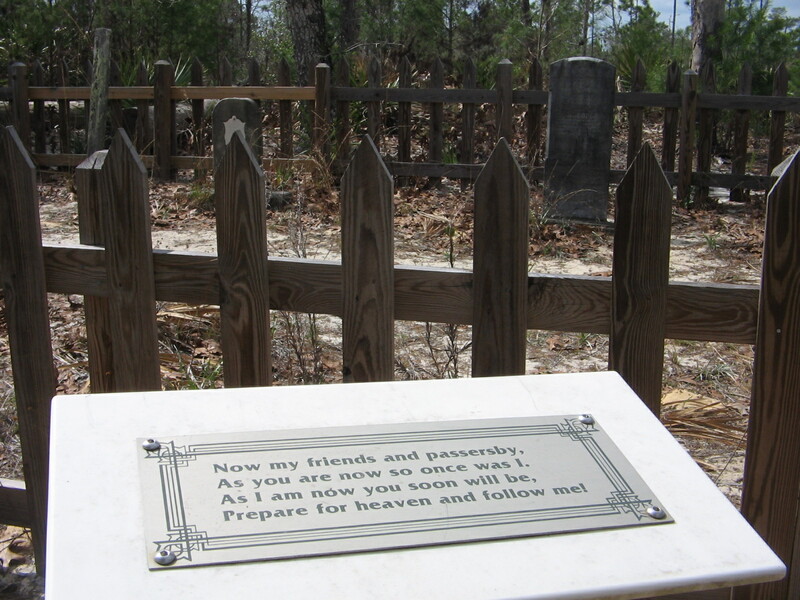 But I’ll give a quick rundown just so you’ll know that we didn’t get eaten by alligators and are still alive and well. 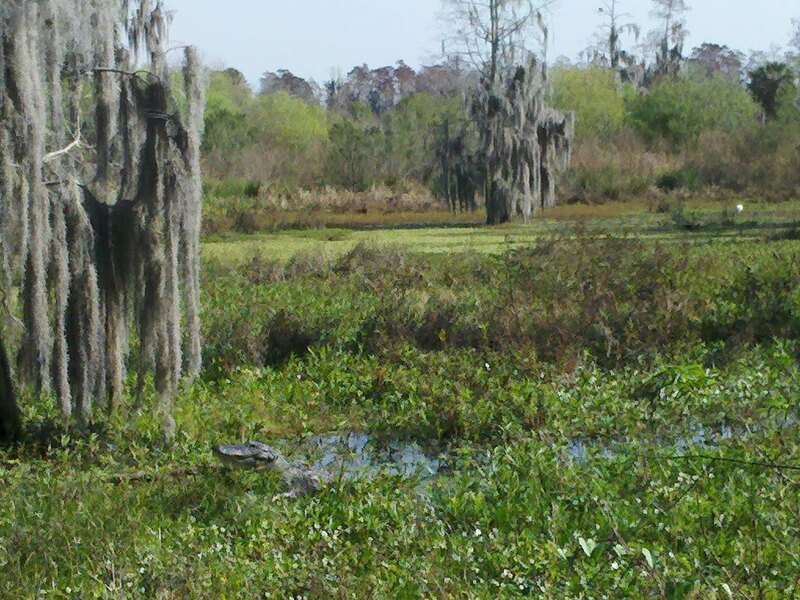 Alligators, alligators, alligators. 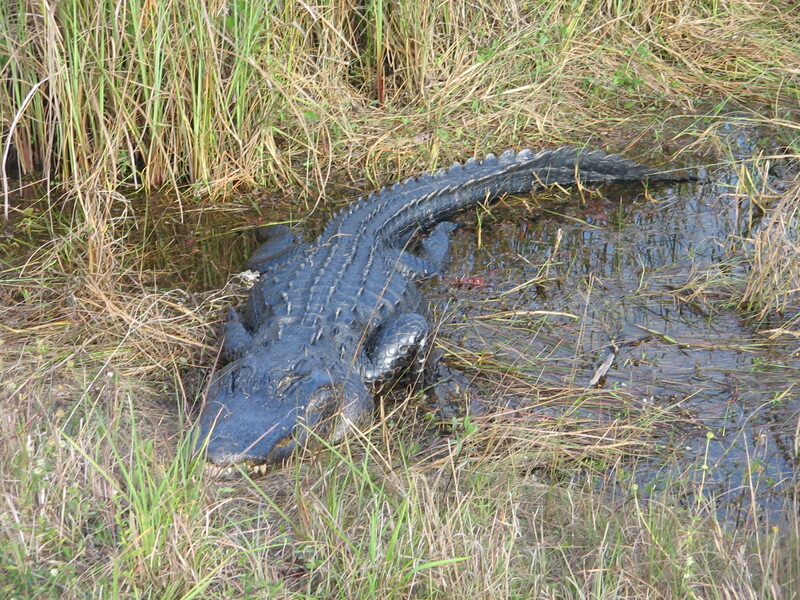 I kept pleading with Lee that we just HAD to go through the Everglades because I really wanted to see alligators. 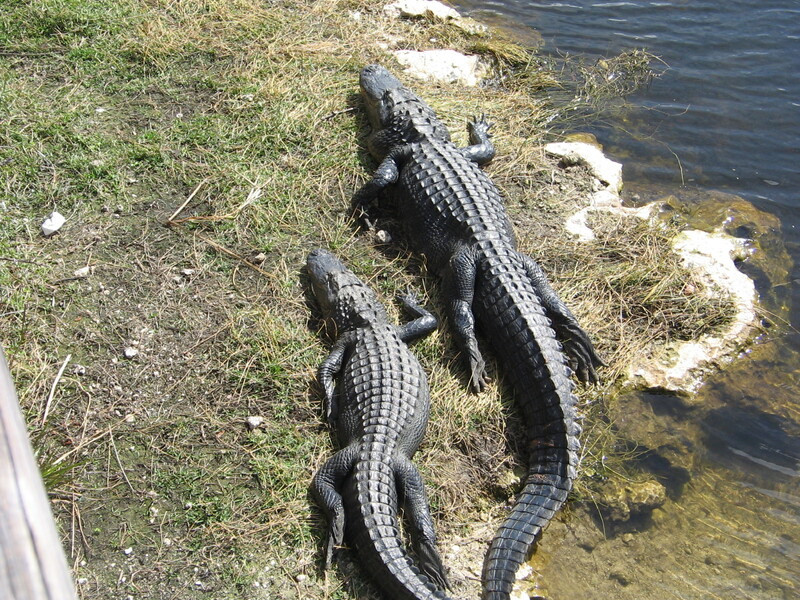 And see alligators we did. During the 3 days there were many places we stopped to view them. They like to lay out in the sun next to ditches, as well as sometimes when we would see them floating in the canals like half-submerged logs. At no time did we ever see one that looked like it had enough energy to even care one bit that a bunch of tourists were there gawking and taking pictures. 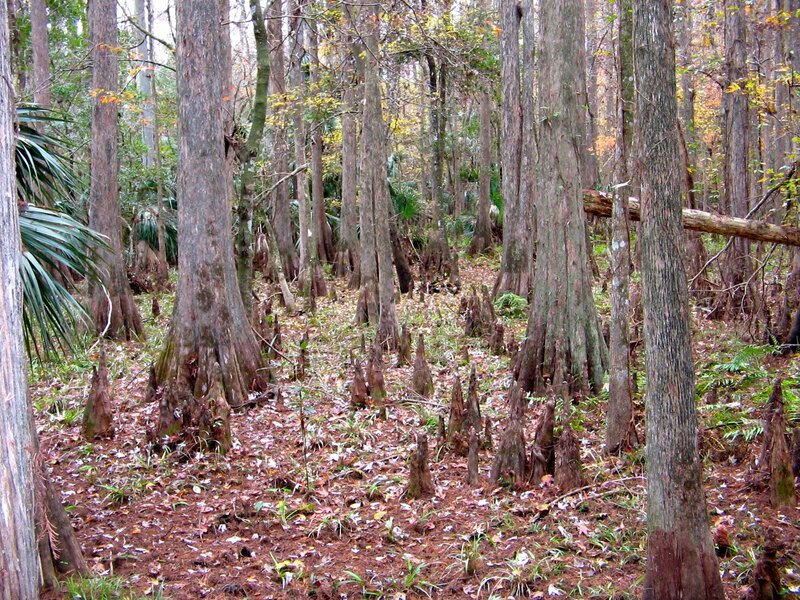 Notice in the third picture that this is a whole nest of alligators! 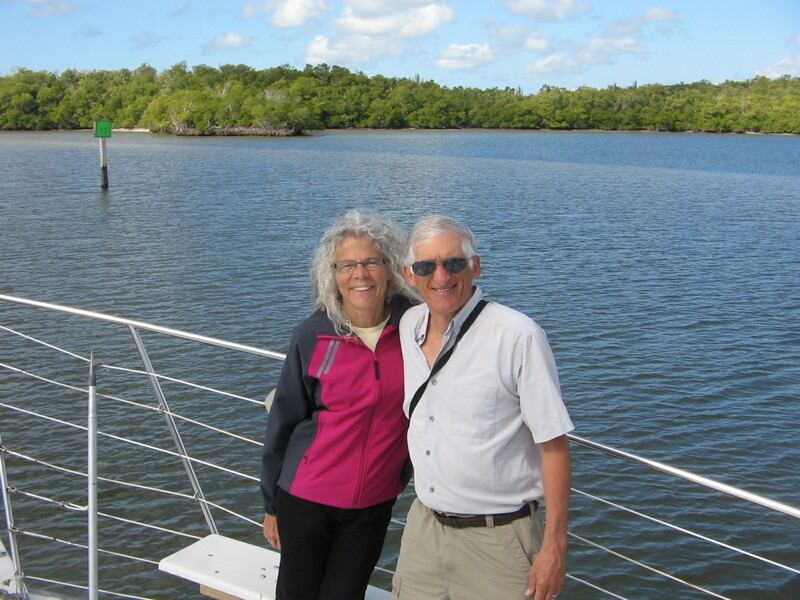 Our tour of the Everglades started at the western end and included time in the Big Cypress National Preserve, which adjoins Everglades National Park in the northeast. 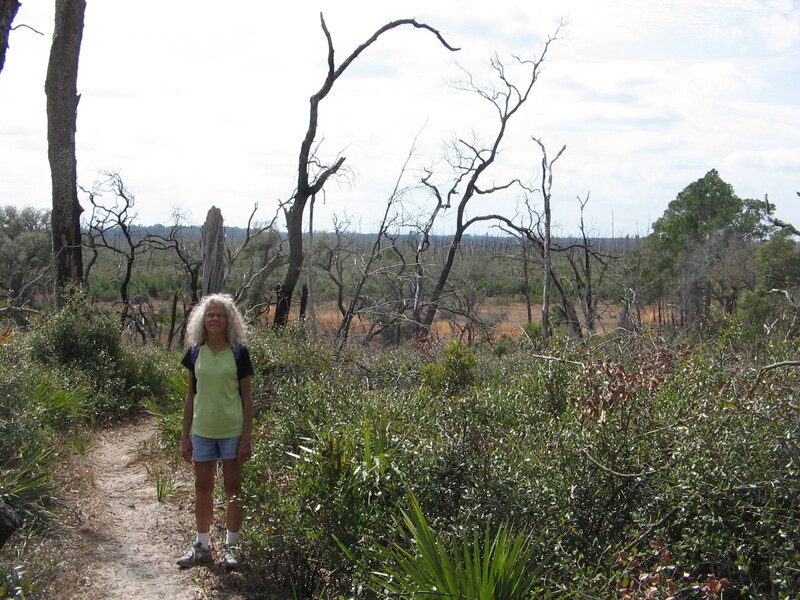 One of the activities here (besides stopping at roadside viewing areas to see alligators and at visitor centers to watch educational videos about the park and preserve) was to hike a portion of the Florida National Scenic Trail that goes through the preserve from north to south. 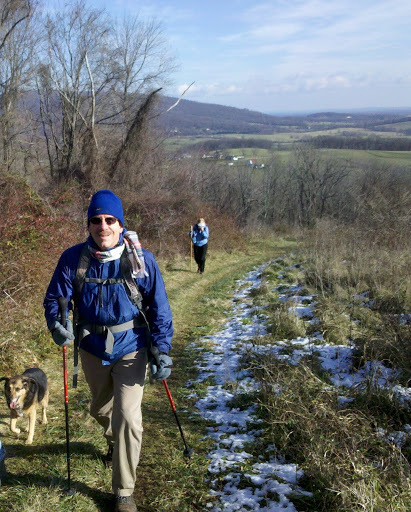 It was an interesting surface to walk on, not rocky like trails we are familiar with in the Shenandoah, but often rough terrain where the limestone bedrock was eroded and pitted. 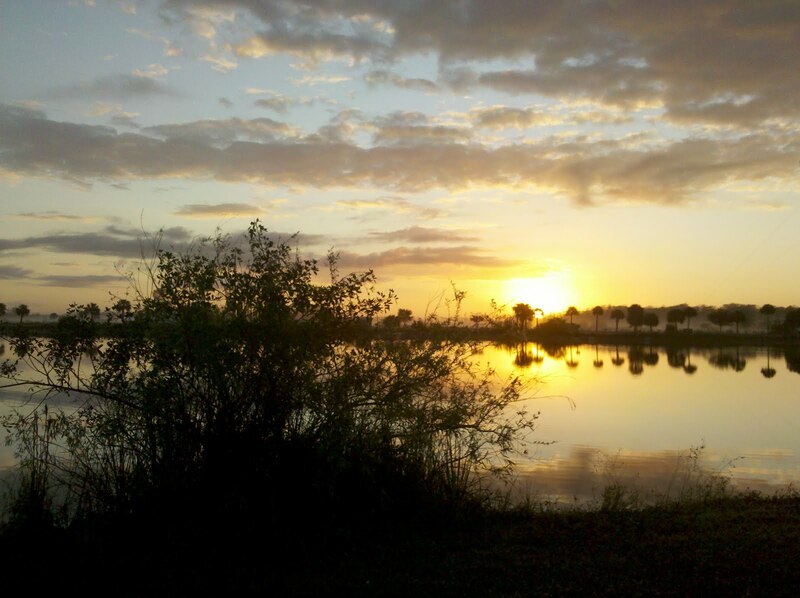 Our first night was spent at a nice, but rather pricey, motel in Everglades City. 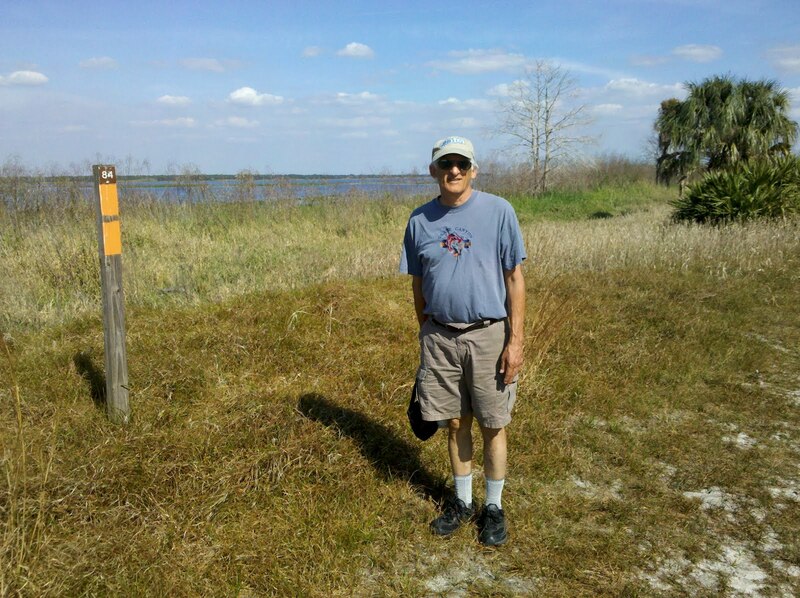 When we realized that we would want to spend more than one night, we decided to try our first campout of the trip and stay at the Monument Lake campground we had seen earlier in the day while driving through the preserve, not far from Everglades City. Even without having planned on camping out we found that we had all we needed to make it a pleasant experience. Sunrise over Monument Lake the morning after our campout. Early morning walk near the campground. Since we weren’t prepared for campsite cooking we did go into town and enjoy a nice seafood dinner at a local restaurant. My dinner included a cup of delicious stone crab soup. We learned that stone crabs are harvested locally in the bay and that it is illegal to capture and keep the whole crab. Instead, only one claw is cut off and the crab is put back in the water. If done correctly, the crab will regenerate a new claw for the next hungry tourist. A lot of what we learned about the Everglades was on a boat tour that we took from the park visitor center at Everglades City. The boat tour also provided the thrilling experience of watching a pod of dolphins race up to our boat and swim and play, jumping and rolling in the waves made by the boat’s wake. Unfortunately, we didn’t have a camera with a shutter fast enough to catch a picture of the dolphins. 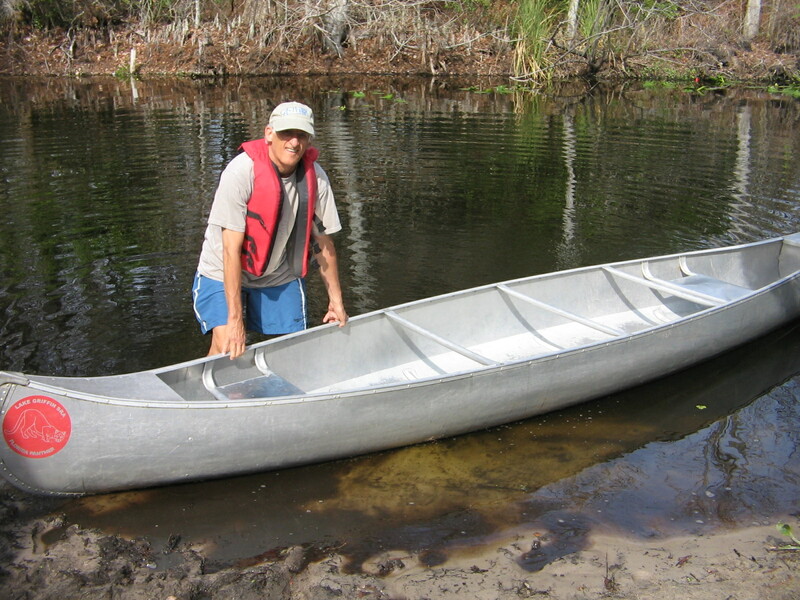 Lee on the boat before departing the dock. Two of us on the boat. 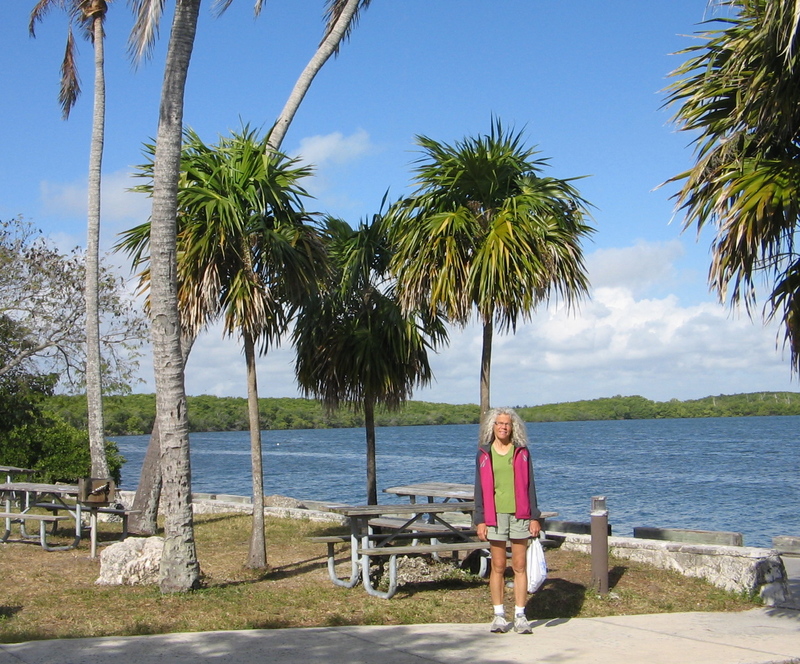 And we wouldn’t want to leave the western end of the Everglades without showing you the picture we took at the Ochopee Post Office, which is between Everglades City and the Monument Lake campground. 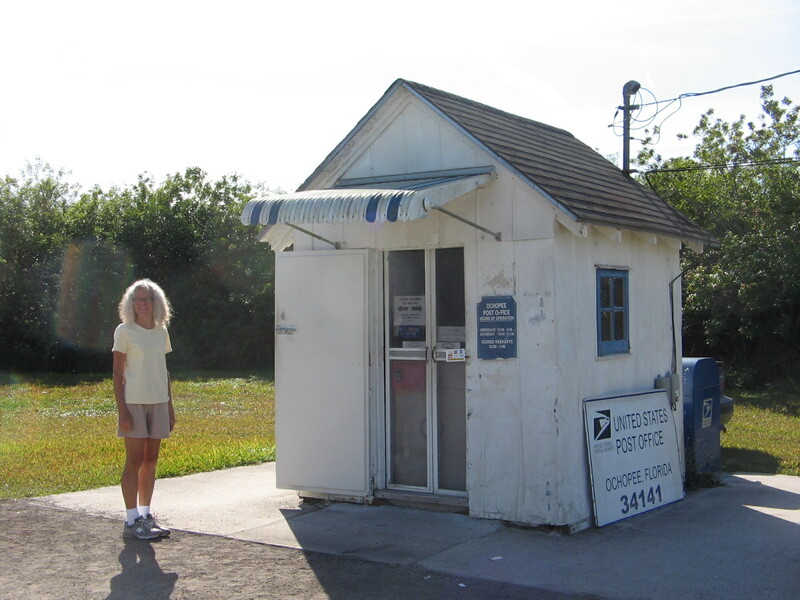 It is the smallest post office in the US, but only in the size of the building. The postmistress said that it is a busy post office and not on the list of post offices planned for closure by the US Postal Service. Of course, it’s busy with all of us tourists who stop and get postcards of the cute, little building. 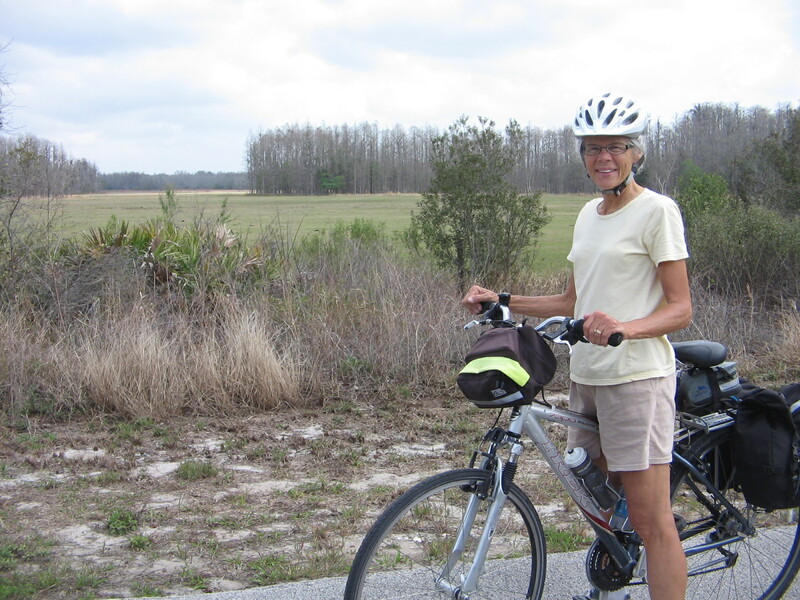 Midway through our Everglades experience we enjoyed a 15-mile bike ride through the area of the park called Shark River Slough. 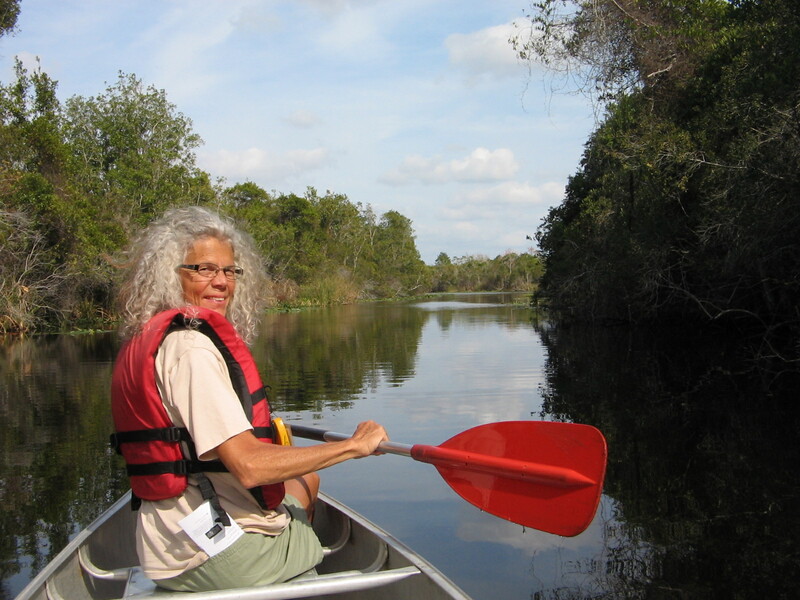 It should have been called Alligator River Slough, since alligators were visible everywhere along the ditches, but obviously no sharks in the middle of the everglades. 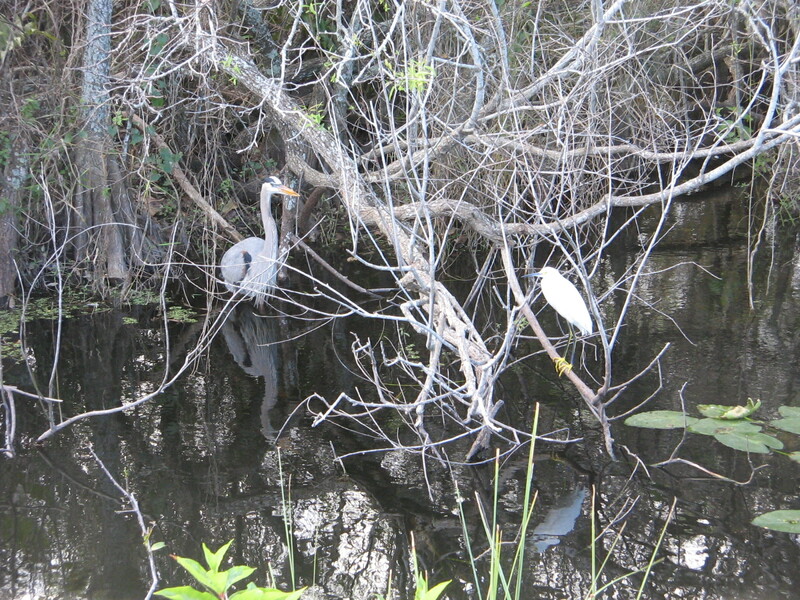 And, as in so many of the other areas of the park, clouds of herons, egrets, wood storks, ibis, and anhingas, to name a few, were everywhere. What I found particularly interesting about this trail is that it was an asphalt road built to carry tourists by tram on a circular route with a stop midway at an observation tower. The bikes were allowed to share the road by pedaling in the opposite direction of the trams and then pulling over and stopping whenever a tram was approaching. 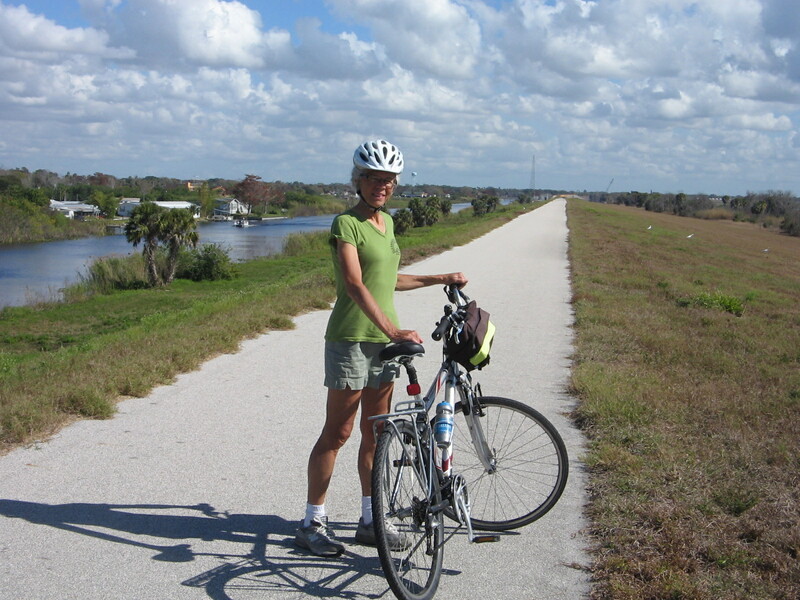 Our overnight stay Tuesday night was at a motel in Florida City, which is at the eastern edge of the Everglades. Wednesday morning we took a short side trip to Biscayne National Park which is within viewing distance of Miami across the Bay. 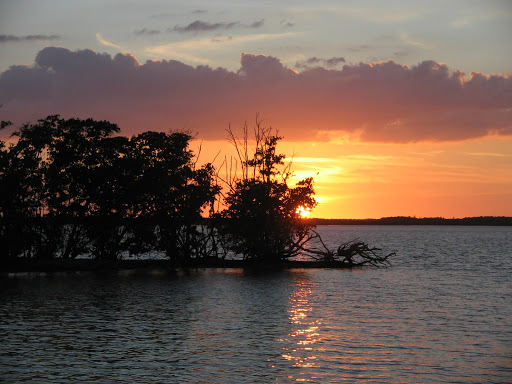 It is also the northernmost part of the Florida Keys. We didn’t take time to drive down into the Keys, but, hey, you can’t do everything. 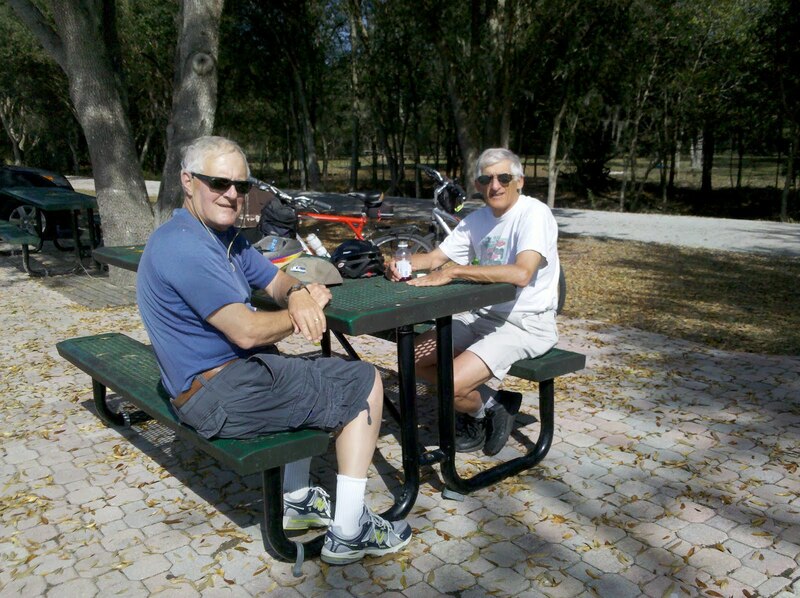 Before saying goodby to the Everglades, we drove in through the Ernest F. Coe Visitor Center and found a picnic area for lunch at Long Pine Key. 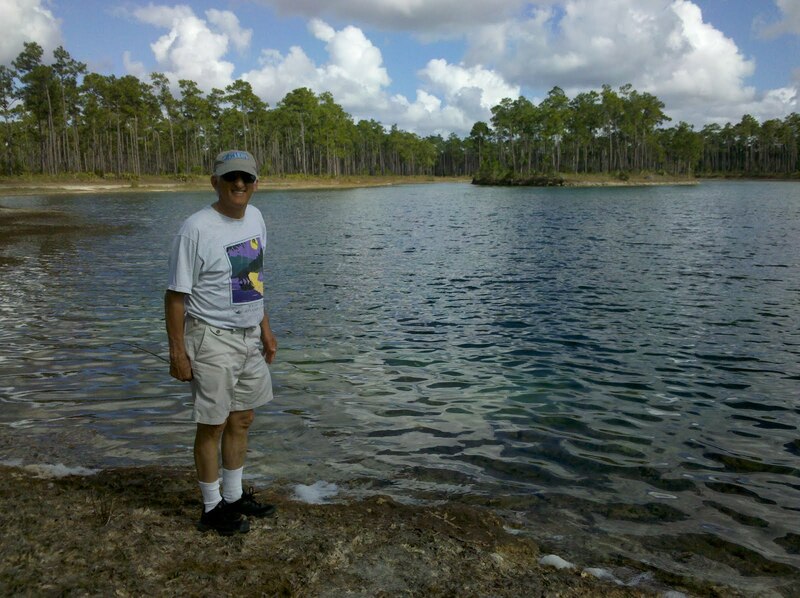 After lunch we walked on a trail through the pines that came out on the shore of a small lake. 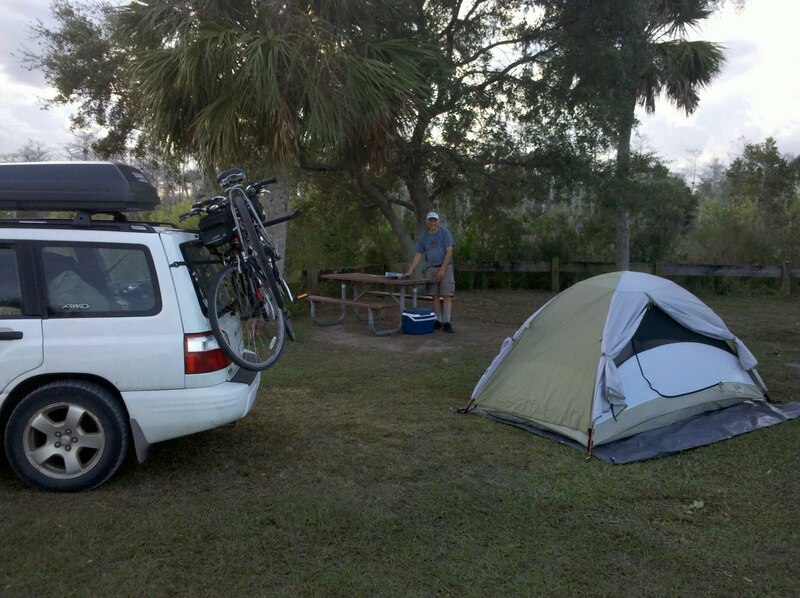 Wednesday night found us camping again, this time at a Corps of Engineers campground in the town of Pahokee on the shores of Lake Okeechobee. 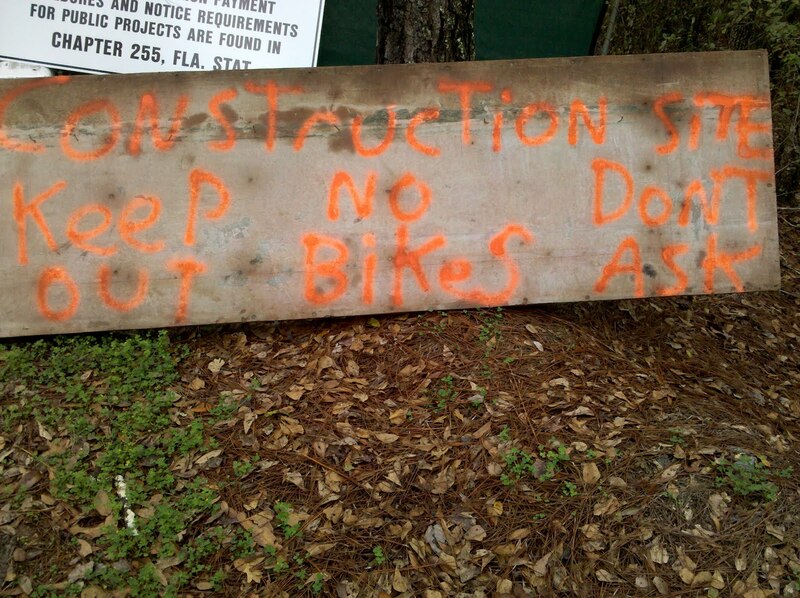 Don’t you just love the names of the places in Florida? 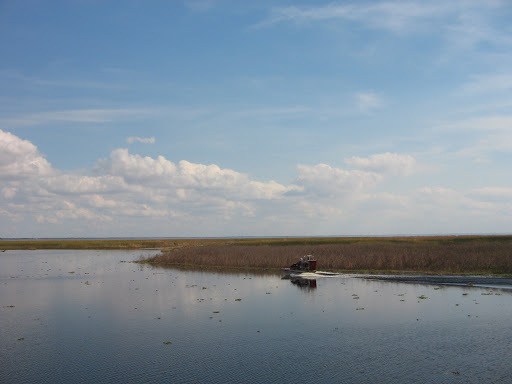 Lake Okeechobee is the second largest freshwater lake in the continental US (bonus points for knowing what the largest one is). 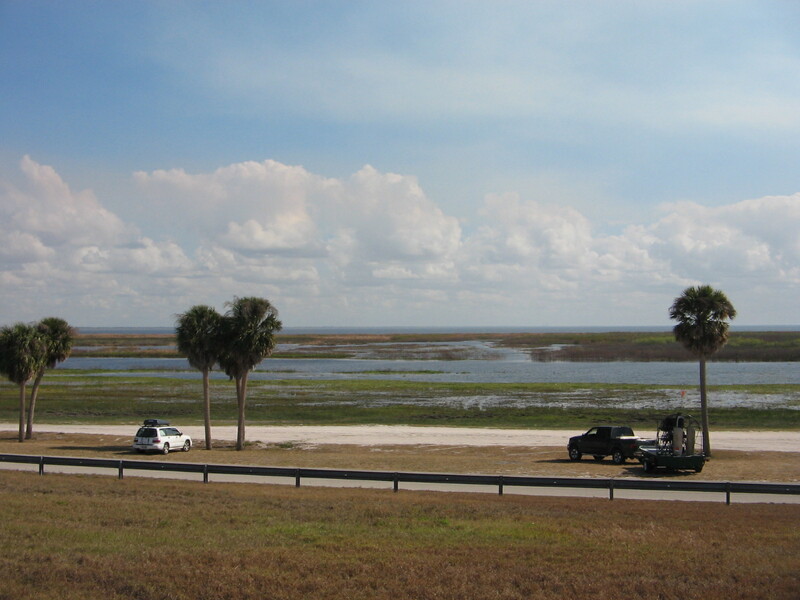 Herbert Hoover Dike was built around the lake in the 1930’s for flood protection. 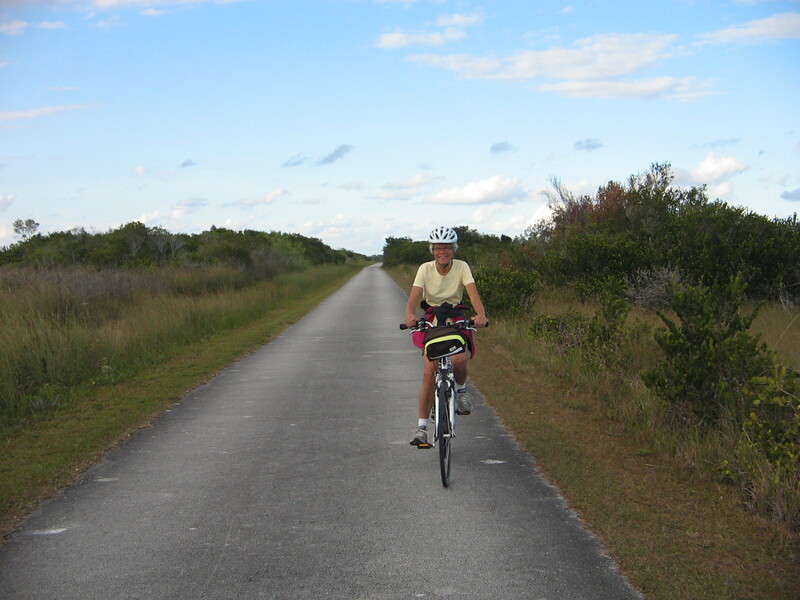 There is a paved and off-road trail called the Lake Okeechobee Scenic Trail (LOST) atop the dike. 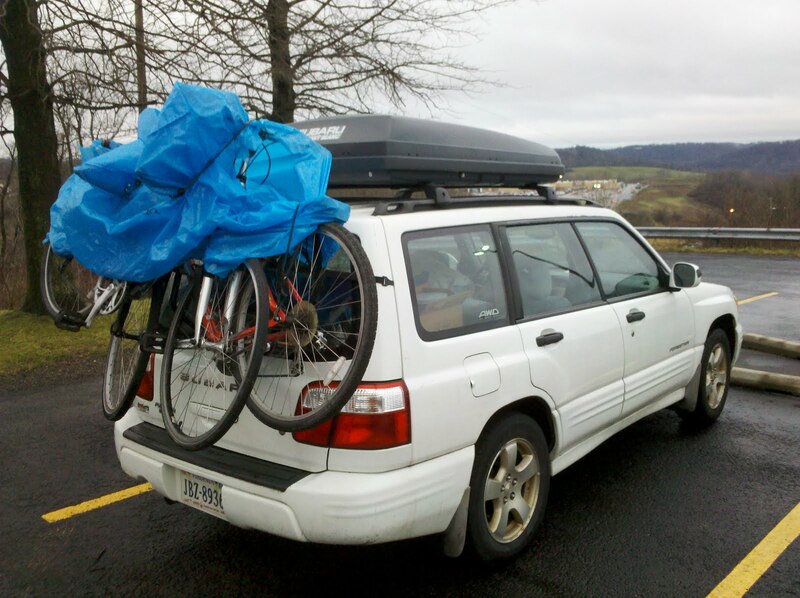 And wouldn’t you know it, but our intrepid travelers had to get their bikes off the car and see what it was like to pedal the LOST trail. Pretty hard to get lost on it, that’s for sure. 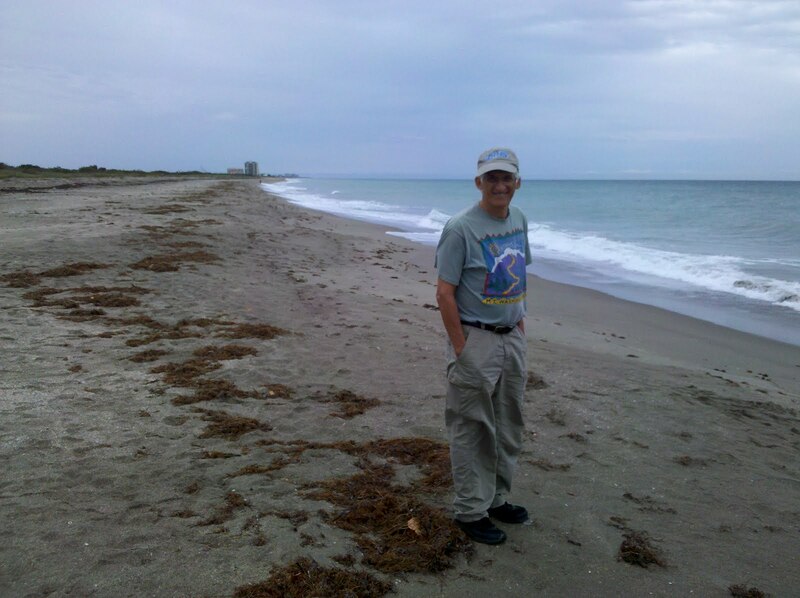 So tonight, as I mentioned, we are in Fort Pierce, on the Atlantic Ocean side of Florida. 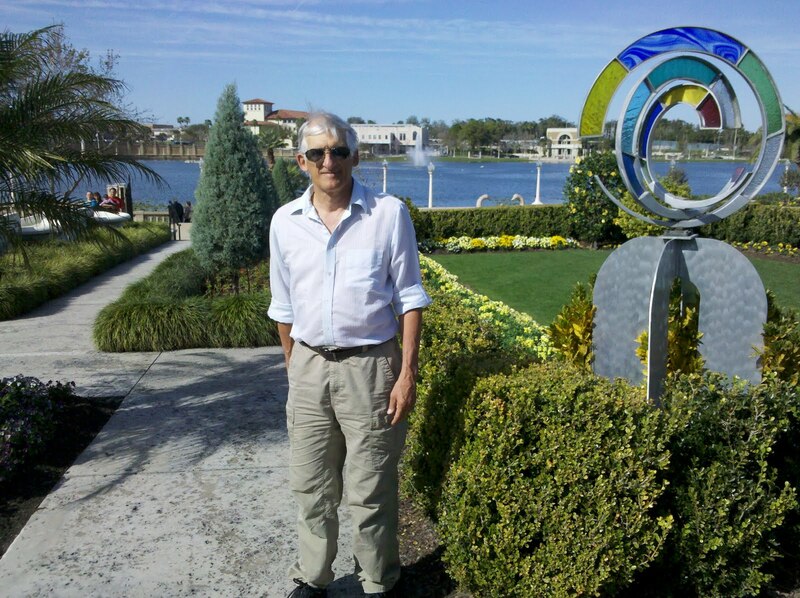 This area is known as the “Treasure Coast” from a number of ships of Spanish galleons that wrecked off the coast during the 17th and 18th centuries. We don’t plan to dive for sunken treasures, but as this adventure continues, who knows what treasures await us. After so many days of being on the road we knew it was time to find a place to stop and spend at least a week. After researching our options we decided to try out the Value Place extended stay hotel chain that is located in a number of Florida cities. 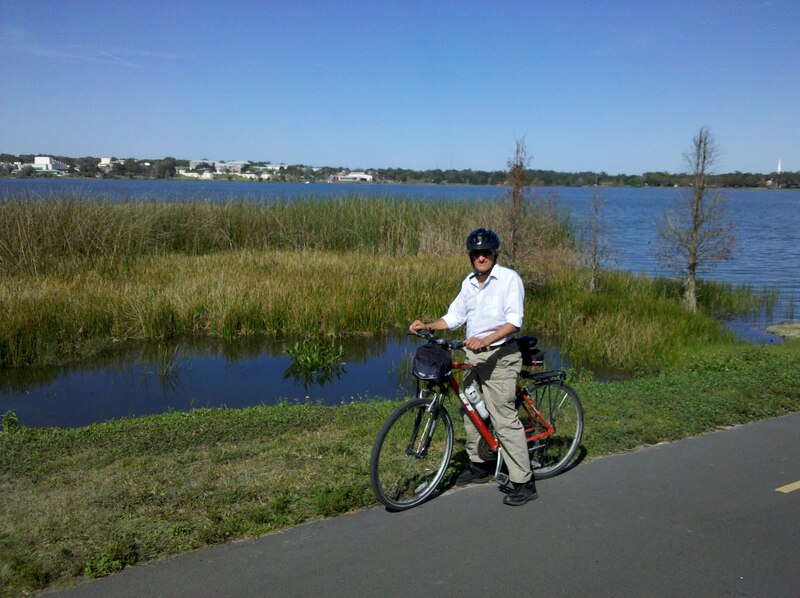 Lakeland, Florida, seemed like a centrally-located city with enough surrounding options to keep us occupied for a week. 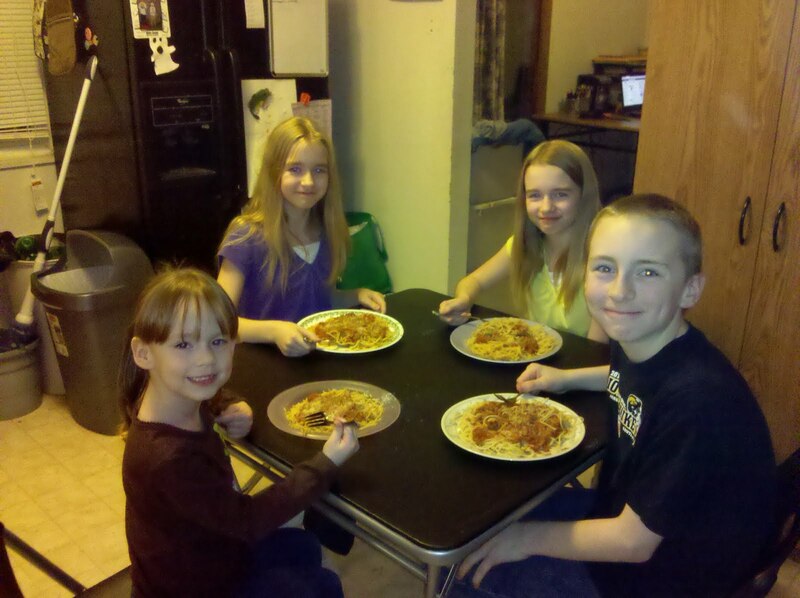 It is also close to our friends from Virginia, the Clendenin’s, who spend the winter months here in their RV. 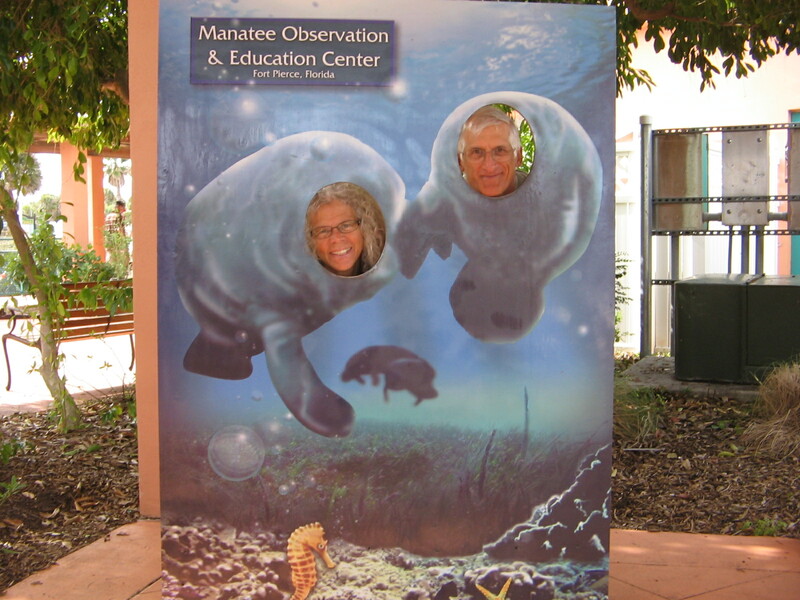 Friday morning before leaving Fort Pierce, we spent some time in the downtown area, which included a visit to the Manatee Education Center. 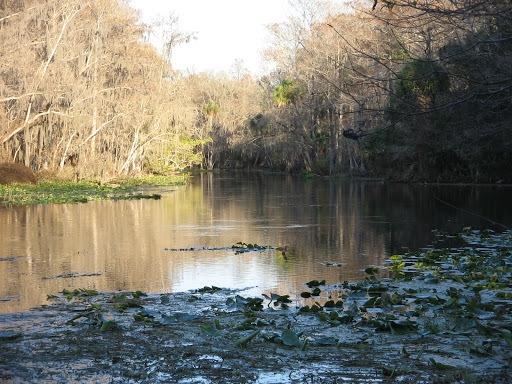 Besides the indoor and outdoor exhibits we had an opportunity to watch a group of manatees hovering just beneath the surface of the water in the ditch behind the center. 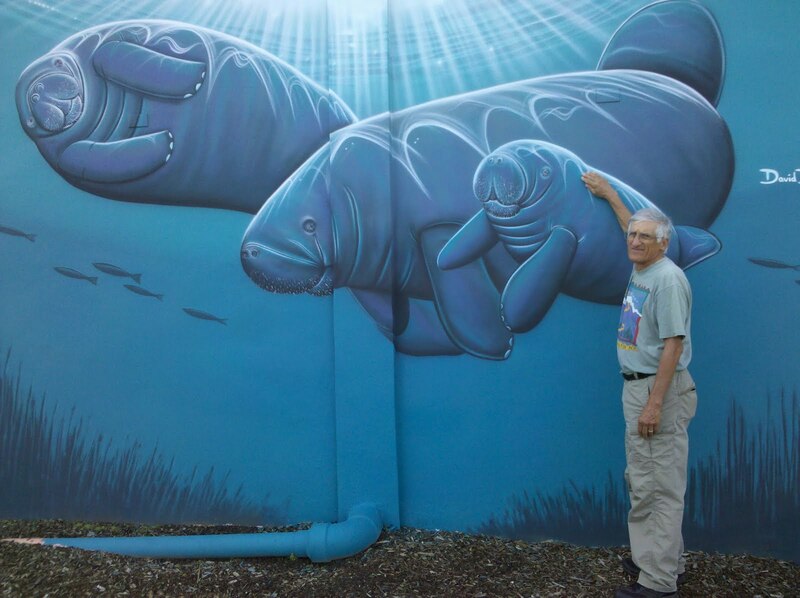 The manatees like the ditch because it is an outlet from a city utility plant. The water flowing into the ditch from the plant is warmer than the surrounding water and manatees crave warmth (I know how they feel)! One of the things we learned about manatees is that the leading cause of death for them is pneumonia. They don’t have a thick skin nor a high metabolism to help them stay warm. Leaving the Manatee Education Center we took a short drive across the inlet to check out the nearby beaches. 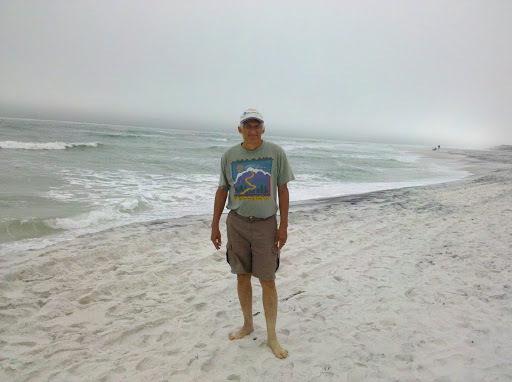 The beaches on the Atlantic side of Florida are different from the Gulf coast beaches. It was a windy day, rather chilly, and the waves were rolling in. 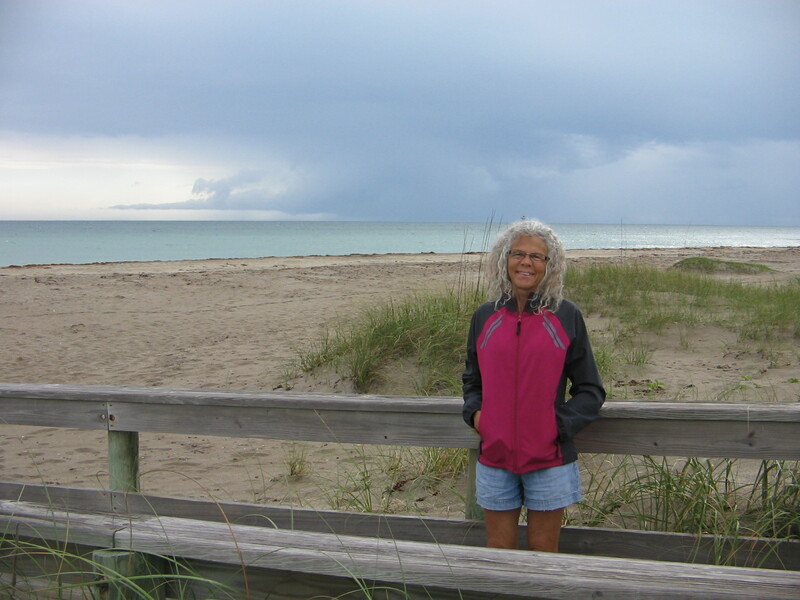 Standing there in the wind reminded me of other beach visits over the years in places like Virginia Beach, VA, or Ocean City, Maryland. 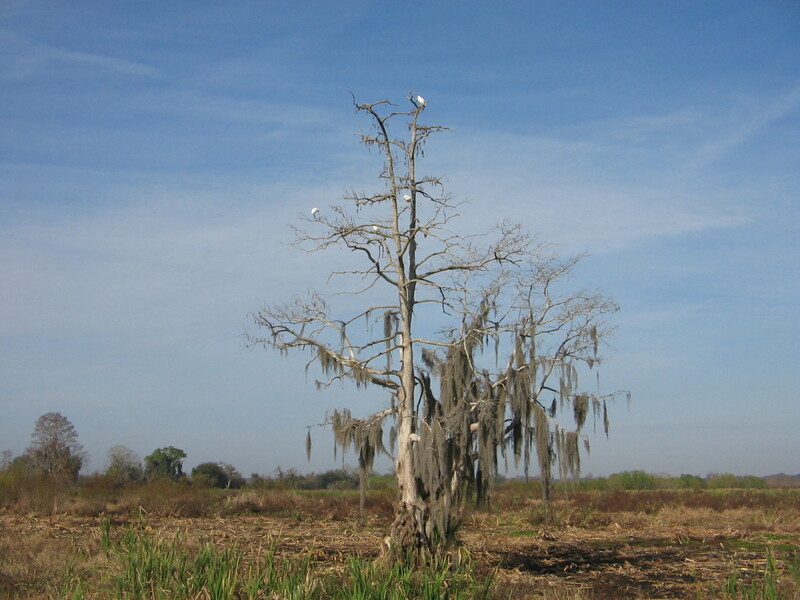 It seems like whenever I’m there it’s cold and windy and I want to just get somewhere warm like it was when we were at the Everglades. Still a lot warmer, though, than it would have been in Virginia or Maryland. 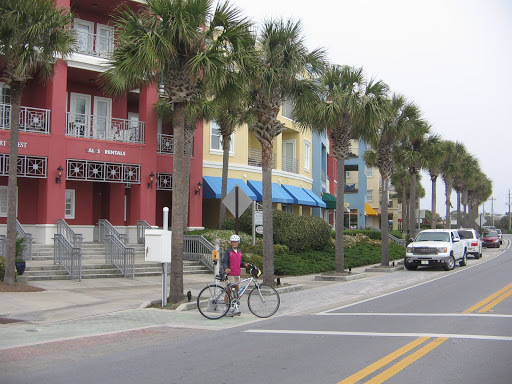 On our drive across Florida to reach Lakeland from Fort Pierce we stayed off the major interstates to get a better feel for what Florida is really like. 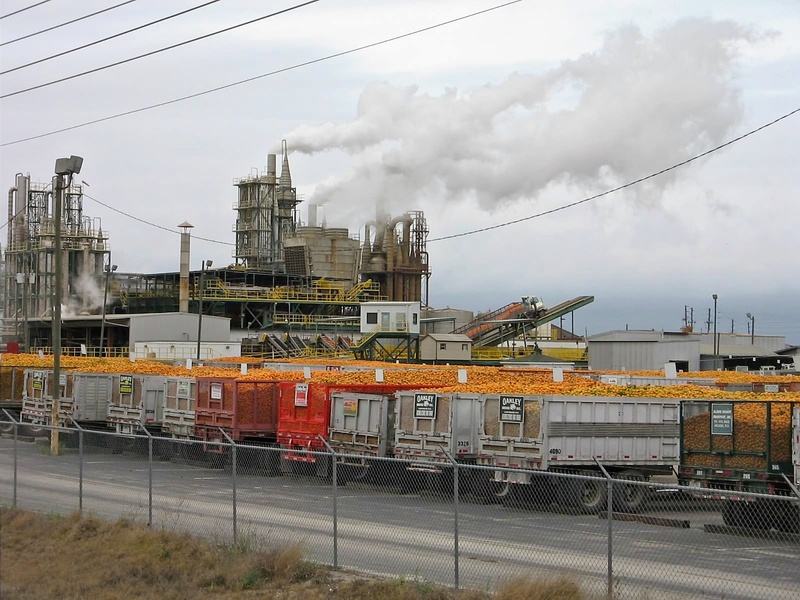 Lots of cattle ranches and orange groves and orange juice processing plants to look at. Here in Lakeland we are enjoying the chance to get our bearings and know that we don’t have to pack up the car again until Friday. 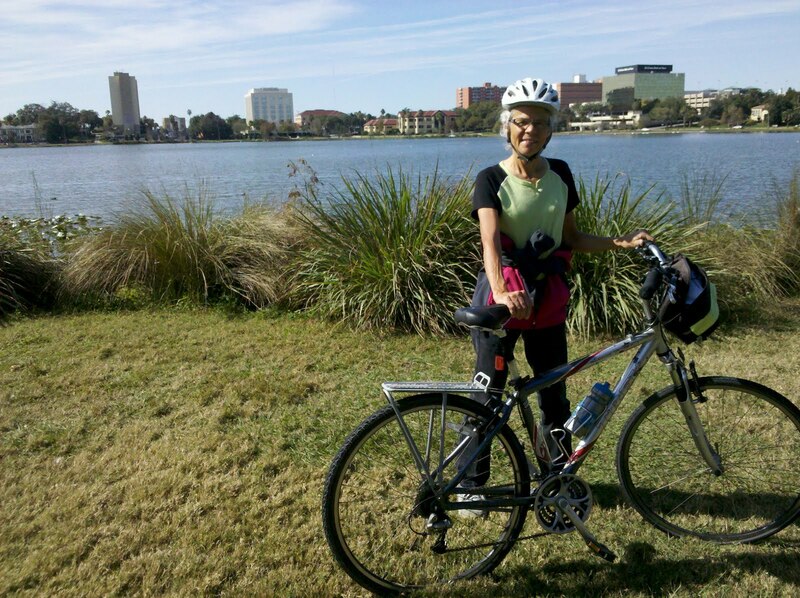 Saturday we got on our bikes and explored the Lake-to-Lake bicycle route. Lakeland is appropriately named. 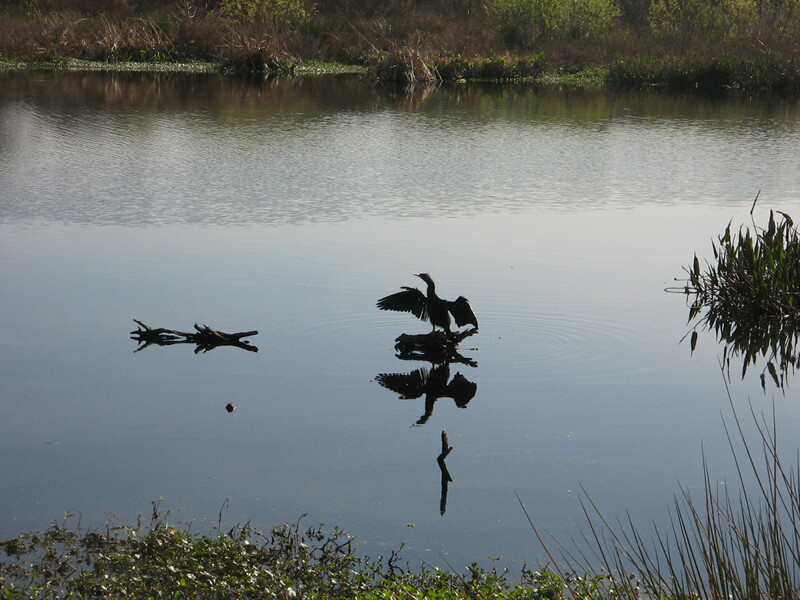 There are multitudes of small lakes in and around the city. 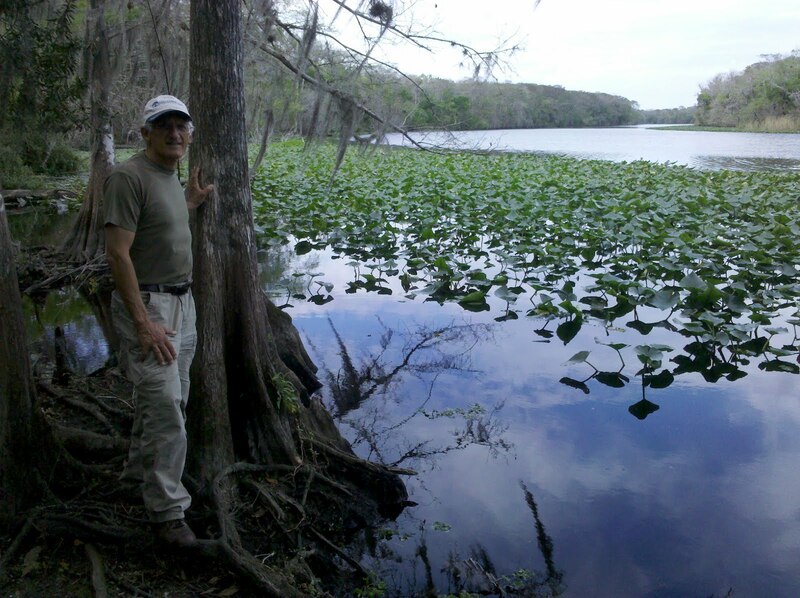 Lake Hollingsworth, first lake on the Lake-to-Lake route. Lake Morton, close to downtown. 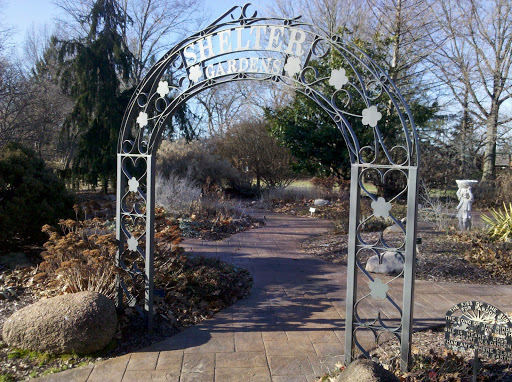 Hollis Gardens, close to downtown. Yesterday we attended church with our friends, the Clendenin’s and got a tour of the area where they live in Polk City, which is a small town close to Lakeland. Today we are catching up on some business and taking time to figure out where things are around the city. Our hotel offers internet, but we have found it to be frustratingly unreliable. We are now happily working on our computers using the great wireless service that is offered for free at the Lakeland Public library. Either a cold front has moved into the state or it just isn’t as warm here as it was in southern Florida. 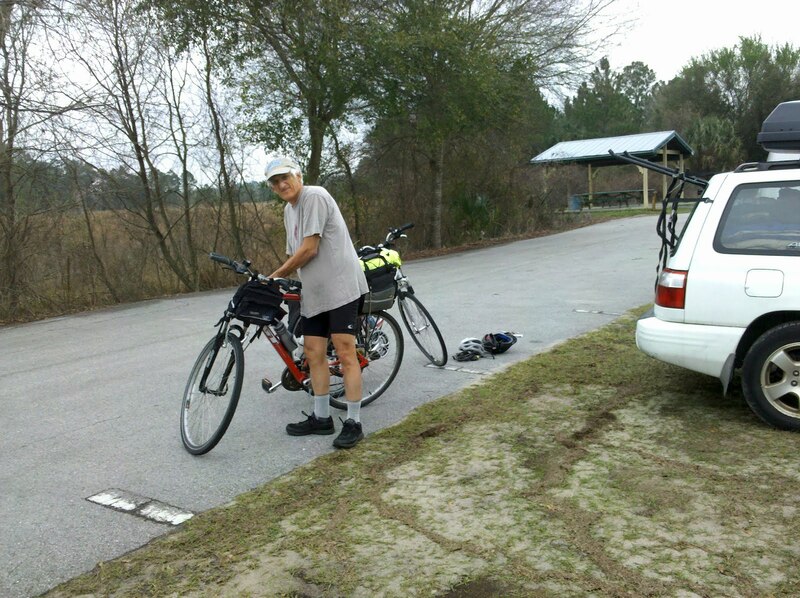 Our bikes are on the car and if it warms up enough this afternoon we will explore another bike trail here in town. Meanwhile, it is nice to have a few days to know we don’t have to be on the move and that we have a stove where we can cook actual dinners. We have had a truly enjoyable week in Lakeland, but today it’s time to move on. 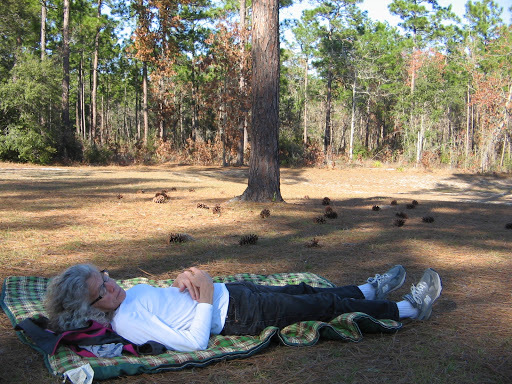 We made camping reservations for tonight and tomorrow night at Lake Griffin State Park, about 60 miles north of here. The weather is still warm, although there is some chance of rain showers for the weekend. Let’s hope not. 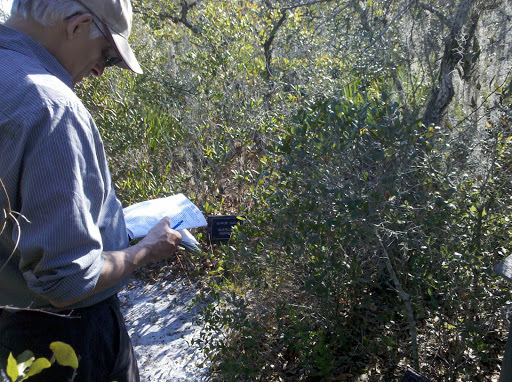 Each day in Lakeland found us studying our maps and brochures to help decide what park or bike trail we wanted to visit for that day. Even with a week to look around I think there are some things we would still want to investigate if we are ever back in this area. 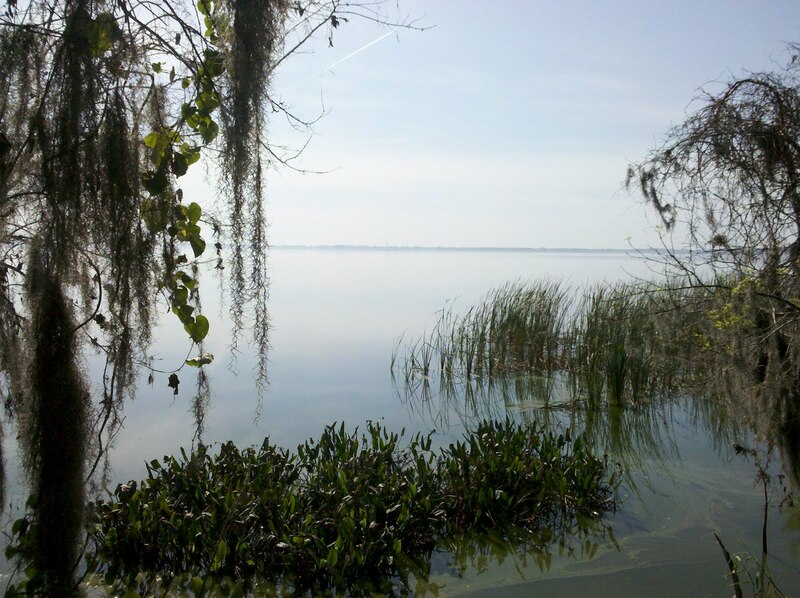 Lakeland has a lot to offer for those who enjoy outdoor activities and history. 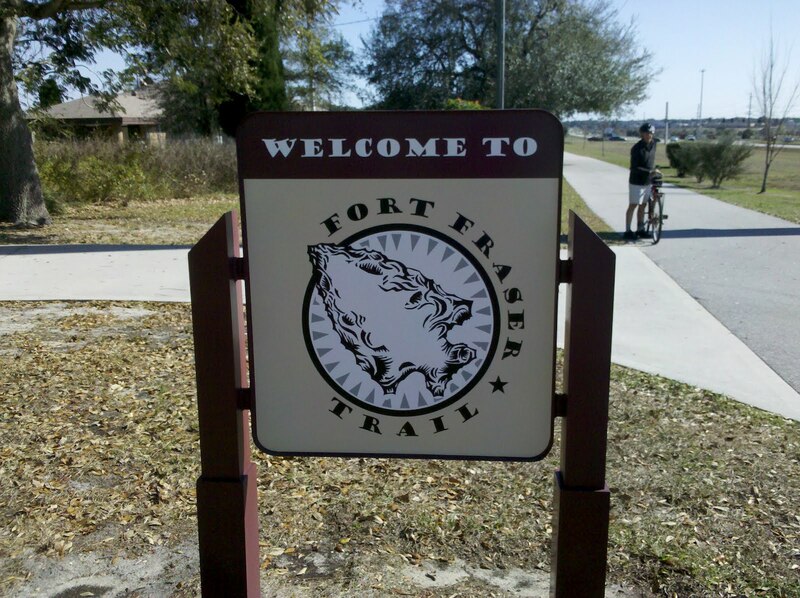 Monday afternoon we drove south of town to the trailhead of the Fort Fraser Trail. 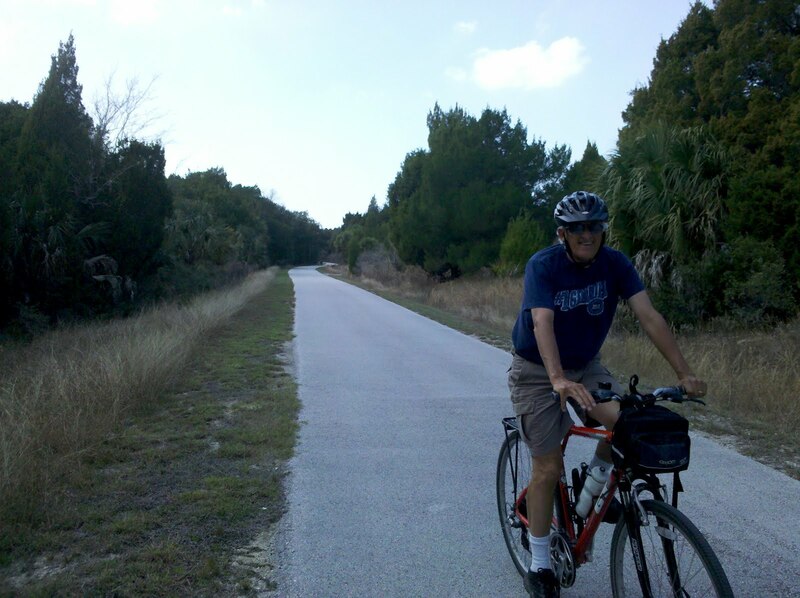 This was a 7 1/2 miles out and back that paralleled Highway 98, from Lakeland, through Highland City and on to Bartow. For most of the distance it was far enough away from the highway that the traffic wasn’t too annoying. 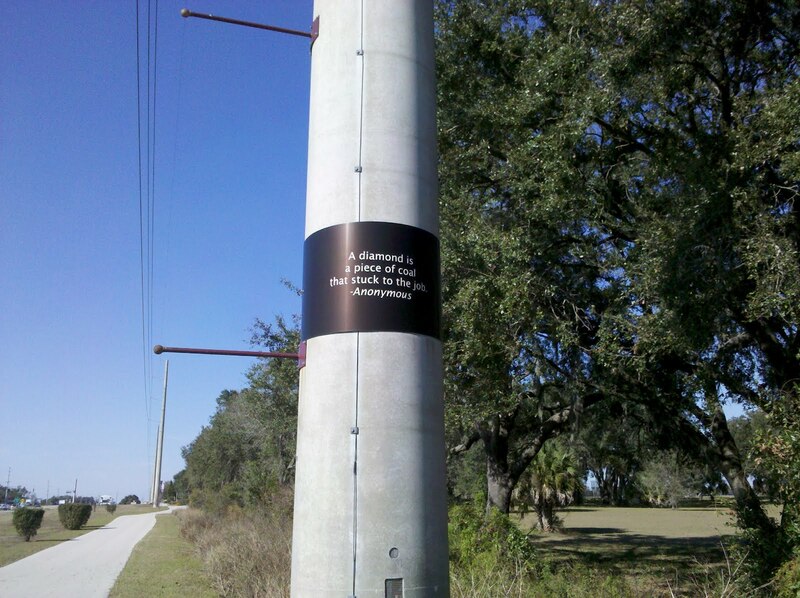 Besides a number of descriptive signs along the way that educated us on the history and ecology of the area, we enjoyed reading the motivational sayings that were on the utility poles along the trail. 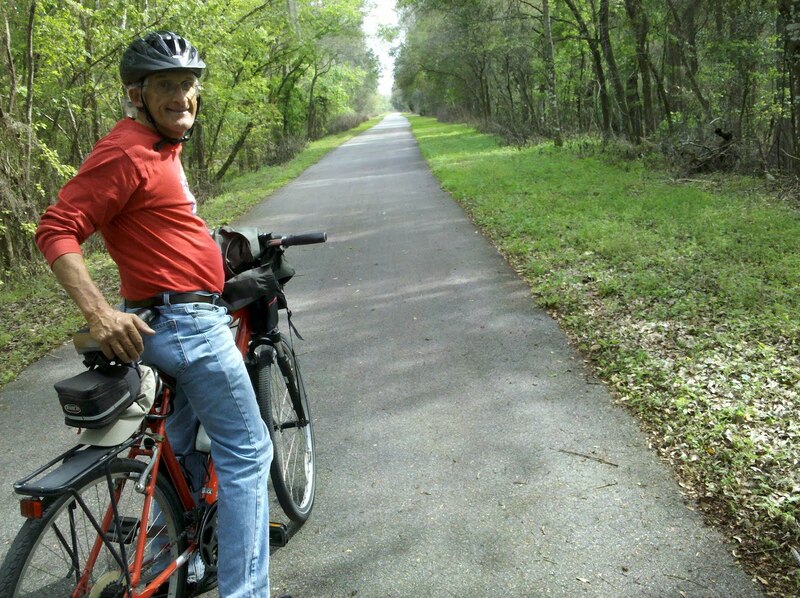 On Tuesday, we made plans to do a bike ride with Gene Clendenin, on a trail that is near the RV park in Polk City where he and Mary Jane park their RV in the winter months. 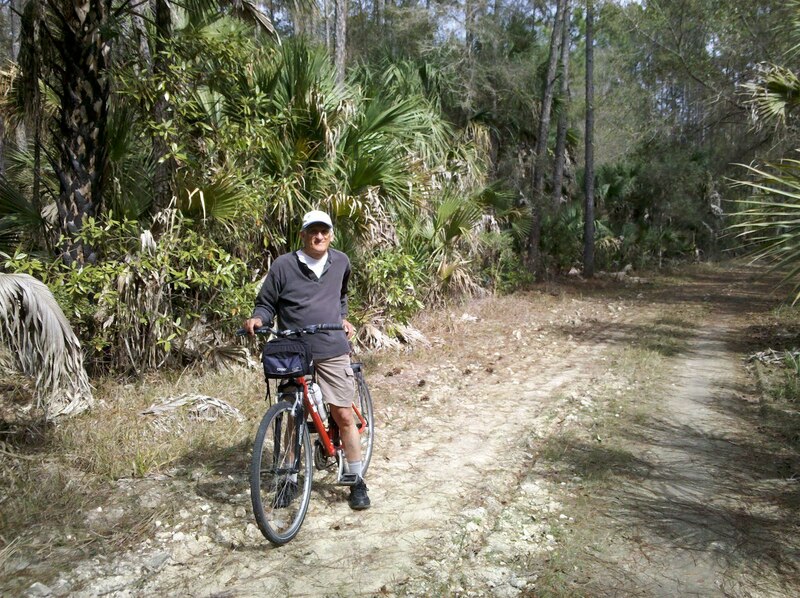 This trail was 5 1/2 miles out and back to the small town of Auburndale. 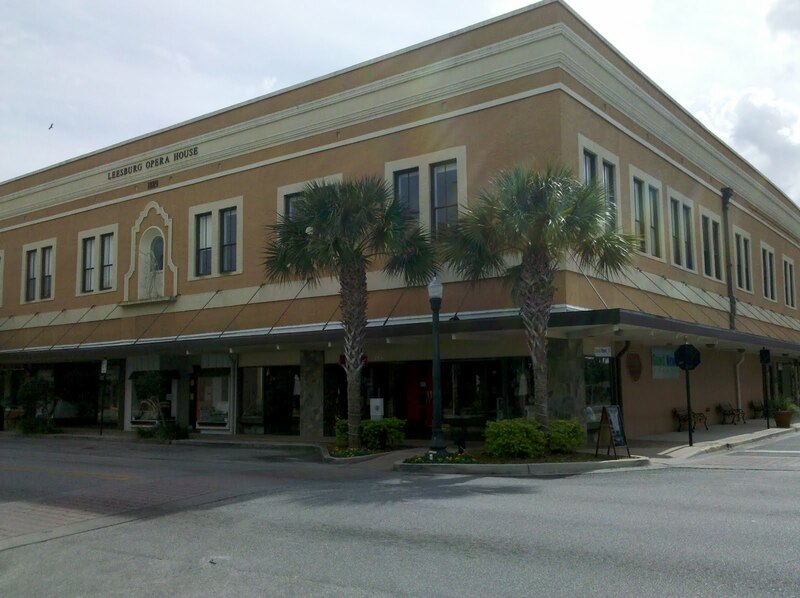 On the Sunday sightseeing trip in the car with the Clendendin’s we had driven through the downtown of Auburndale and thought it would be a cute town to explore further and maybe treat ourselves to some ice cream. 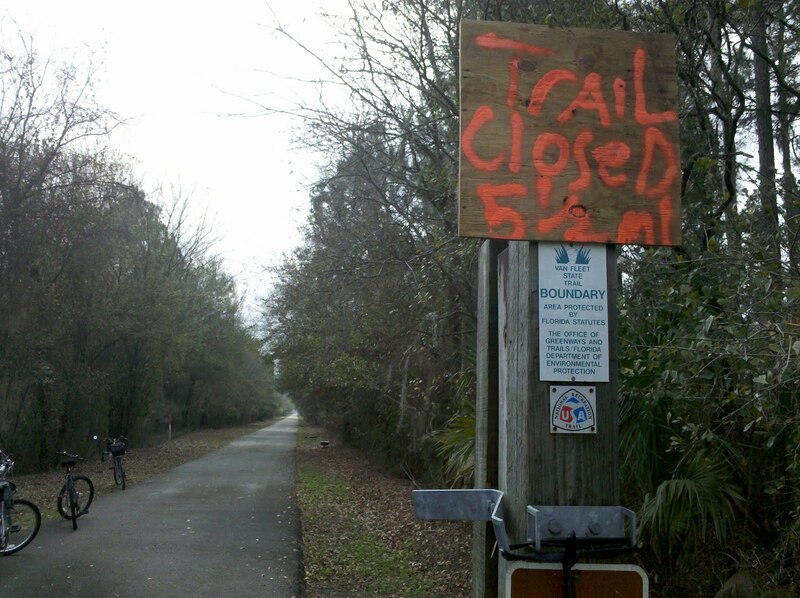 Unfortunately, the trail ended on a rural road that was not close enough to downtown for us to visit on our bikes. So no ice cream treat, but still an enjoyable ride. 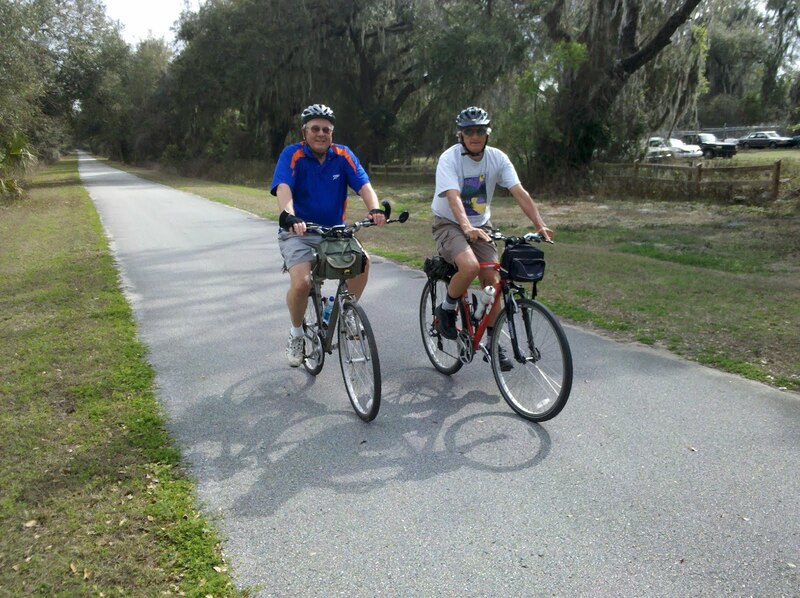 Gene and Lee pedaling on the trail. 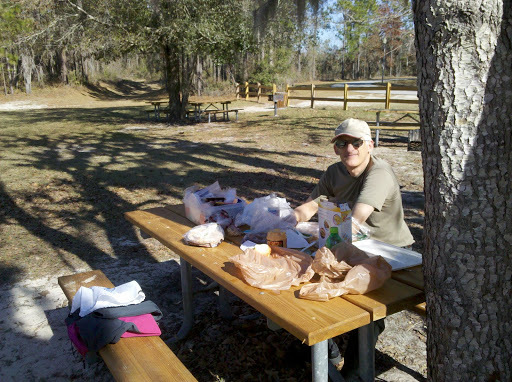 Resting at a picnic table at the turnaround point. 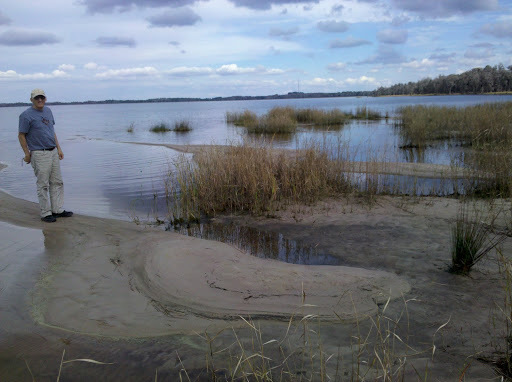 On Wednesday we decided to extend our explorations further afield by doing a bit of driving to check out the state park at Lake Kissimmee. 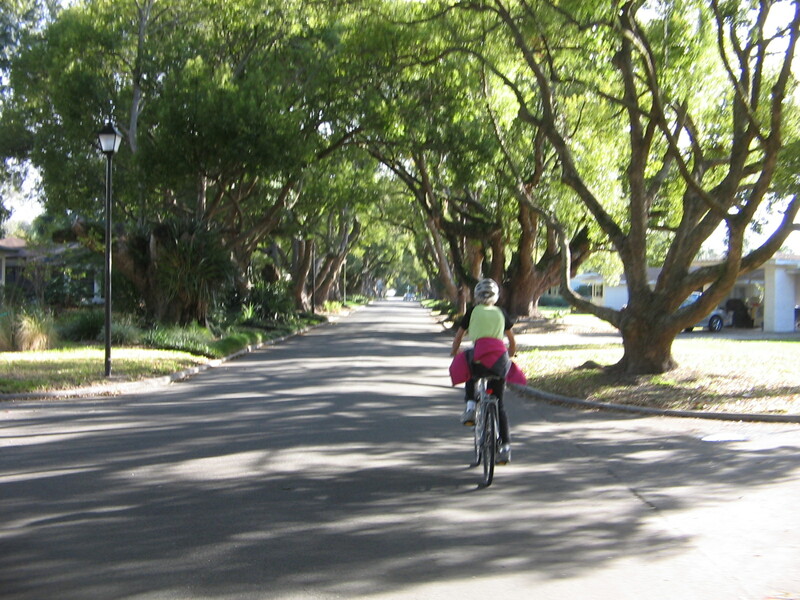 A “bit of driving” in Florida at this time of year can rather quickly become a larger amount of driving. There is so much traffic on the roads and our route took us through a lot of stop and go intersections, since we weren’t on an interstate. 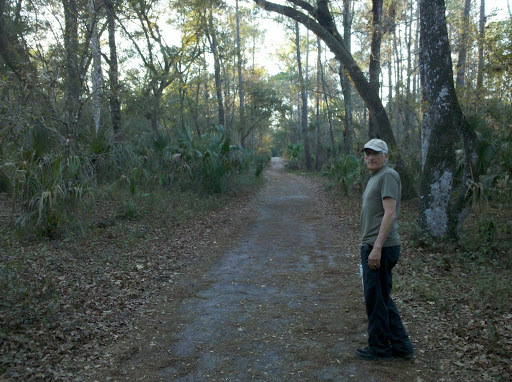 There were some nice trails to walk at the park, but given the amount of time we had to spend in the car getting there and back we decided we would have been better off doing something closer to Lakeland. 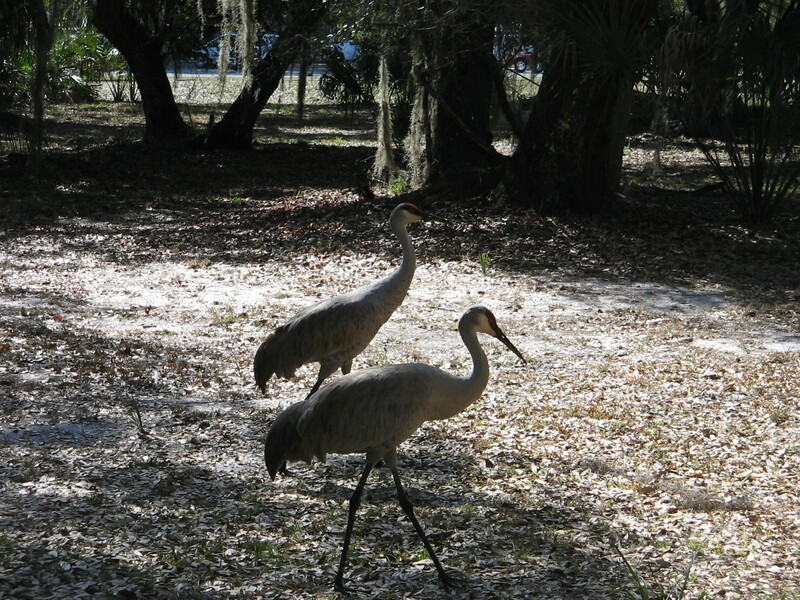 2 sandhill cranes in the picnic area. 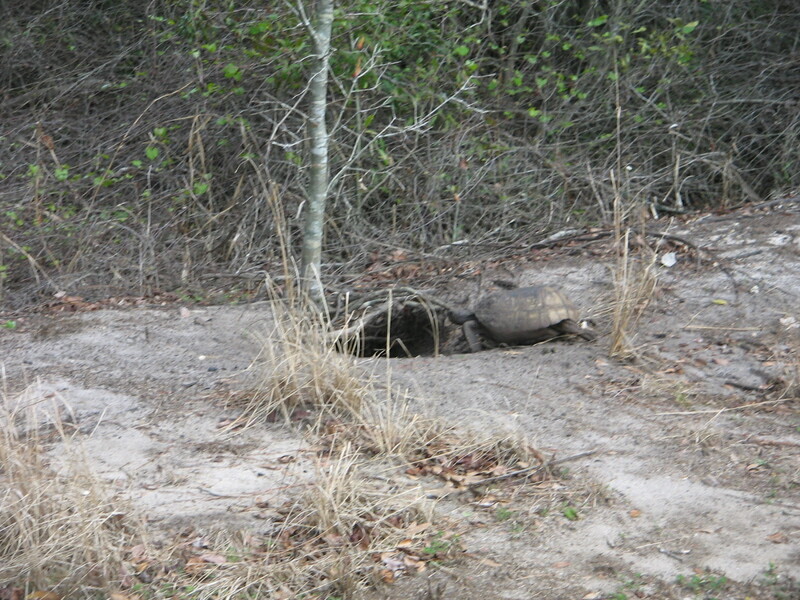 We thought we were seeing some wildlife (we hadn’t seen much at all on our walk to the lake) and excitedly took pictures. Later when we were getting in our car we saw these same 2 birds walking right up to some picnickers and begging for handouts. 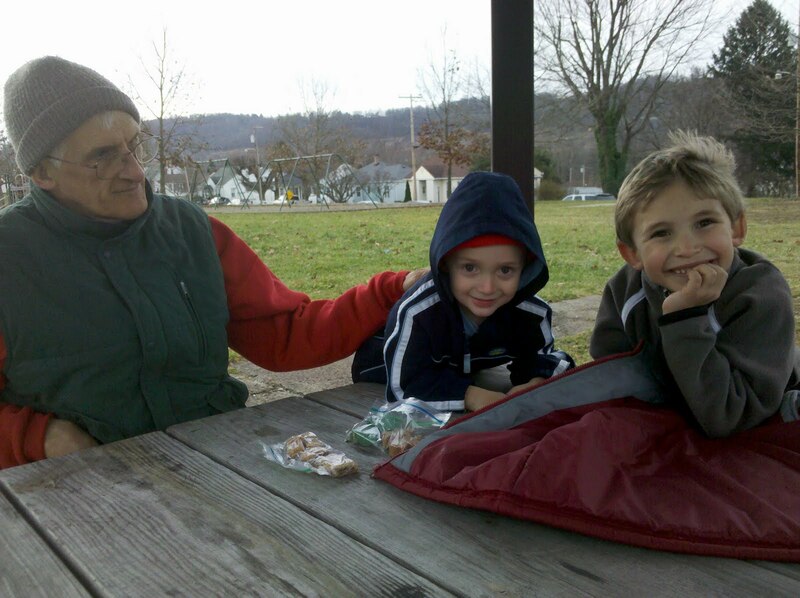 The beggars were totally unafraid, even with a dog near the picnic table where they were begging. 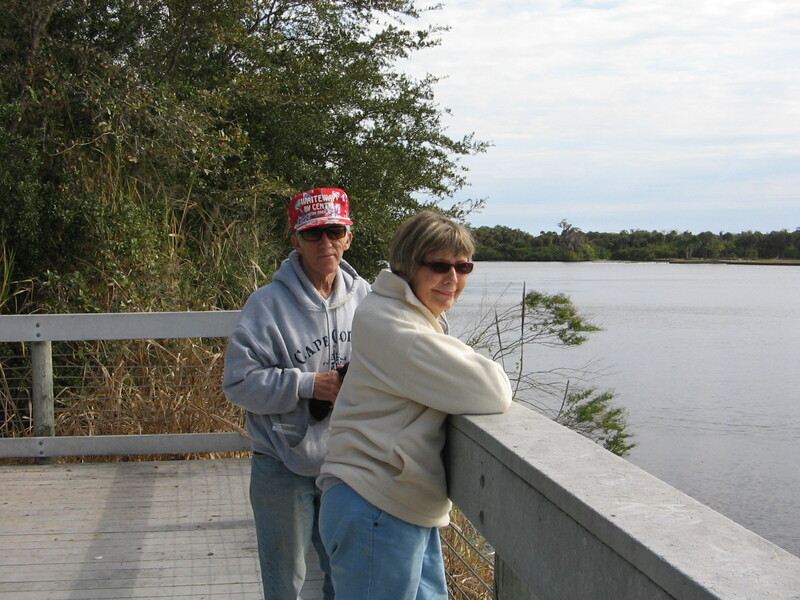 One of the most valuable things that we gained on our walk at Kissimmee State Park was a tip from 2 fellow walkers who had stopped to chat about the lack of wildlife viewing that day. 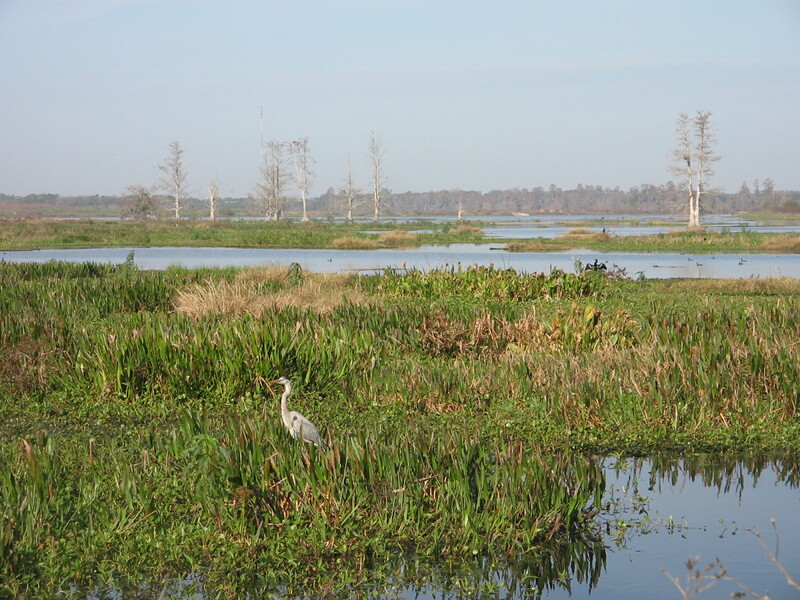 They told us that one of the best places to visit for seeing birds and alligators was the Circle B Bar Reserve, just outside Lakeland. I think I may have heard mention of it or seen a sign but I didn’t pay attention because I thought it was some kind of bar! Actually, the name comes from the brand of the cattle ranch that was once on the property. 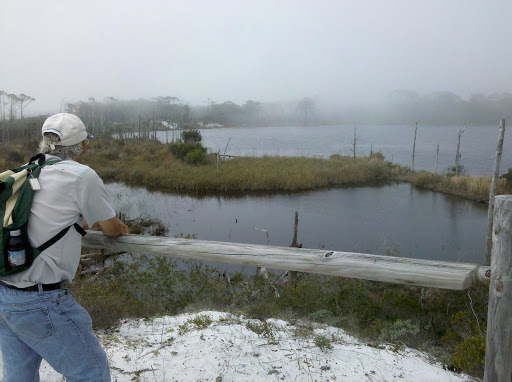 Thursday morning we made plans to visit Circle B Bar Reserve and we were not disappointed. We didn’t have a map or much information to go on and just parked at the first place we saw by a trailhead, thinking there was just one trail into the reserve. 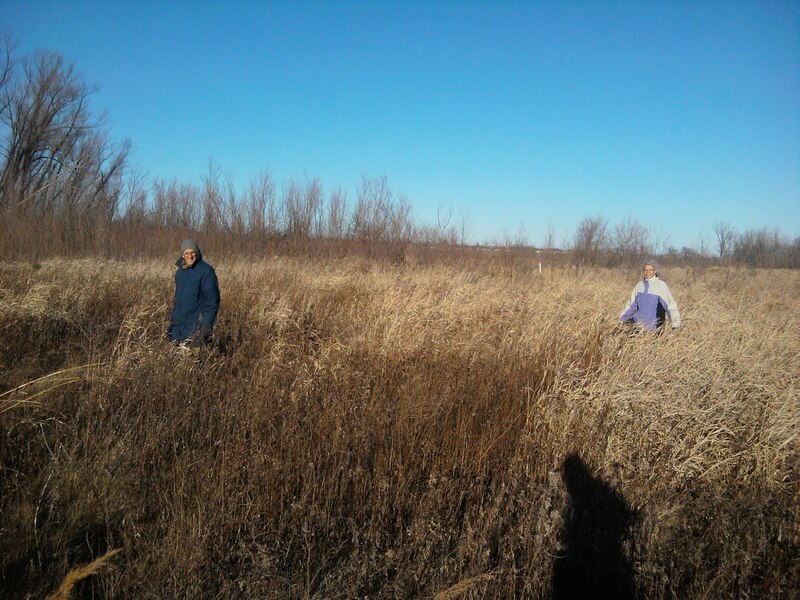 Before long we found ourselves in the true wonder of the extensive marshes and wetlands that are part of the reserve. 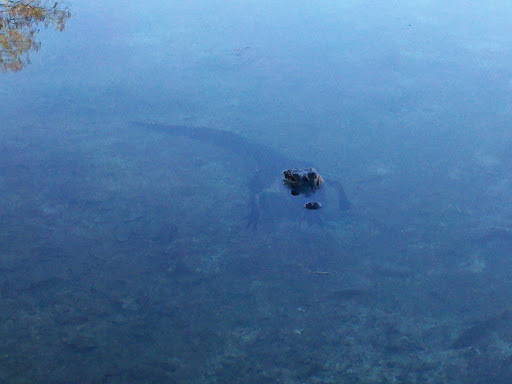 An alligator with his head up, unlike most of them we have seen that are just flat, stretched out lazy. Anhingas are these birds that are everywhere in the trees and on wires and, in this case, standing in the water, but what’s fun about them is the way they stand with their wings spread out in the sun to dry themselves off. We walked much further than we had planned, even discovering that the trail eventually went to Lake Hancock with a dock to walk out on. 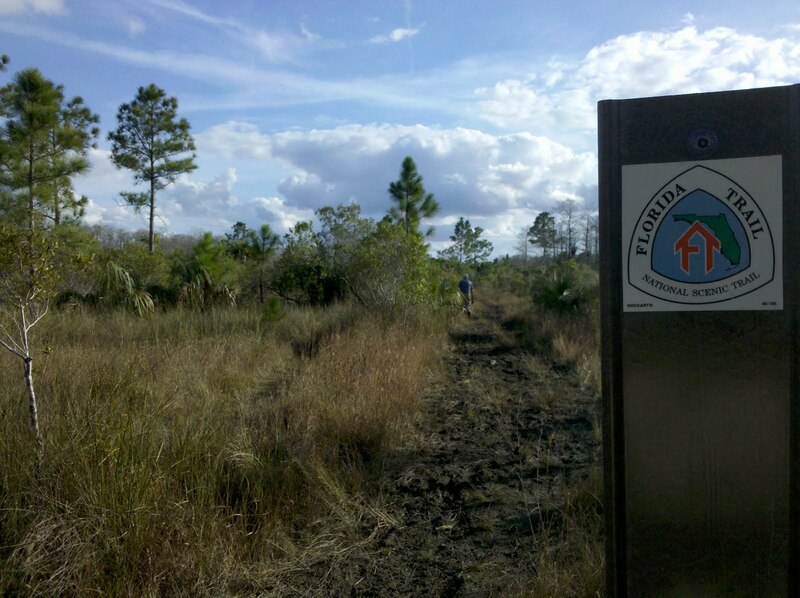 As it was getting close to the time that we needed to head back to the car we discovered the real entrance to the preserve, where the newly opened Polk Nature Discovery Center gave us the opportunity to pick up the trail map and brochure that we wished we had when we first started. 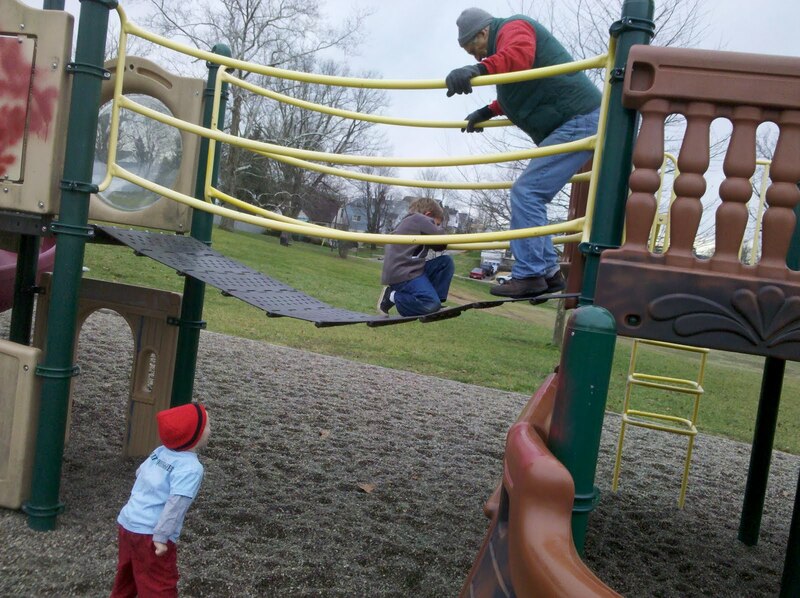 This was one of our best park visits and it didn’t even charge a fee! Thursday afternoon, Gene and Mary Jane promised to show us a special treat if we came with them on a drive to Plant City. 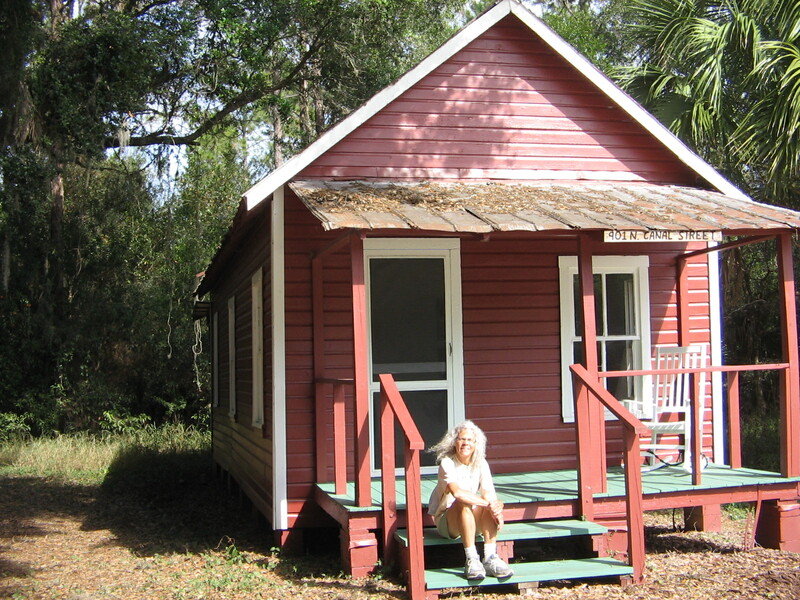 Plant City is the strawberry capital of Florida. People come from everywhere to the Parkesdale Farm Market in Plant City to buy fresh produce and sample their famous strawberry shortcake. We were not disappointed. It was delicious strawberry shortcake, indeed. 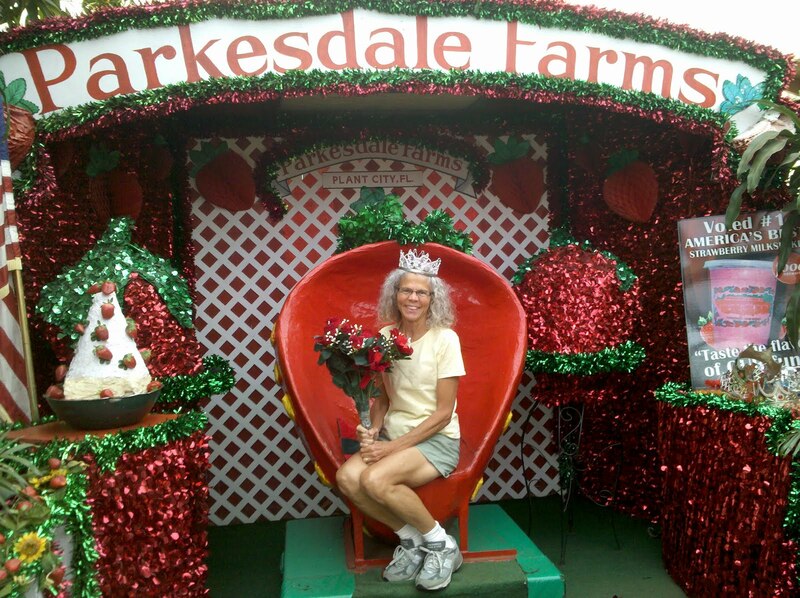 And Barbara got to sit on the throne and pretend that she was Strawberry Queen for a day. Gene and Mary Jane after enjoying strawberry treats. 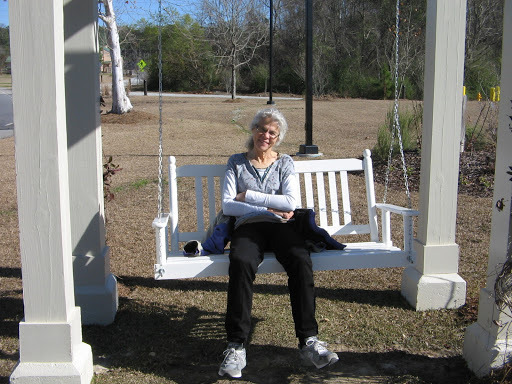 It is with fond goodbyes that we depart Lakeland, hoping to come back soon and maybe even to see Gene and Mary Jane again before they head back to Virginia at the end of their winter stay in Polk City. 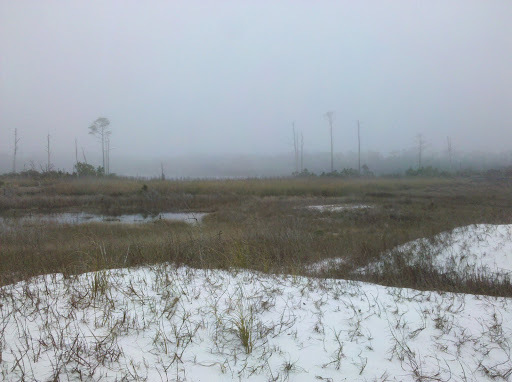 We were getting spoiled by this winter’s drought conditions in Florida, fooling ourselves into thinking that every day was going to be sunny and warm. On Monday evening this week we experienced the first rainfall of our time here. It didn’t rain on Tuesday, but that day was a first because it was a day when the sun remained behind clouds and never appeared the whole day. The weather front that brought the rain has been followed by some cooler temperatures. 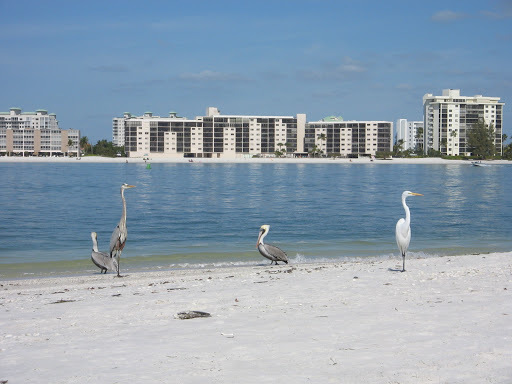 We are having to adjust our “sunny and warm” expectations a bit, but the weather is still plenty warm enough for our continued enjoyment of Florida outdoors. 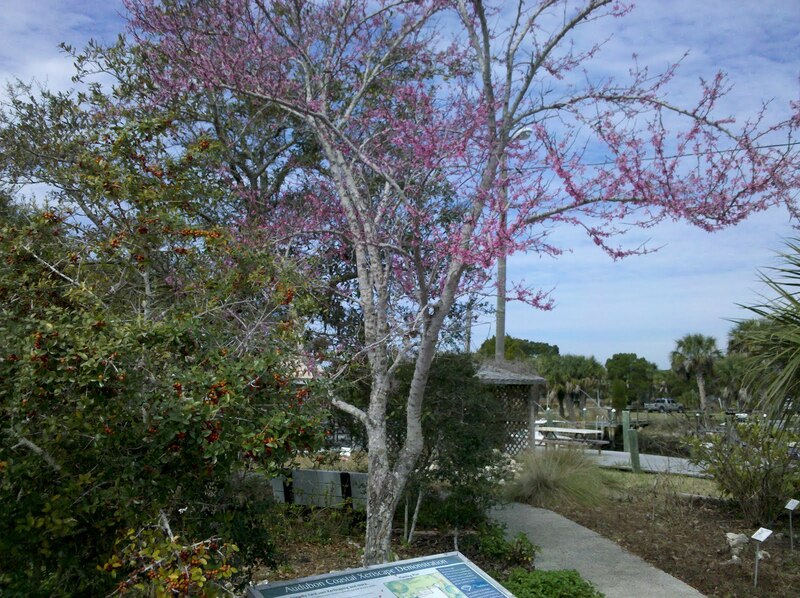 We have seen signs of spring, such as this redbud tree, which we would not expect to see in Virginia for at least another 6 weeks. 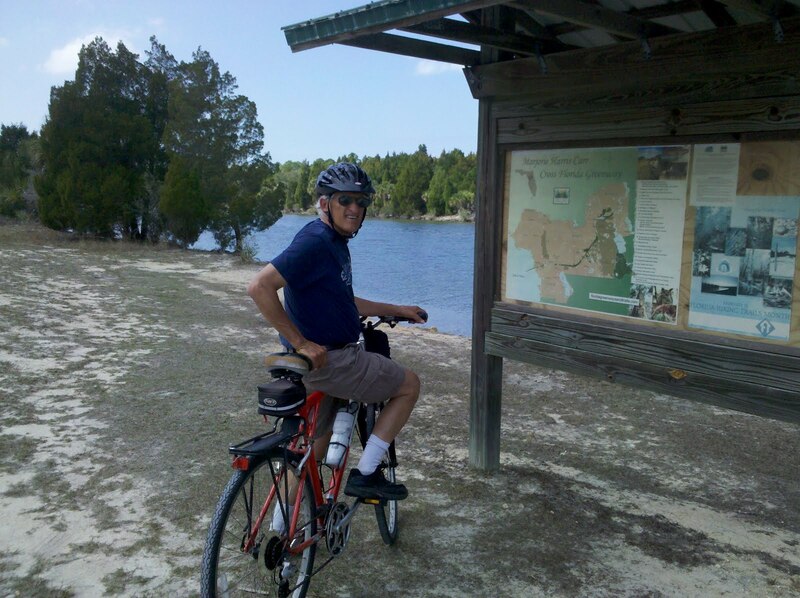 So far this week we have visited a couple of state parks, checked out one bike trail and walked some trails in nearby Ocala National Forest. 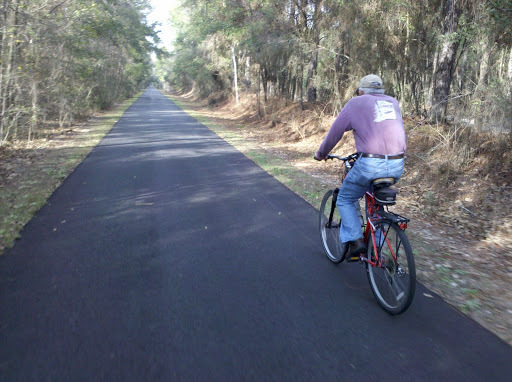 The bike trail was a small piece of the Cross Florida Greenway trail that stretches from the Gulf of Mexico to the St. Johns River. 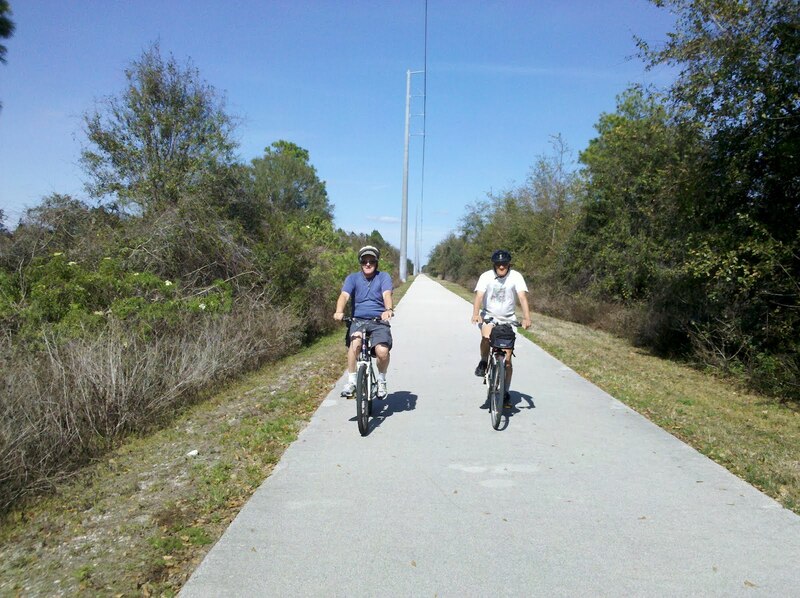 Most of the Greenway is unpaved and more suitable for off-road cyclists. We drove to Inglis to ride the one section that is asphalt. 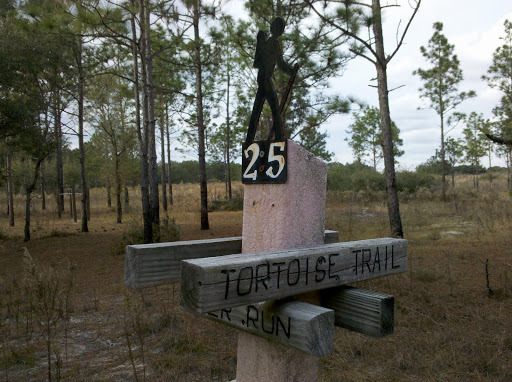 It traverses 5 miles west to the Gulf of Mexico, paralleling the former Cross Florida Barge Canal. 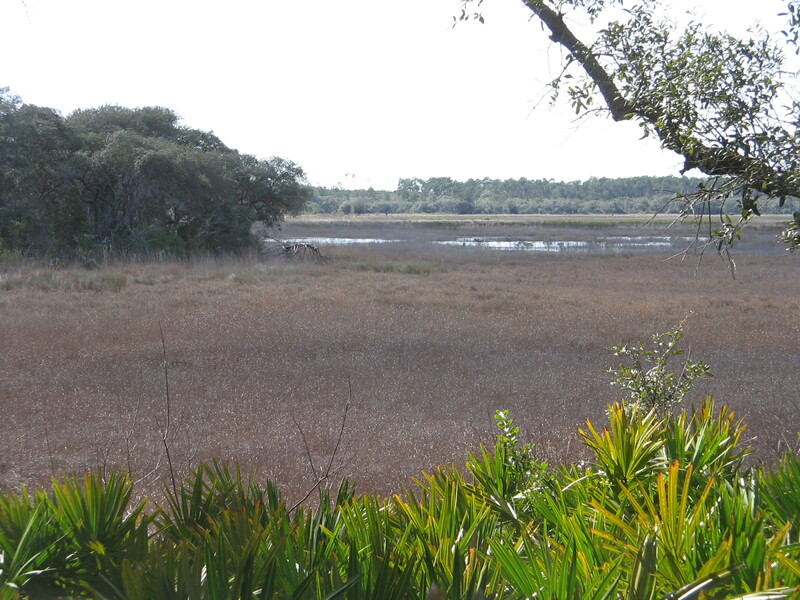 Viewing platform into one of the salt marshes along the trail as it approaches the Gulf. 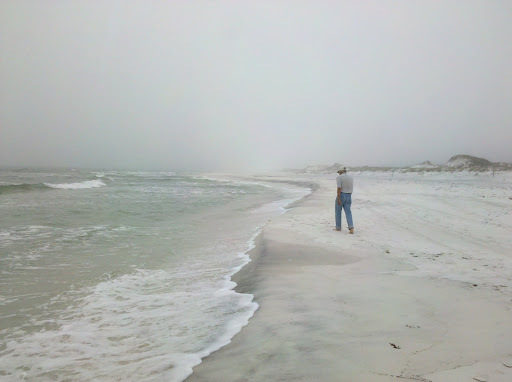 The end of the trail at the Gulf of Mexico. 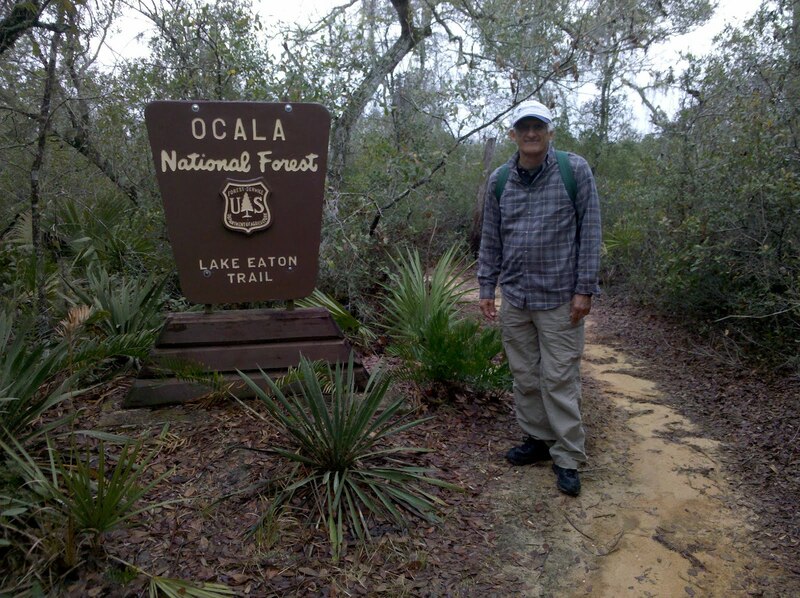 Our exploration of the Ocala National Forest started at the northwestern section nearest Ocala and included driving across the northern section to Salt Springs on the northeastern side. 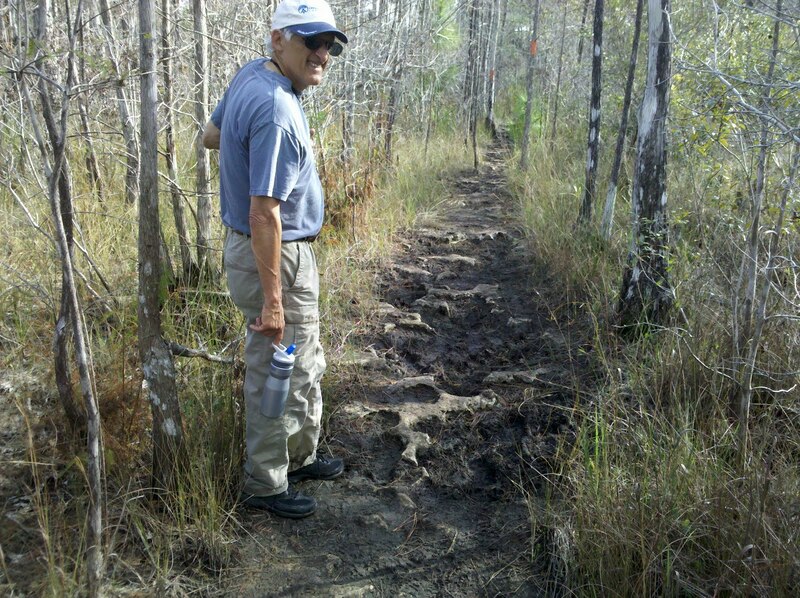 Along the way we stopped to walk the 2-mile Lake Eaton Sinkhole Trail, followed by the adjoining 2-mile trail that led to Lake Eaton. 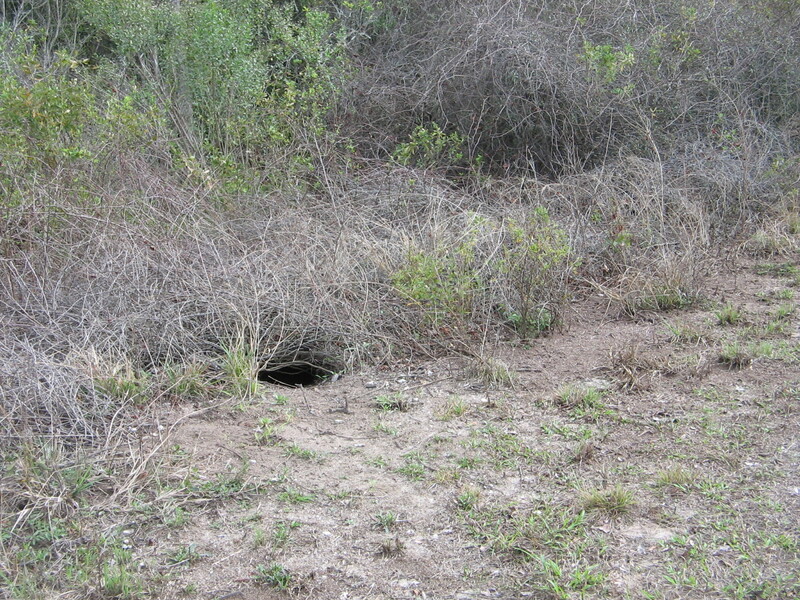 The sinkhole is an 80 foot deep, 450 foot wide dry sinkhole. 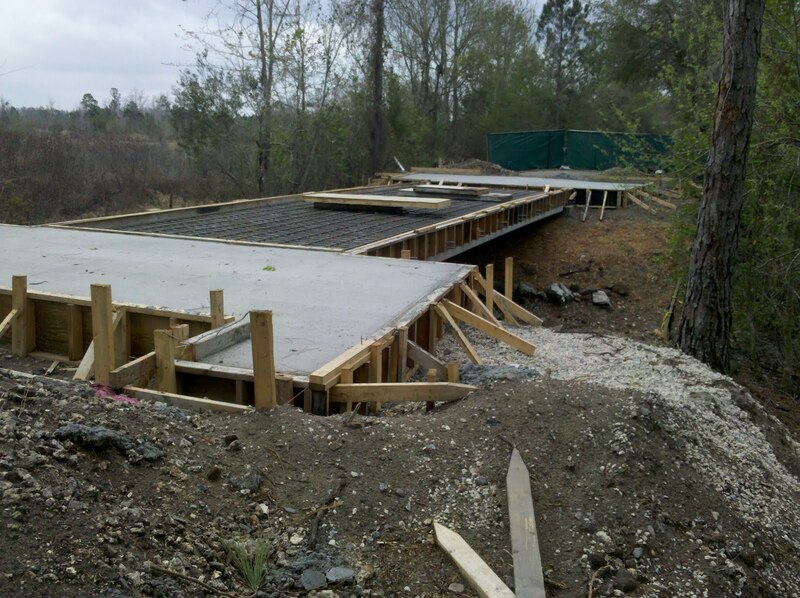 An observation deck allows a view of the sinkhole and there are stairs leading down into the sinkhole. 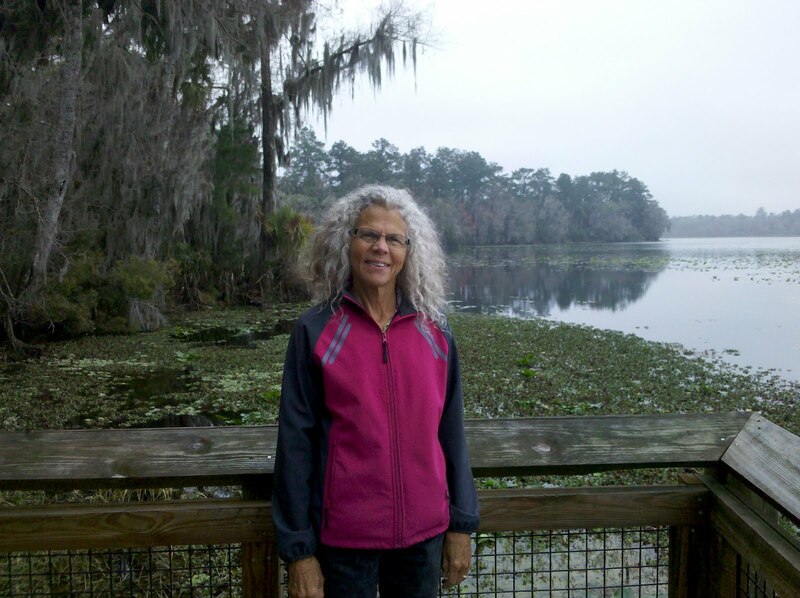 We learned how sinkholes are formed and read that Lake Eaton, as many of Florida’s lakes, is itself a sinkhole that has filled with rainwater. 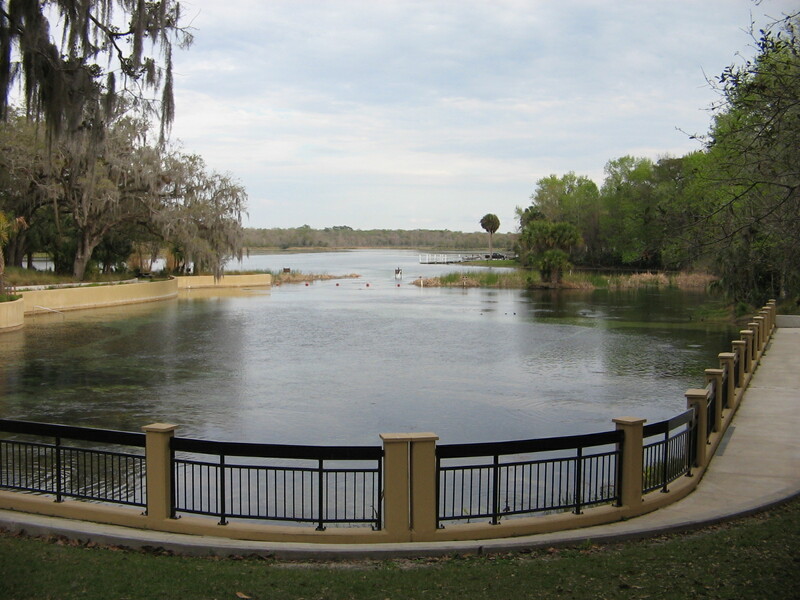 One of the viewing platforms at the edge of Lake Eaton. 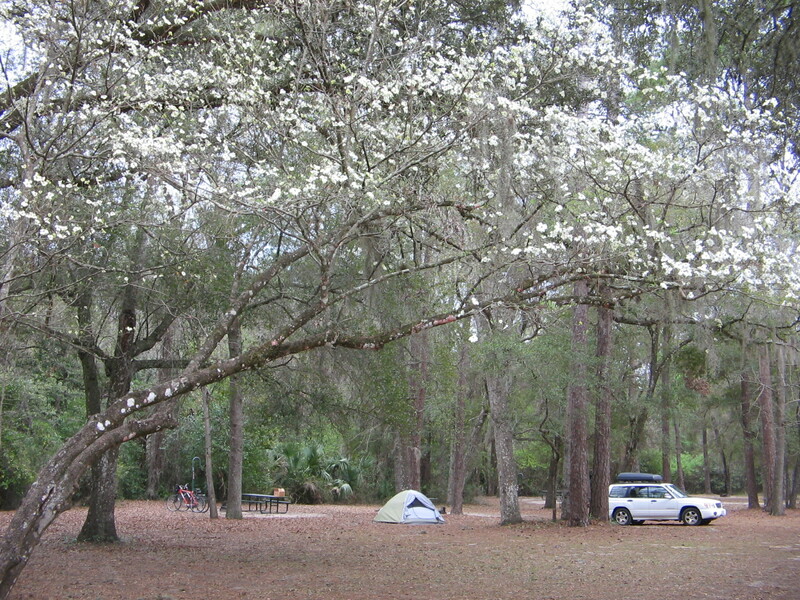 When we were in Salt Springs we looked at the campground there and noted that it would be a good location for a couple of days of camping next week, if the weather permits. 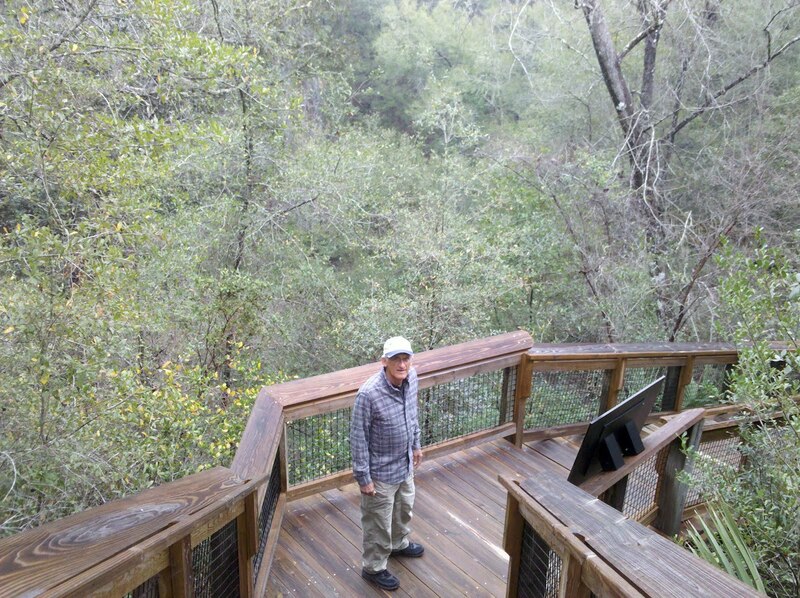 We found a trail outside of town that led to a wildlife observation platform on Salt Springs Run. 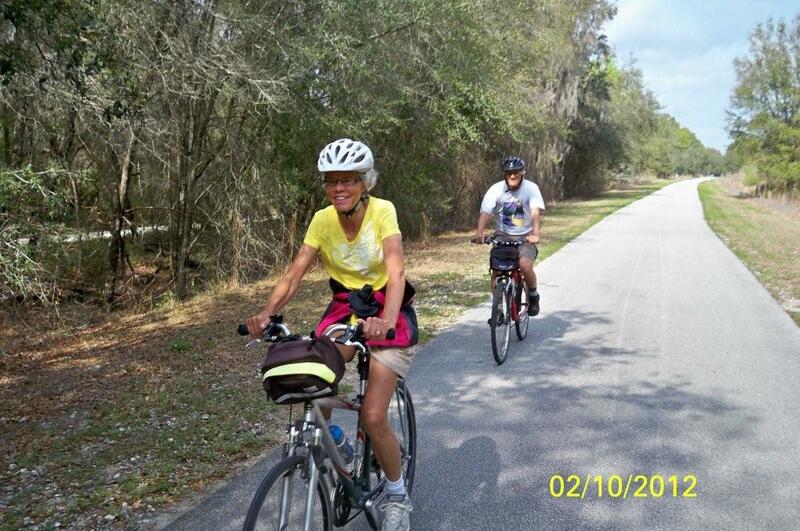 Yesterday found us driving once again to the west of Ocala. 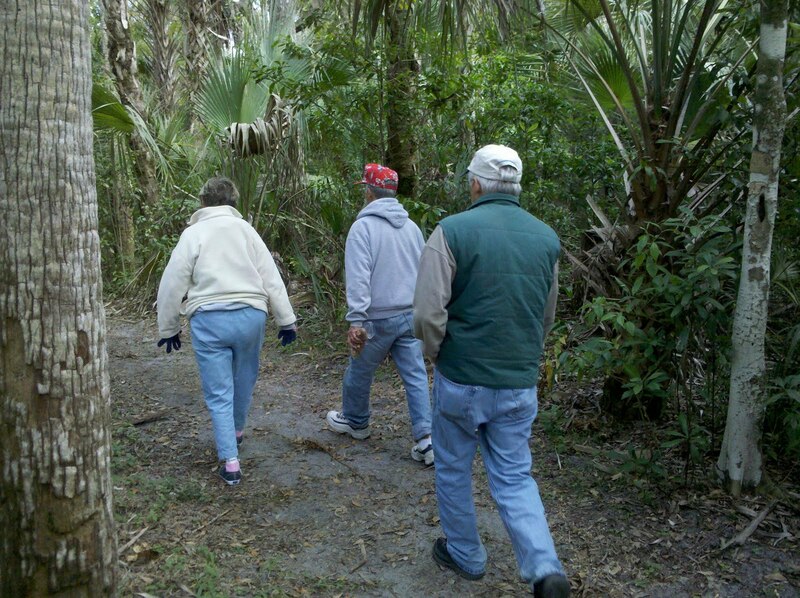 Our first stop was at the Crystal River Preserve State Park. 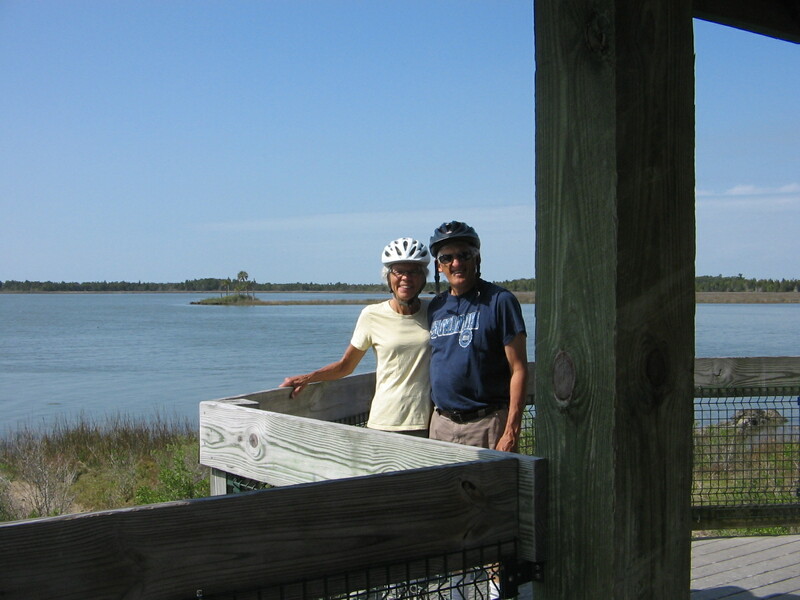 We found a 7-mile loop trail that was suitable for bikes and allowed us to see the variety of habitats that are within the preserve area. 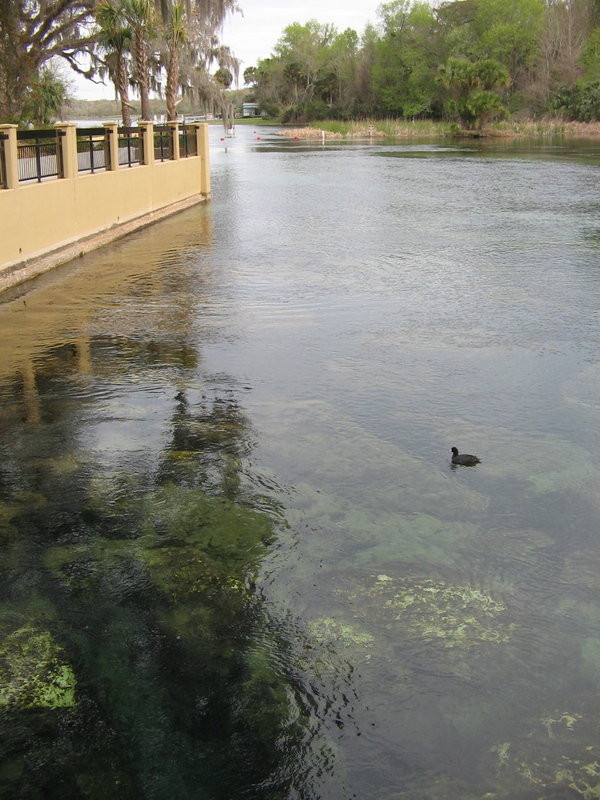 The Homosassa Springs Wildlife State Park that we visited next was not the type of park that we are used to seeing. 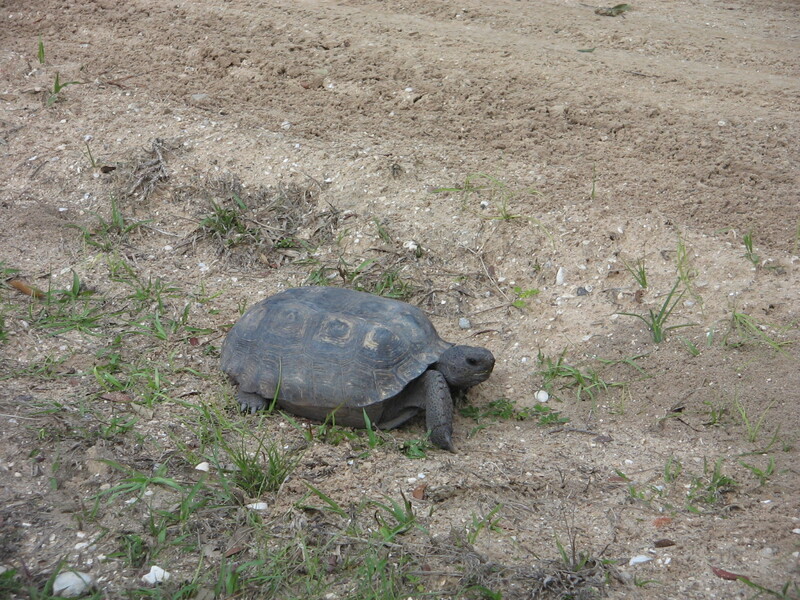 The park’s mission is to showcase native Florida wildlife, but not wildlife that is living “in the wild.” Most all of the animals have been rescued and rehabilitated from situations where they would not have survived if left in the wild. 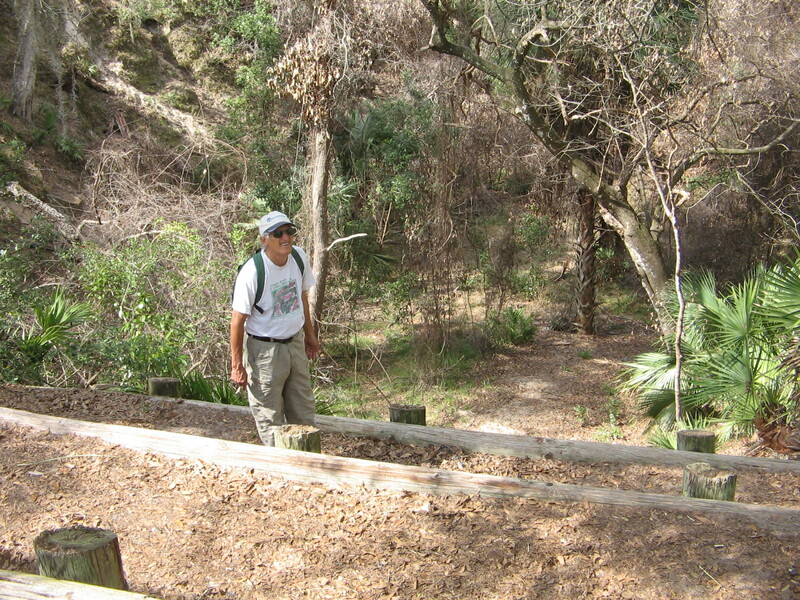 Walking around the park is similar to the experience of visiting animals in the zoo. But it is a beautiful environment and an educational experience. 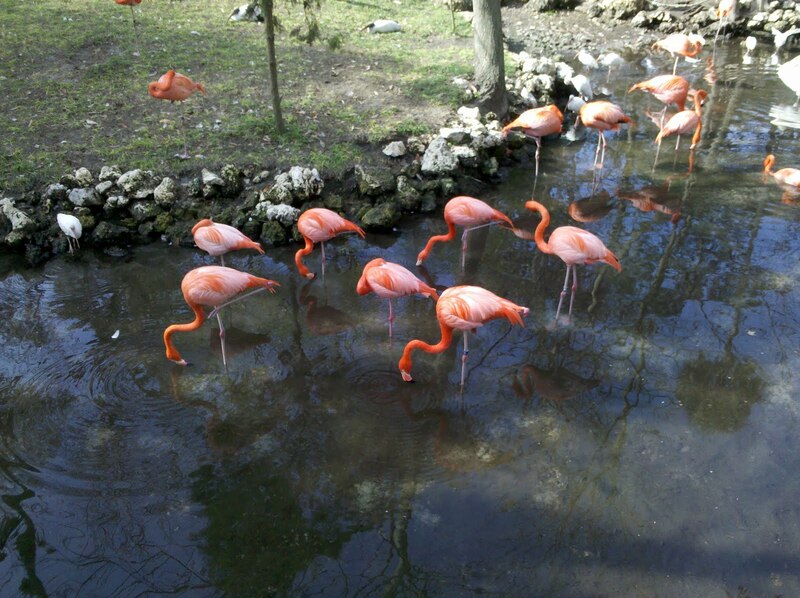 I’m not sure where else, besides as plastic lawn ornaments, we would have been able to see flamingos. 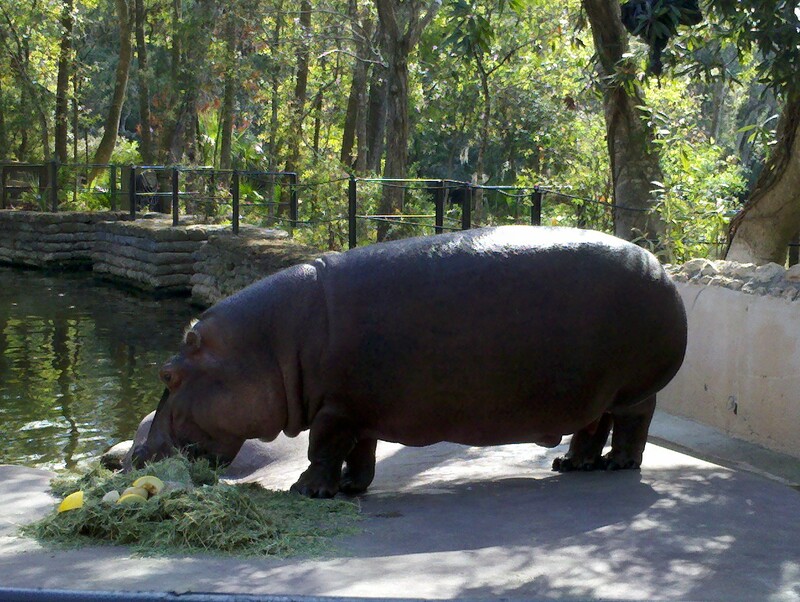 My favorite “wildlife” sighting was at feeding time for Lu, the resident hippopotamus. 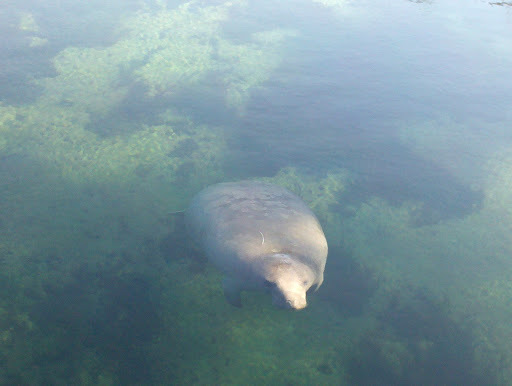 Nice to see a huge, lazy munching critter that was not a manatee. In fact, the story of Lu and how it fits into the park’s history, is quite interesting. In the 1960’s the original development of the park was as a privately owned tourist attraction to house exotic animals like lions, tigers, monkeys, etc. 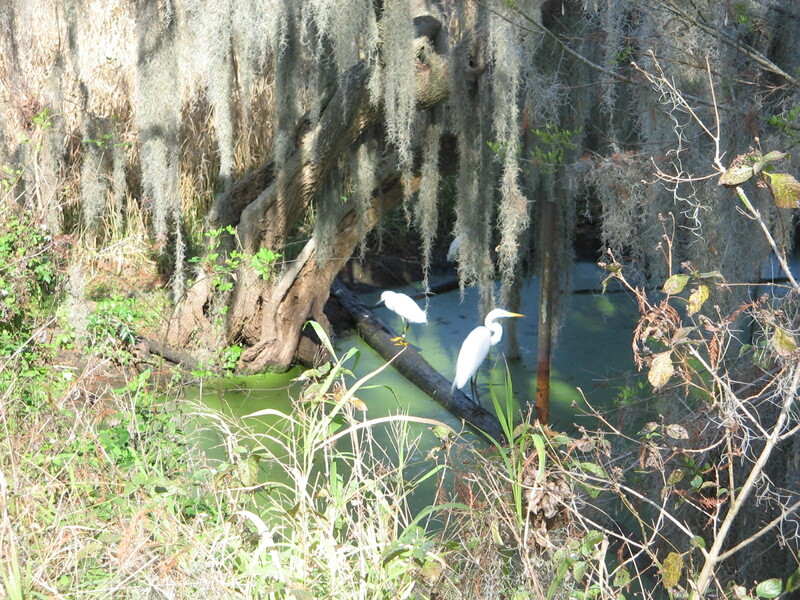 When the state bought the property for a park in the 1980’s the intention was to only have animals that were native to Florida; new homes had to be found for all the animals that were not native. Unfortunately, no home could be found for poor, old Lu, the hippopotamus. 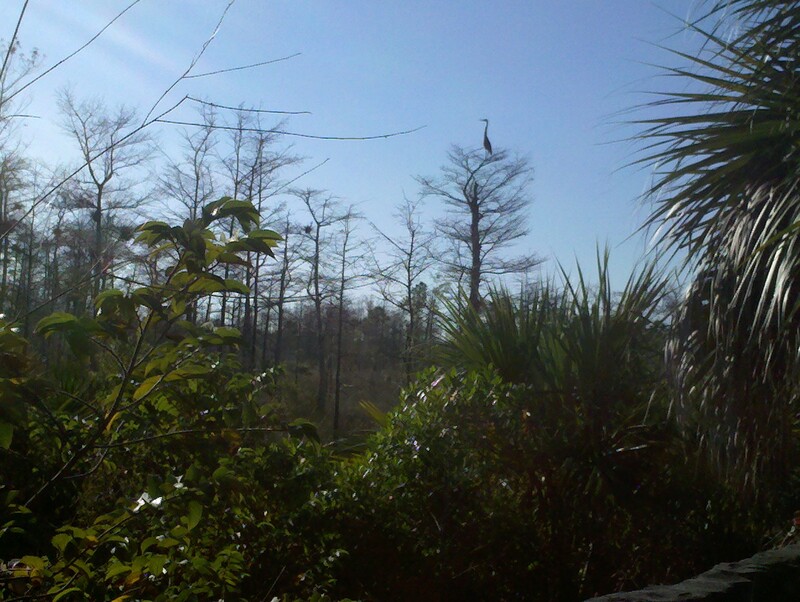 Hundreds of local residents sent letters to Florida’s governor, asking him to allow Lu to remain at the park. The kindhearted governor came up with a way to make it possible for this African beast to remain in a park that is for Florida wildlife. 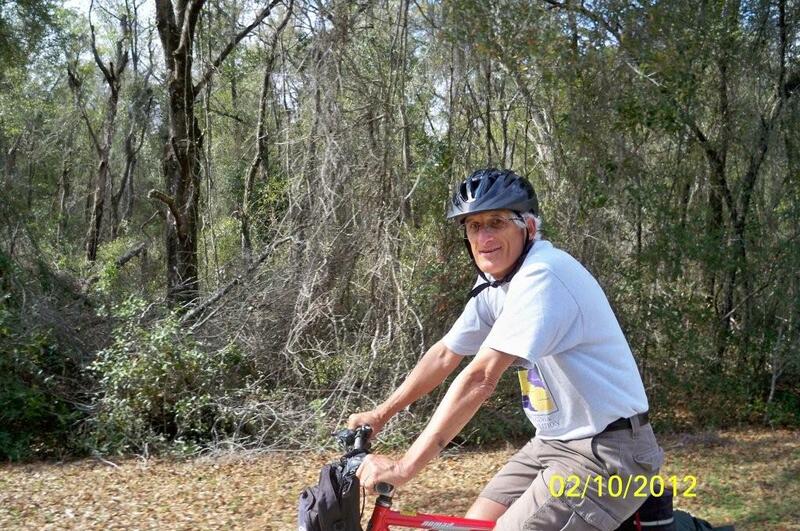 Lu was declared to be an Honorary Citizen of the State of Florida so he could live out his days at the park. 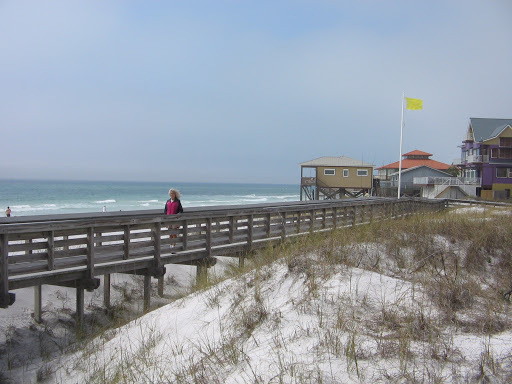 Even with the occasional cool and overcast day, I think living out your days in the beautiful state of Florida sounds like a pretty good way to go. But with many travels and adventures that await us in the months ahead it remains to be seen what state Lee and I will end up calling home. Literally, it’s freezing. Last night and the night before the temperature here in Ocala dropped down to a frigid 26 degrees. I know, for those of you in the Midwest and Northeast that’s not cold at all. But our blood has thinned since we’ve been down here and I didn’t expect to go out and have to scrape frost from the windshield of the car while in Florida. 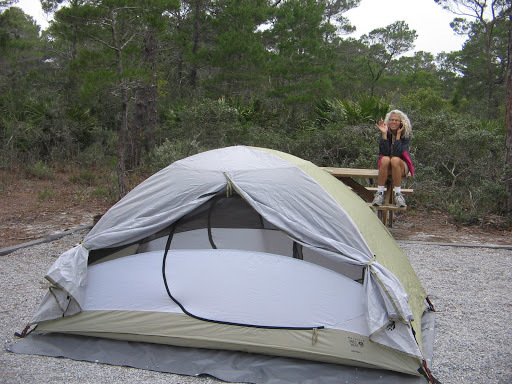 One thing for sure, I’m glad that we are in a warm hotel room and not out in a tent in the Ocala National Forest. 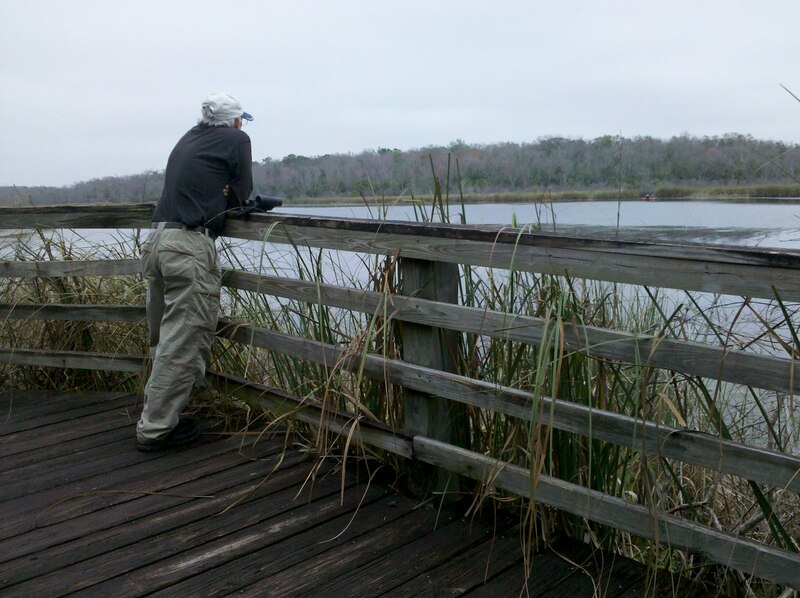 Given the weather conditions, we have temporarily delayed our plans to camp and have been spending more time investigating outdoor activities in the Ocala area. 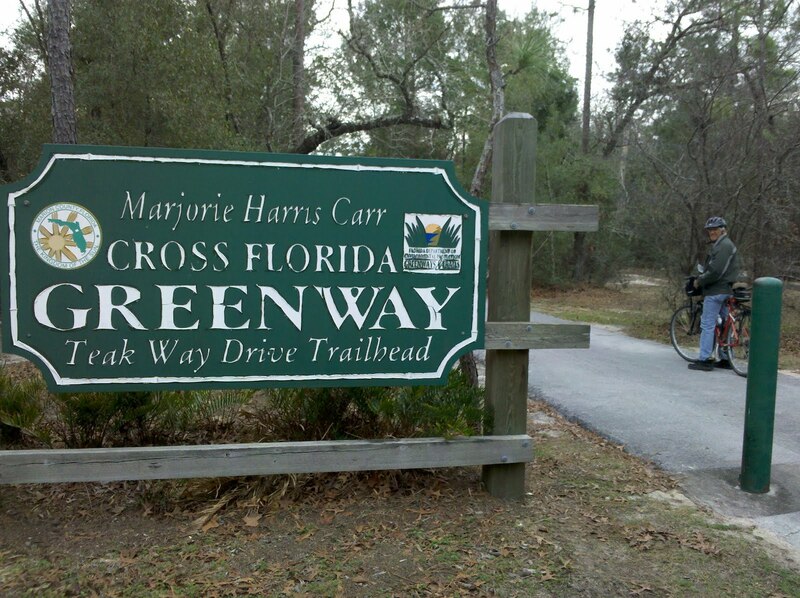 The Cross Florida Greenway trail has a section that passes through Ocala. 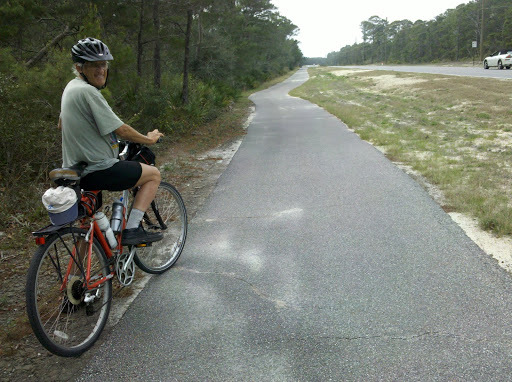 One day last week, looking at a map, we were able to find a way to ride our bikes from the hotel room to the Teak Way Drive Trailhead. 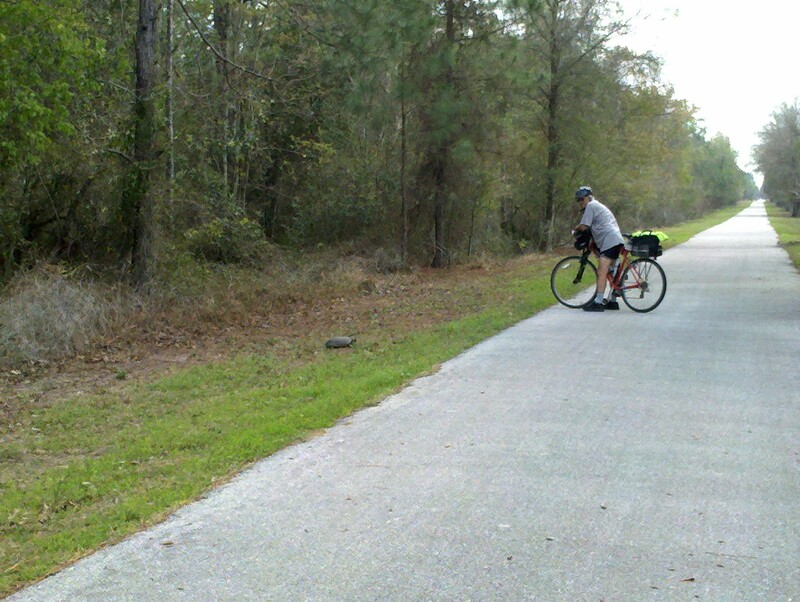 This area of the Greenway has a 3 mile unpaved hiking section through the Marshall Swamp, as well as a section of 3 paved loop trails that we could ride our bikes on. 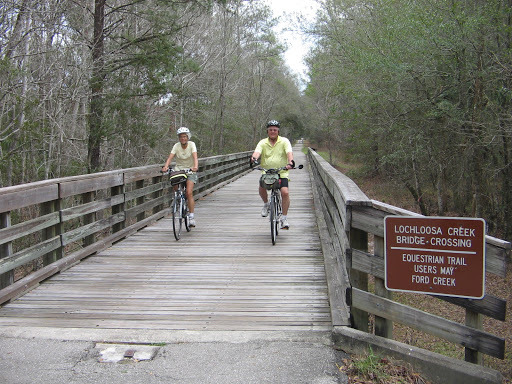 In contrast to the 110-mile Greenway trail, which is mostly unpaved the Withlacoochee State Trail, at 46 miles, is the longest paved trail in Florida. 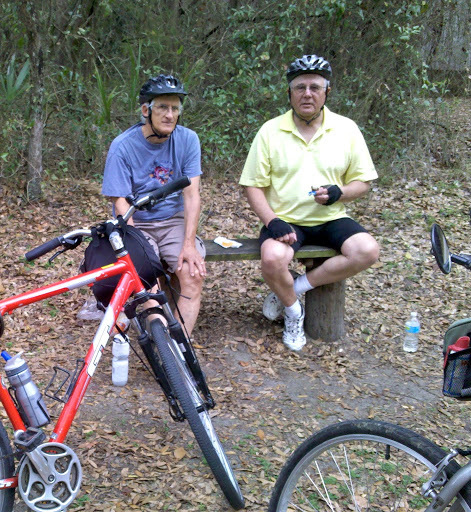 The Citrus Springs trailhead is about an hour’s drive from Ocala and the day that we did some biking there we were joined by our friend, Jerry. 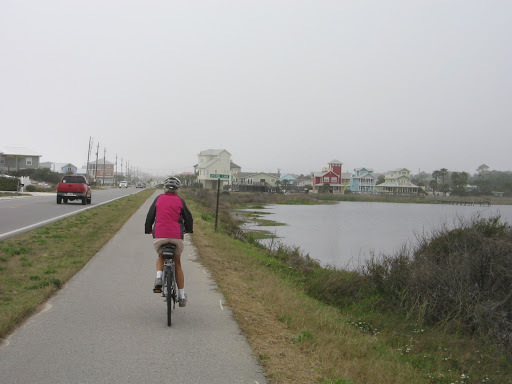 We weren’t prepared to do the whole trail, but, instead pedaled 16 miles south to Inverness, where we had lunch downtown, before pedaling back. 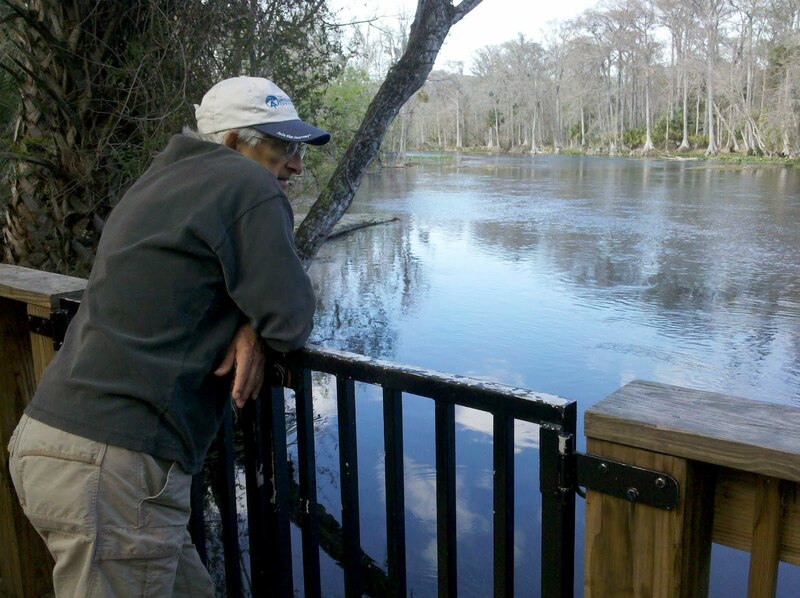 When we were here in January we had made a short visit to the Silver Springs State Park that is just outside Ocala. It was late in the day and we only had time to hike a short trail before the park closed. Also, it is only on weekends that the museum at the park is open to visitors. 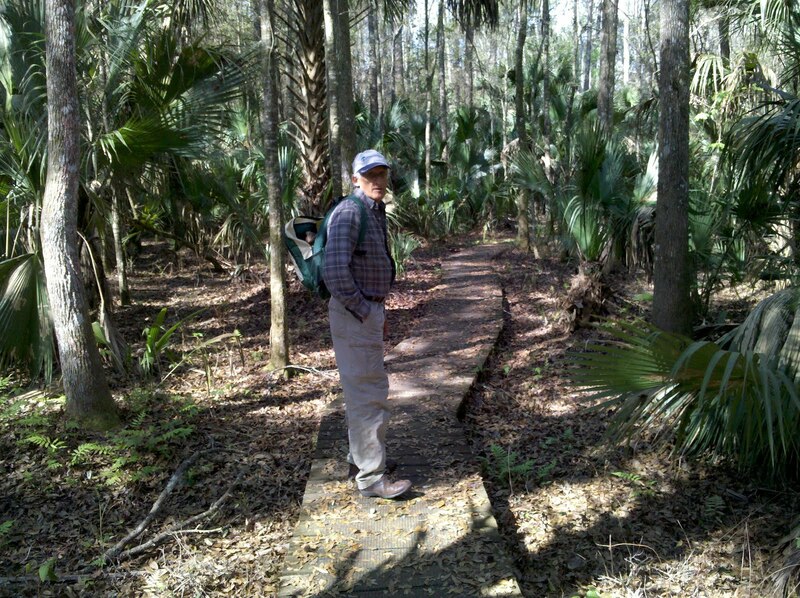 So on Saturday we made another visit, which allowed us to tour the museum and walk a couple of other trails. We learned more about the Silver Springs area at the museum and were especially interested in the information about films and TV shows that were made here over the years. These included six of the original “Tarzan” movies filmed in the 1930s and 1940s, “The Yearling,” starring Gregory Peck and Jane Wyman that was filmed in 1946, “The Creature from the Black Lagoon” in 1954, and more than 100 episodes of the famous television series “Sea Hunt,” that starred Lloyd Bridges. Silver Springs is the site of one of the largest artesian spring formations in the world, producing nearly 550 million gallons of crystal-clear water daily. 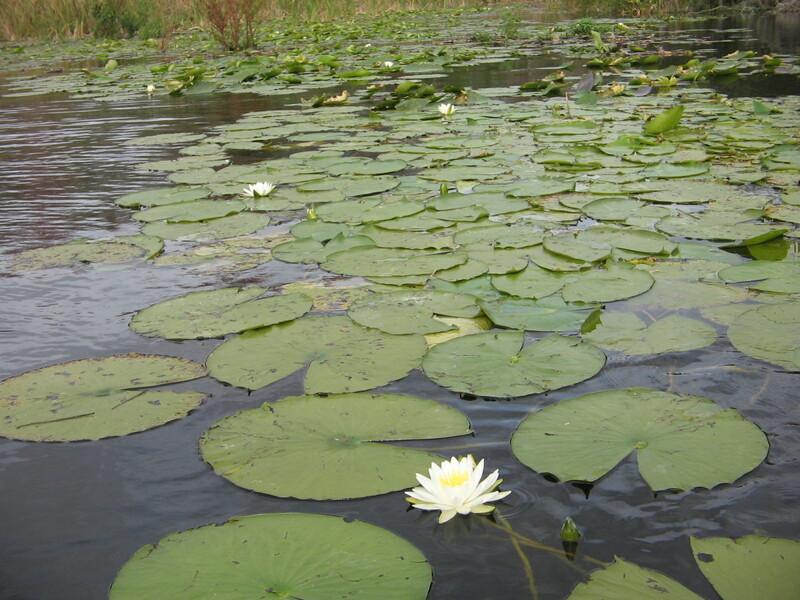 In the mid-1800s tourists flocked by steamboat to see the crystal-clear waters of Silver Springs. In 1878 when Hullam Jones invented the glass bottom boat, its popularity soared, laying the groundwork for a flourishing tourist industry here. In the 1920s, Carl Ray and W.M. 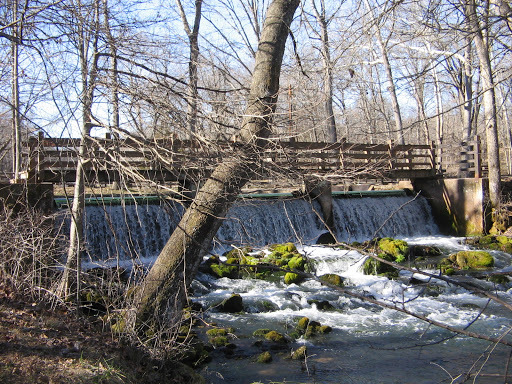 Davidson made the land around the headwaters of the Spring into something resembling the attraction that is there today, now known as the Silver Springs Nature Theme Park. 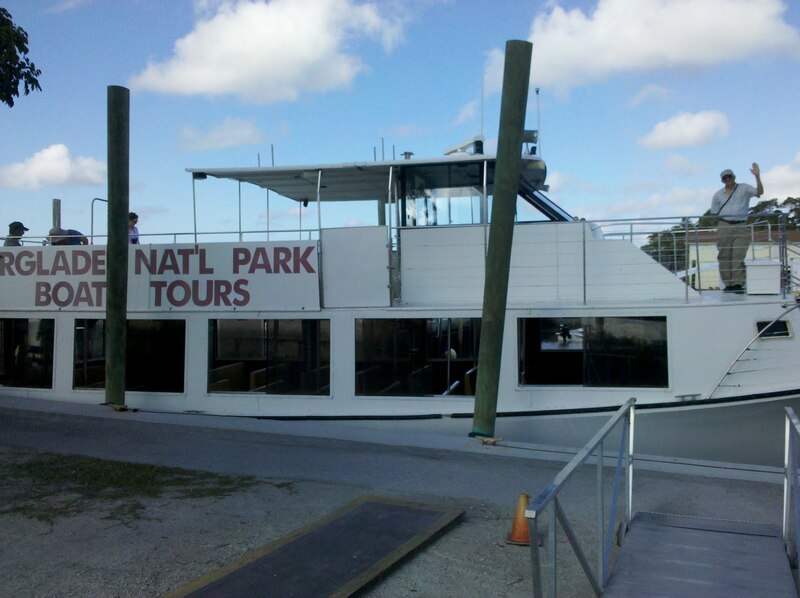 The attraction features native animal exhibits and glass bottom boat tours of the springs. Since it is a separate, privately-owned concession, with a steep price tag we did not go to the theme park. 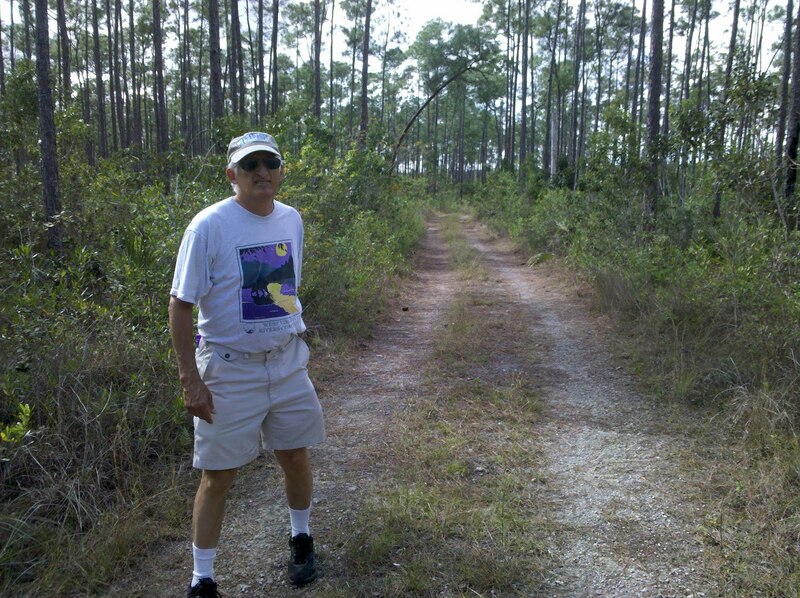 Instead, we walked a couple of the trails that we hadn’t seen when we were first here. 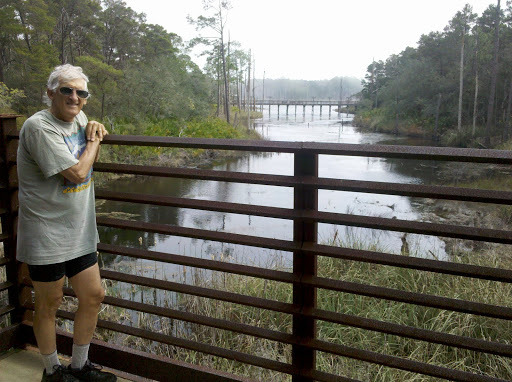 At the end of the Swamp Trail a viewing platform allowed us to peer over into Silver River, where we got a sense of the beauty of this clear water that allows you to see the sandy bottom, and many fish swimming through the grass and reeds. 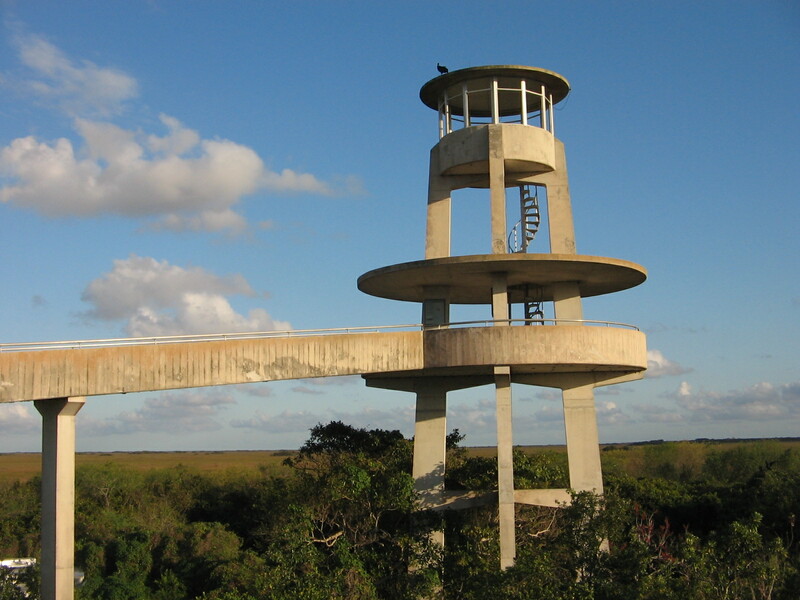 The viewing platform was the one spot where we also finally saw some wildlife. 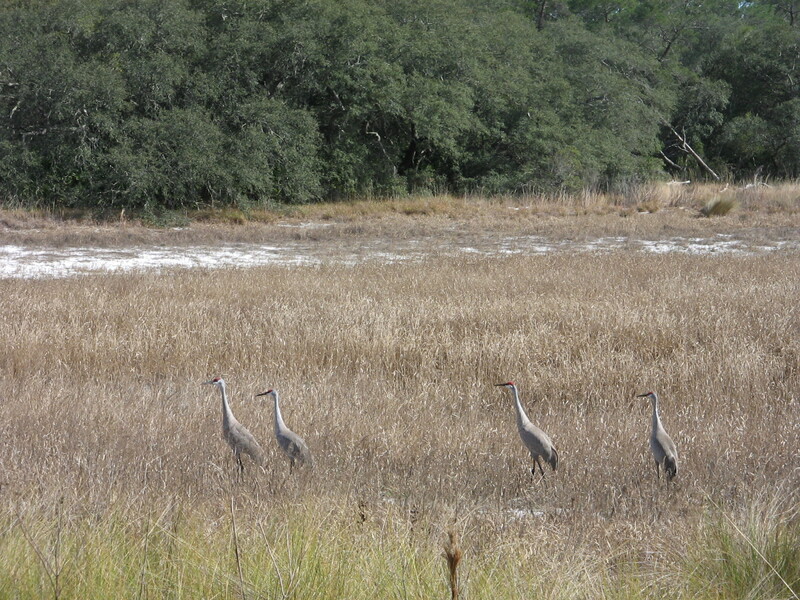 Since leaving the southern part of Florida we haven’t seen many birds or other creatures of interest. 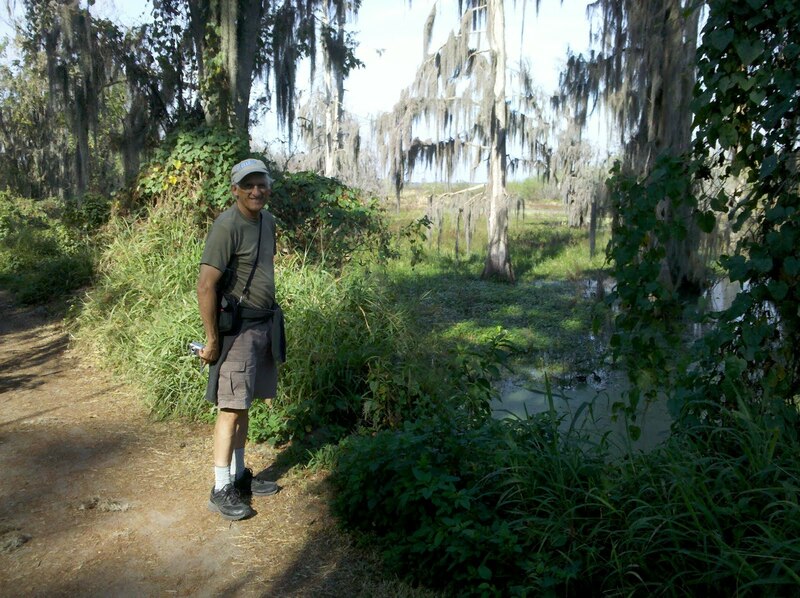 On the platform we saw an alligator, a great blue heron, ibises, turtles, cormorant, and many fishes. The other exciting viewing of the day was in the woods on the way back. 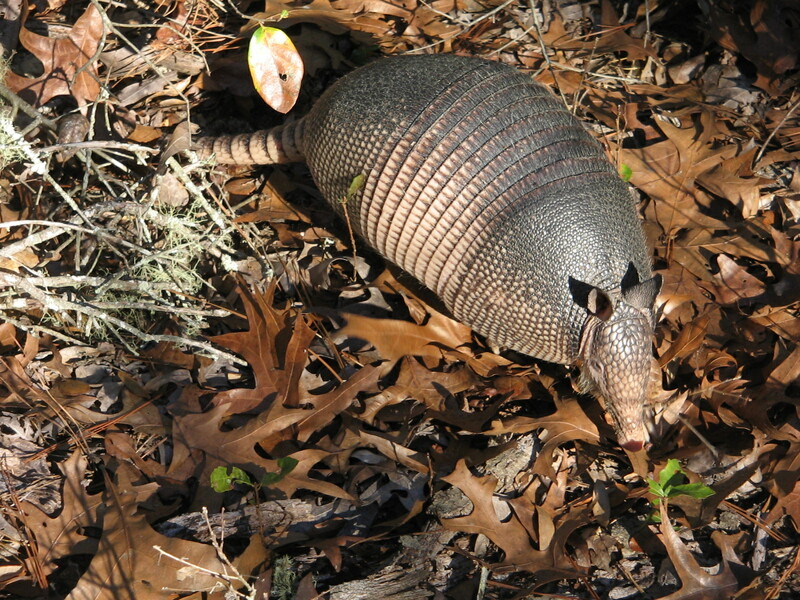 I had heard that there were armadillos in Florida but had only caught a glimpse of one from a distance. This time we came upon one that was so busy snuffling his way through the leaves looking for his lunch that he was oblivious to me standing there with my camera. I thought he might walk right over my foot. 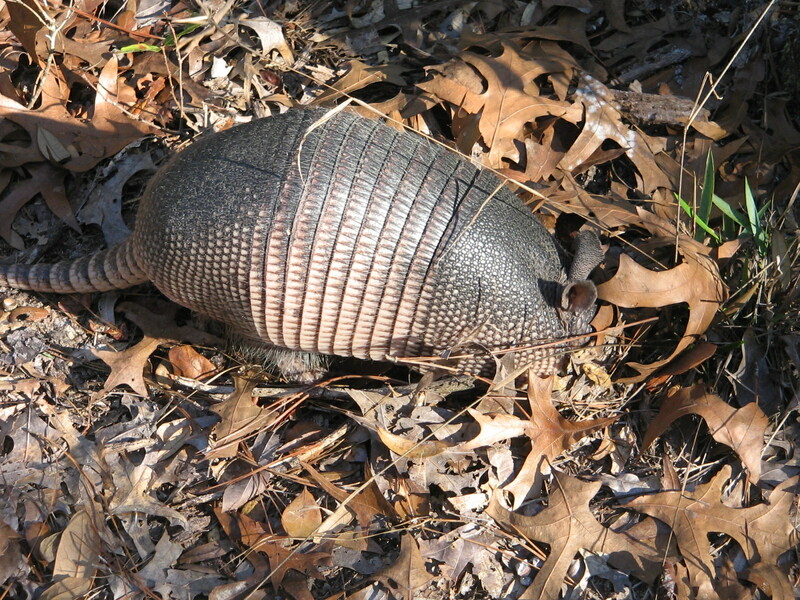 Armadillos don’t look like they can move very fast but when he finally became aware of our presence he scampered off in a flash. 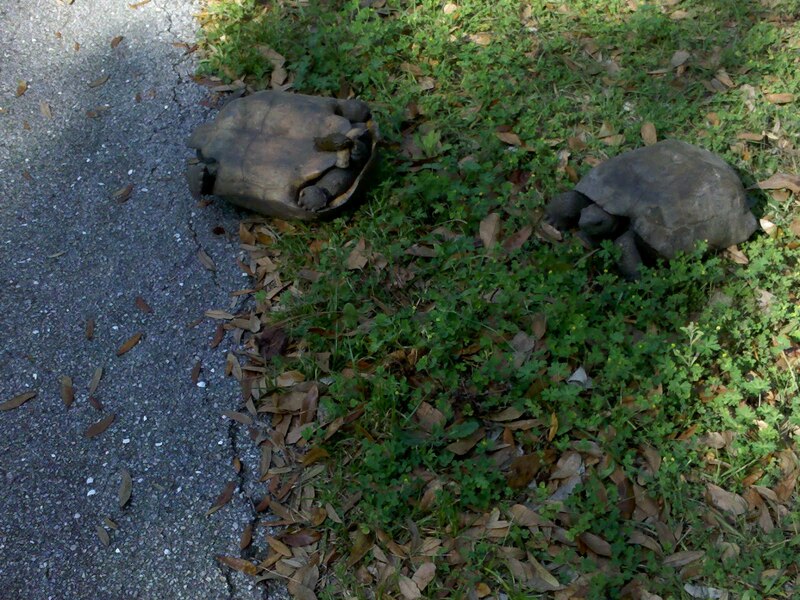 Now it’s time for us to scamper off and leave Ocala behind. We hear that the weather will warm back up to more normal temperatures in a couple of days. 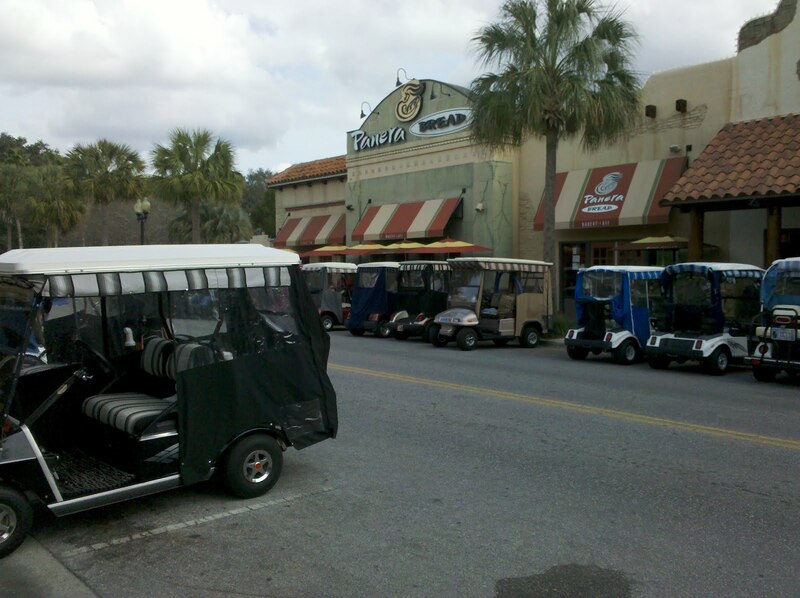 Until then we will continue to hotel and sightsee and then, depending on whether or not we have strayed too far from Ocala, we may circle back and do the camping we had hoped to do in the Ocala National Forest. This week it is not the reptilian, lazy black Florida Gators that we are amongst, but it is the famous Florida Gators intercollegiate sports teams here in Gainesville, home of the University of Florida. The orange and blue colors are everywhere and the university is central to the life of the town. 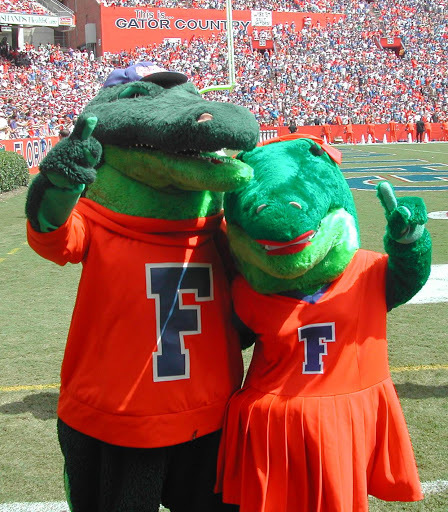 (Photo below of the mascots Albert and Alberta Gator is not a photo we took, but was found on the web). With a spell of rainy weather this week we have not ventured as much as usual on nature excursions, leaving more time for things like exploring the university campus. 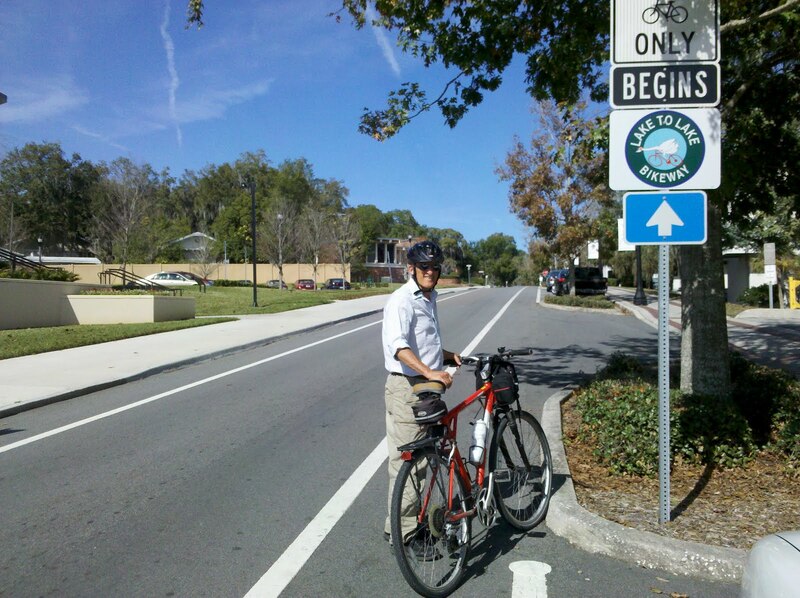 We have found that Gainesville is a bike friendly town and, although, our hotel is not close to downtown or the university, it is possible to ride our bikes there from the hotel. 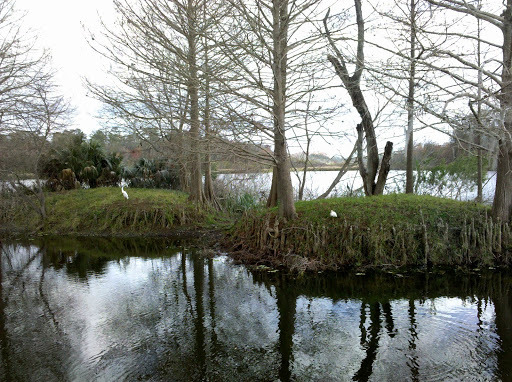 Lake Alice is a wildlife area in the center of the campus, a sanctuary for alligators (the reptilian kind) and birds. 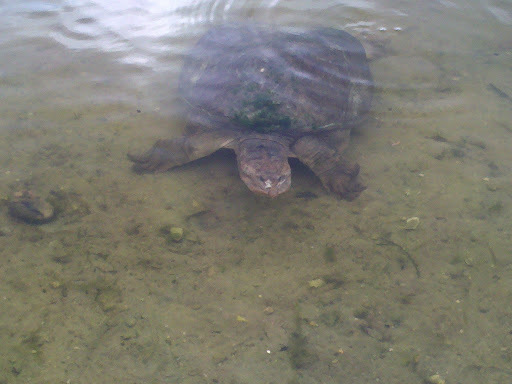 When we stopped at the lake we saw only one small alligator, but there were at least a half dozen, huge snapping turtles, floating near the shoreline competing with the birds and alligator for whatever food could be found. 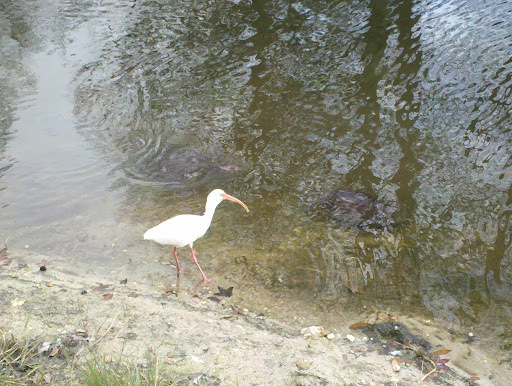 In the case of the ibis, the lunch we saw him gobbling down was a discarded french fry. I suppose that is typical food one would find in the middle of a college campus. 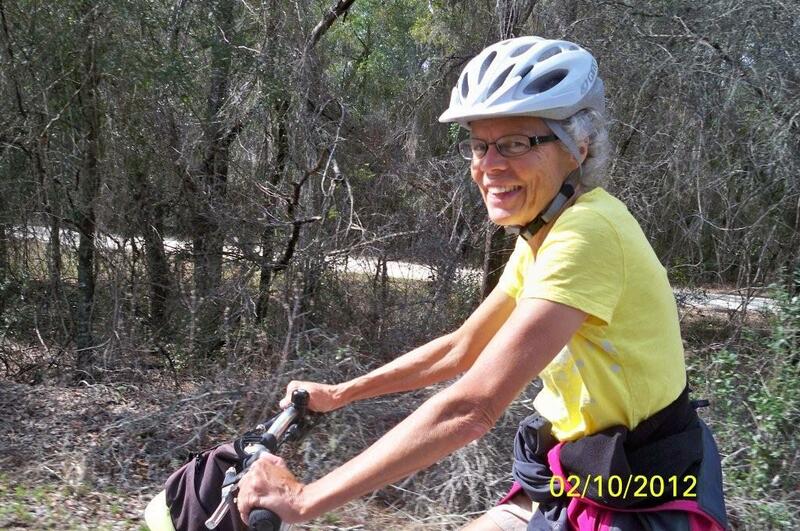 Yesterday was the best day of the week for bike riding. 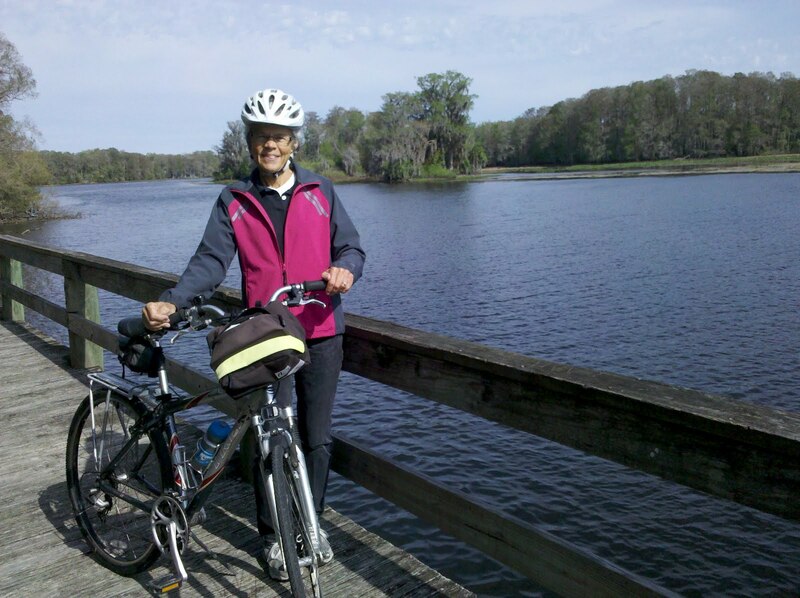 We did a 32-mile ride from Gainesville to Hawthorne (a nearby village) and back. 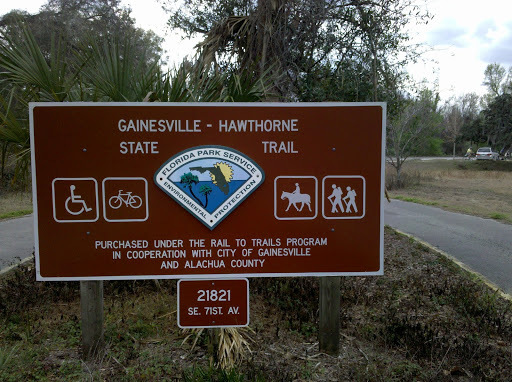 The Gainesville-Hawthorne State Trail that we used surprised us with a fun 2-mile stretch that had some hills and curves. 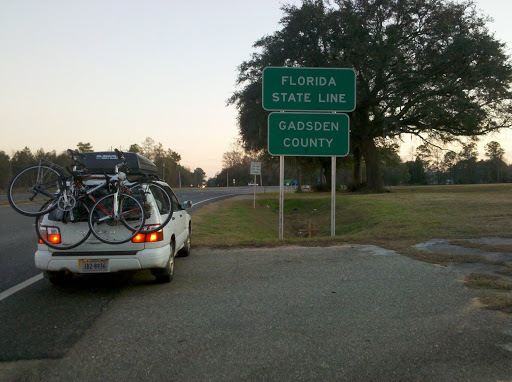 Up until this point, everything in Florida has been flat, but there are a few hilly areas around Gainesville. (“Hilly”, of course, being a relative term for those of you who ride in Oregon and Iowa). We were joined on the ride by our friend, Jerry. Although, I have been complaining about “rainy” weather, it is mostly clouds, sprinkles, and threat of thunderstorms. There has been very little accumulation of moisture. The evidence of the drought conditions is everywhere. None of the creeks along the way had water in them, including Prairie Creek, seen in this photo. 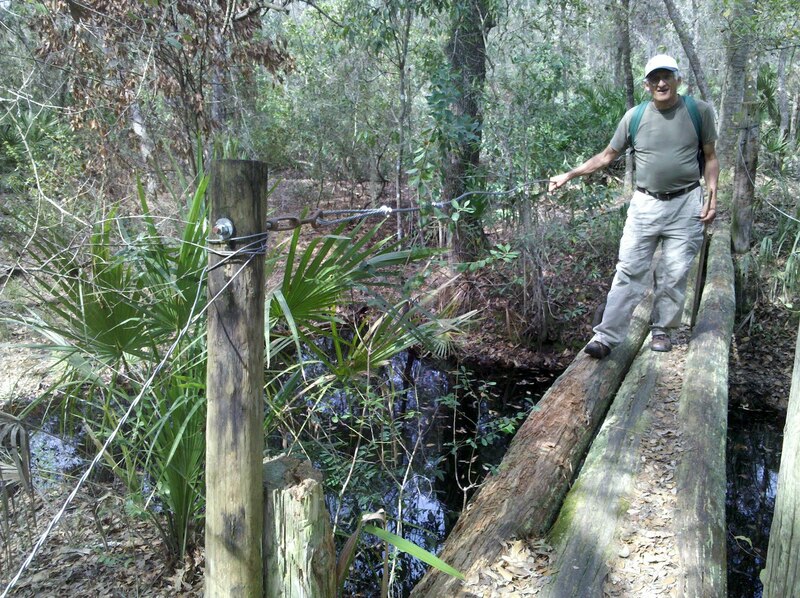 Jerry had been on this trail last January and said that the creek at that time had water in it and he had wondered how deep the creek was. The bottom is definitely visible now! Well, the sun is not visible now and, so far, it looks like today will be another drizzly day. But at least it is warm outside. 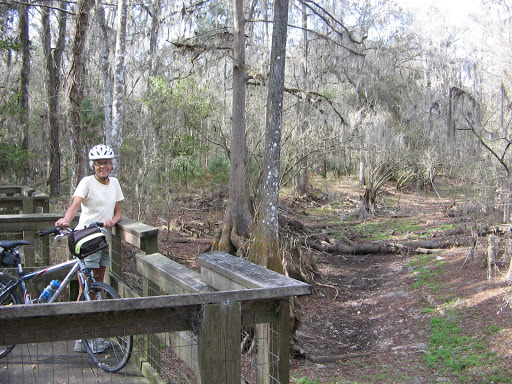 Maybe not a day for riding bikes but we still have some hiking trails in the area to explore. Time to get out the rain jackets and see what we can discover.